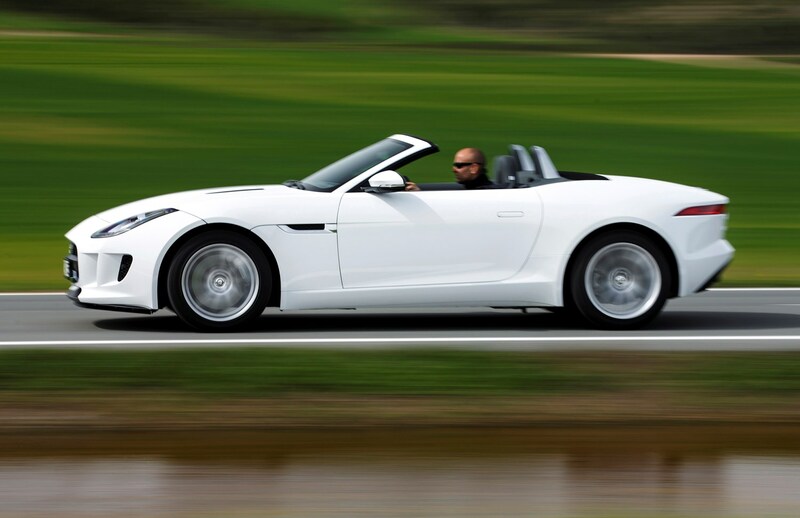 Regardless of whether you choose the entry-level 3.0-litre V6 (F-TYPE), mid-range 3.0-litre V6 Supercharged (F-TYPE S) or range topping 5.0-litre V8 (F-TYPE V8 S), Jaguar F-Type performance doesn't disappoint. 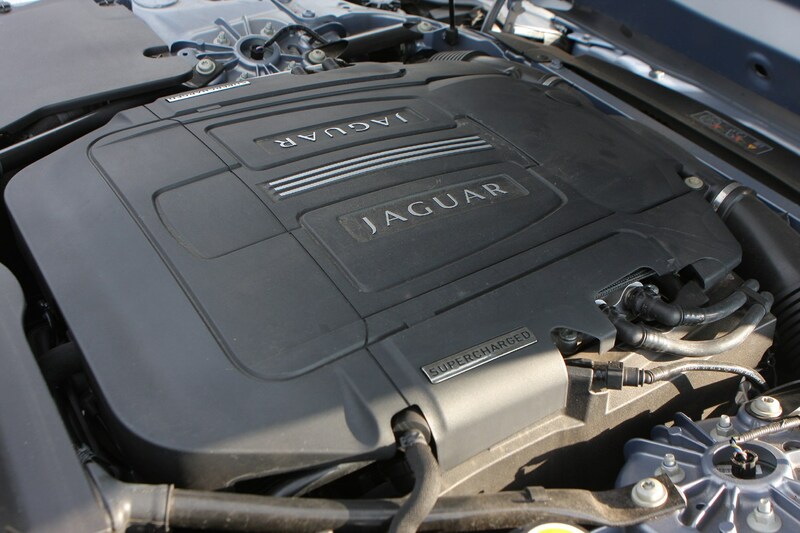 The entry-level 3.0-litre V6 provides a very satisfying drive thanks to strong pulling power and an engine that is willing to rev. 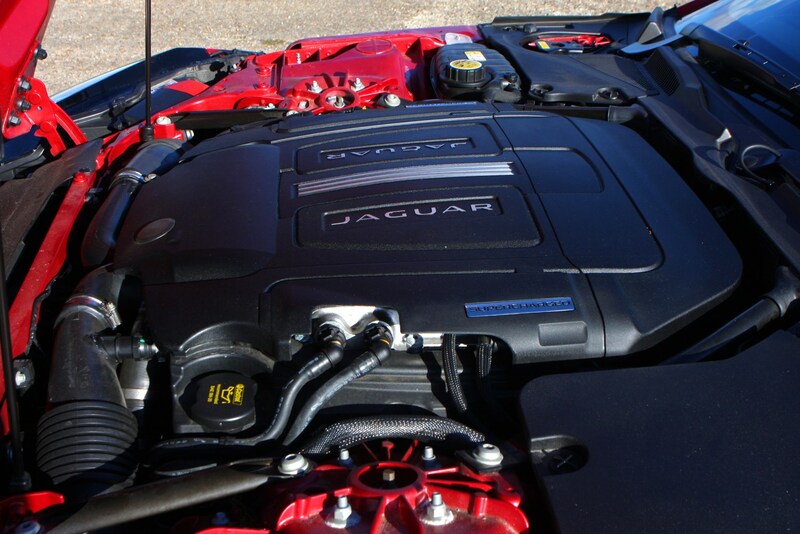 The six-cylinder engine packs 335bhp and 450Nm of torque, the latter helping drive the car hard out of corners. 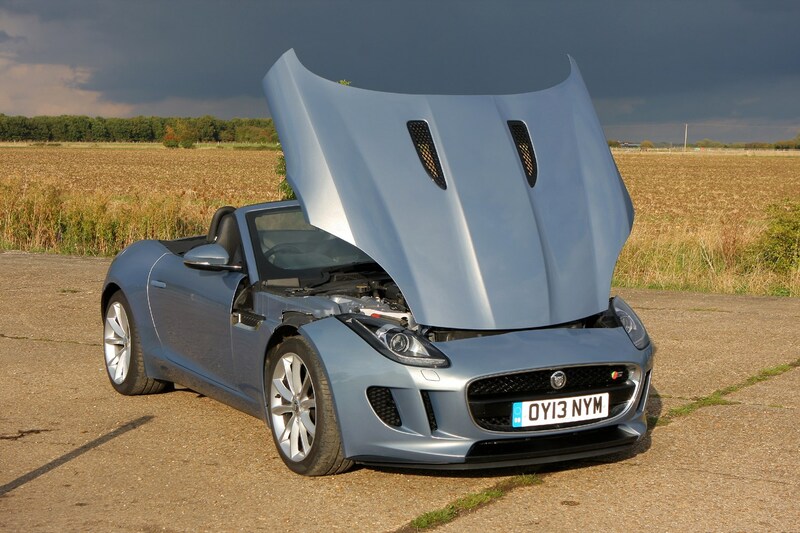 It can cover the 0-60mph dash in just 5.1 seconds and is capable of a top speed of 161mph. 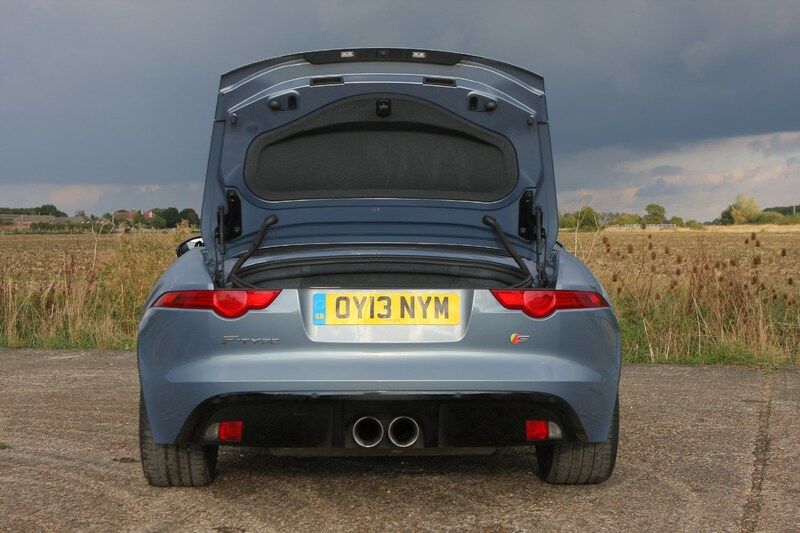 But it's the car's ability to overtake slower moving traffic with ease, rather than its outright acceleration, that really impresses. 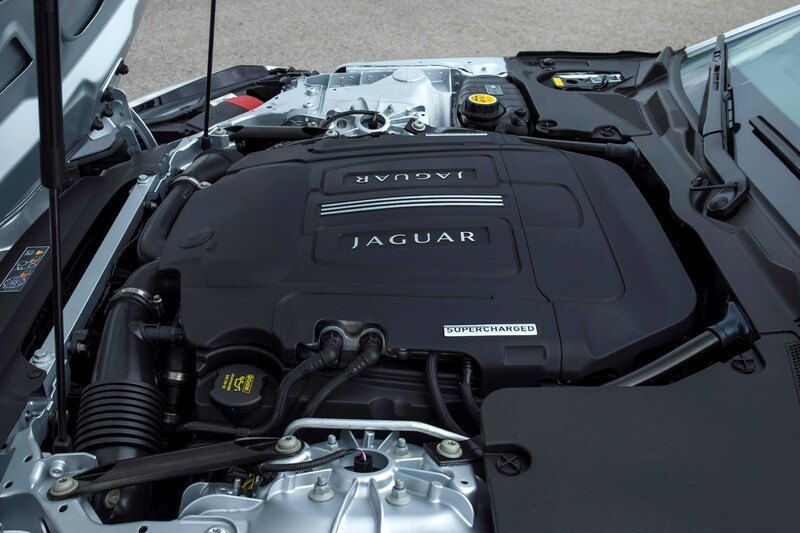 The V6 supercharged version packs an extra 40bhp to total 375bhp while torque moves up a notch to 460Nm. 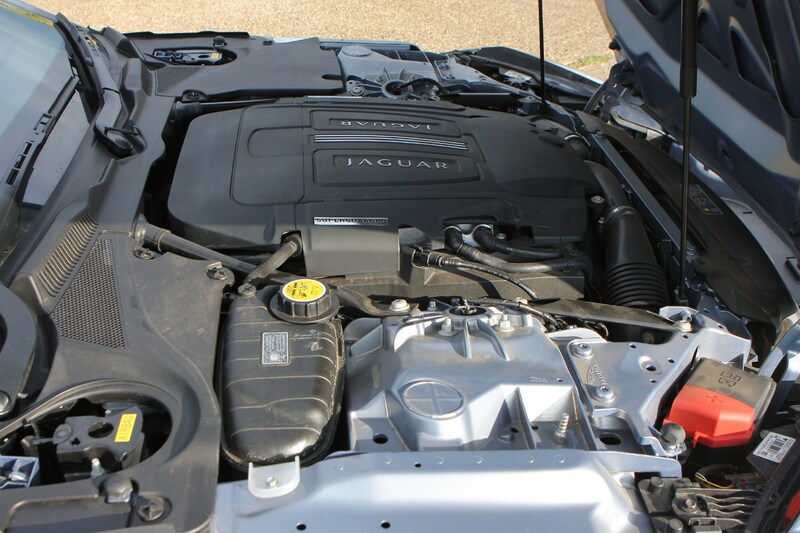 On paper that doesn’t sound a lot but on the road you notice the engine is a bit more hard-edged and offers a quicker throttle response. 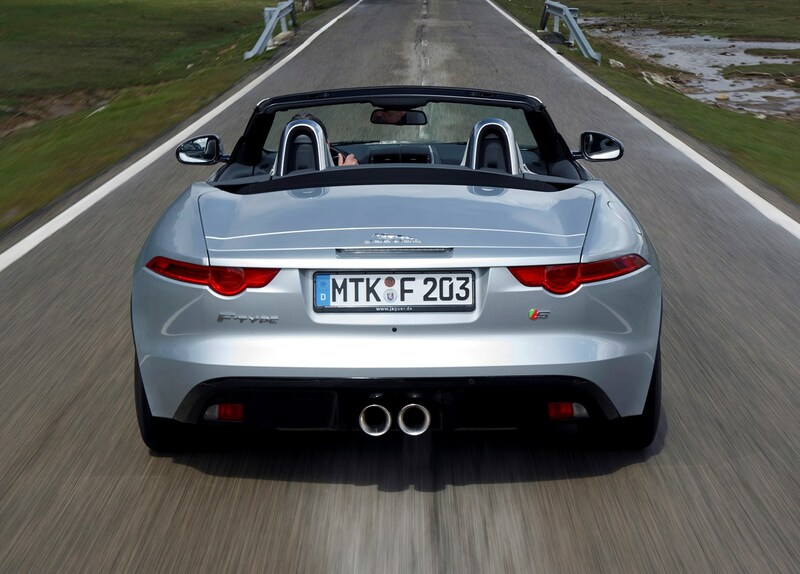 It’s enough to drop the 0-60mph dash time by 0.3 seconds to 4.8 seconds though. 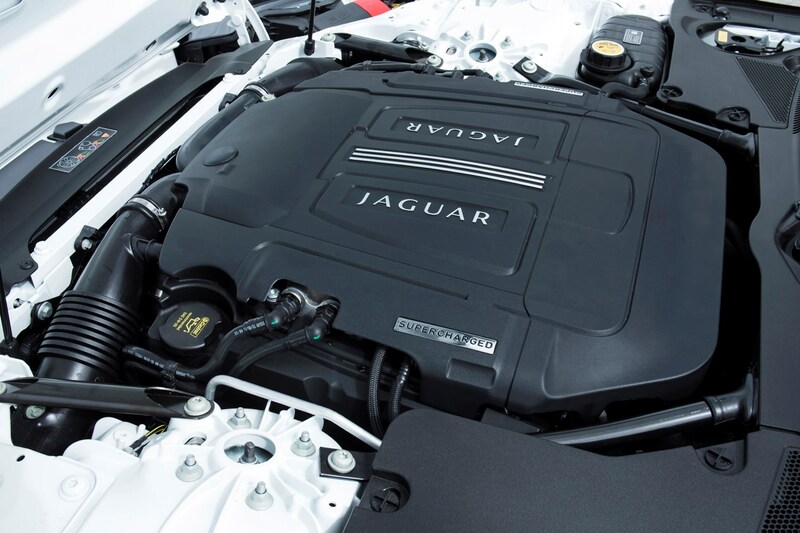 If neither of these look likely to satisfy then try the supercharged 5.0-litre V8, delivering a whopping 488bhp and a staggering 625Nm. 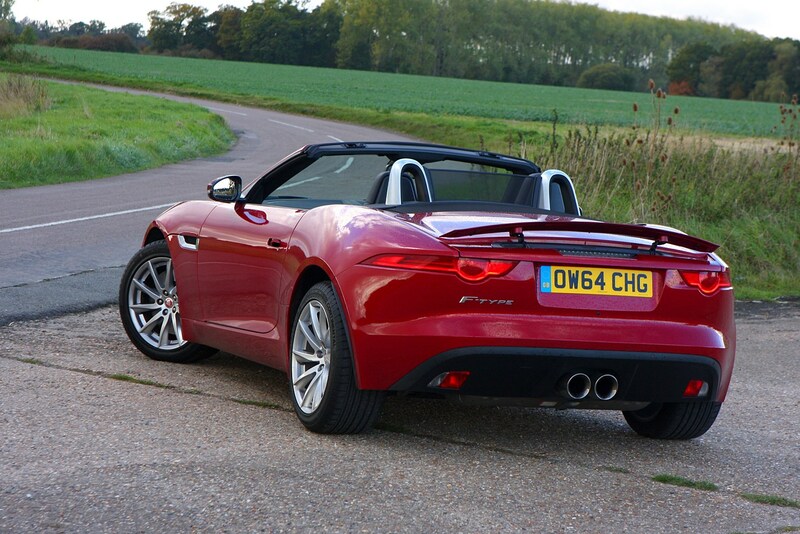 On the road this version feels far quicker than even those figures would suggest, flinging itself at the horizon as soon as you depress the throttle. 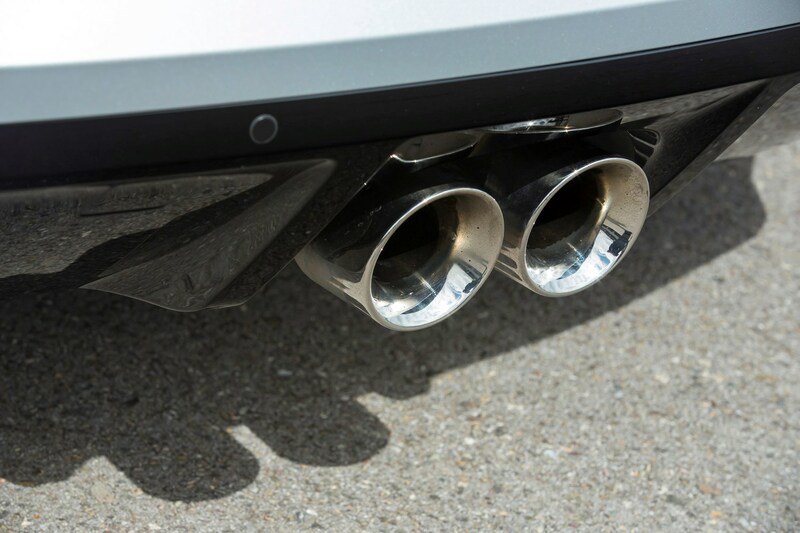 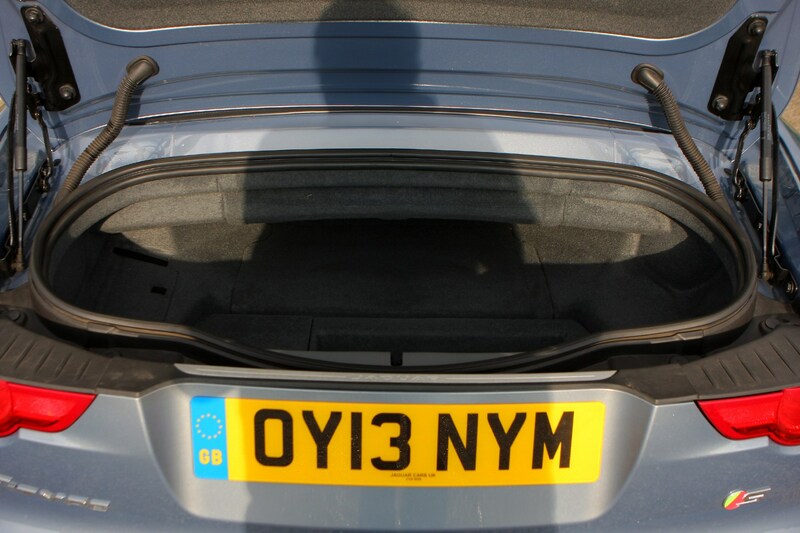 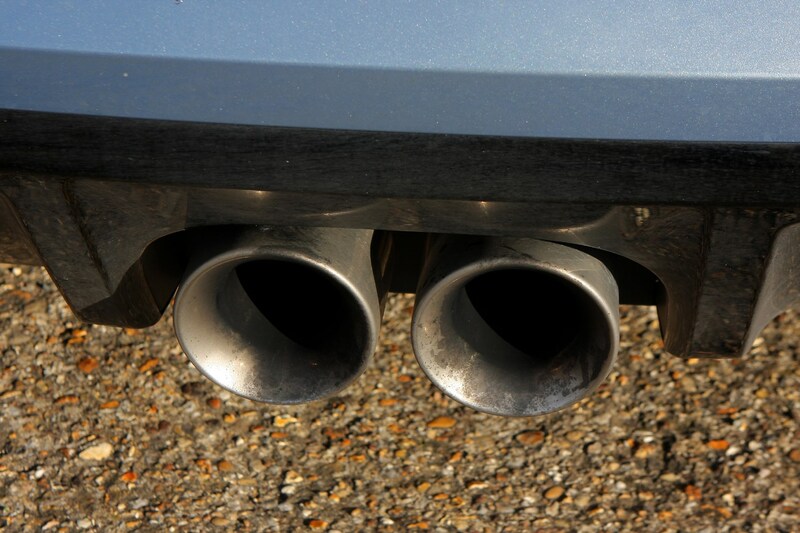 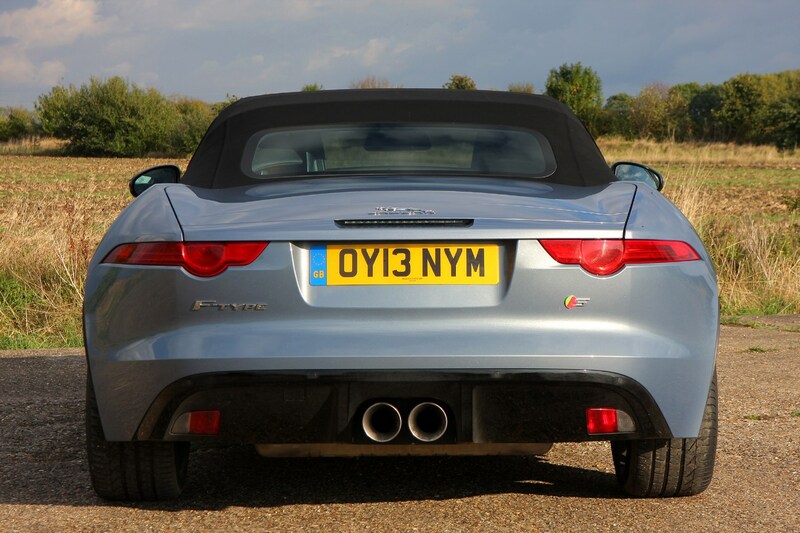 It builds power from very low down and speed increases rapidly as the revs rise. 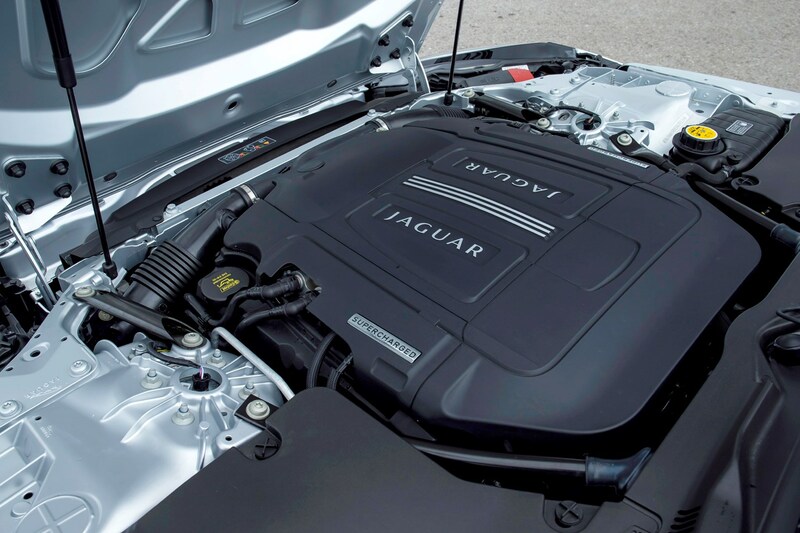 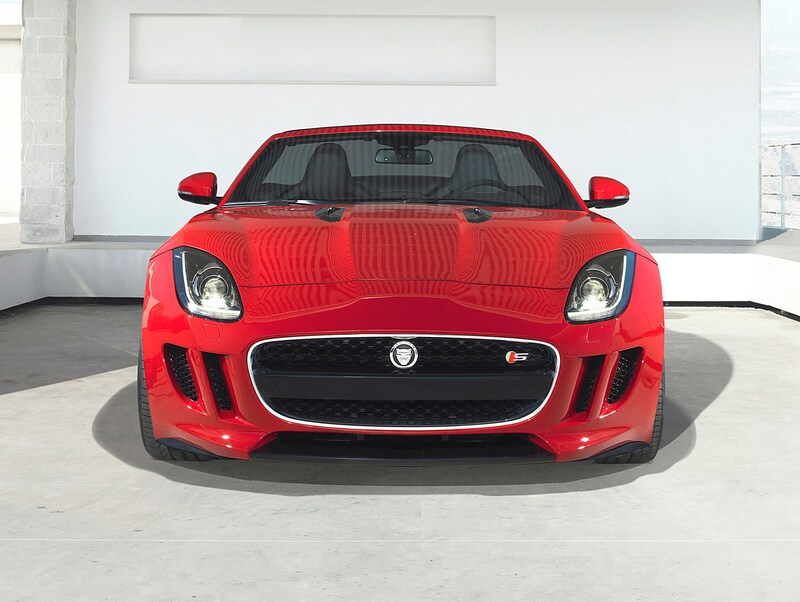 In terms of comparison, the V8 S completes the 0-60mph sprint in 4.2 seconds and is capable of a possible 186mph, which Jaguar claims is electronically limited. 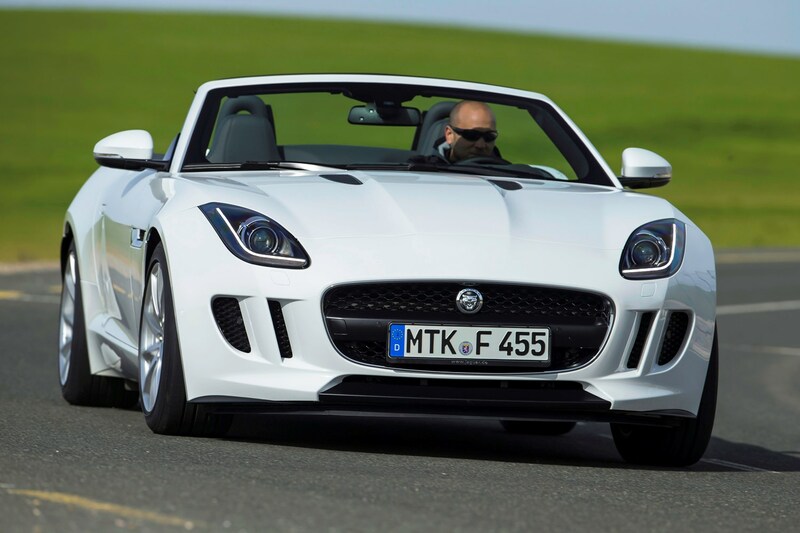 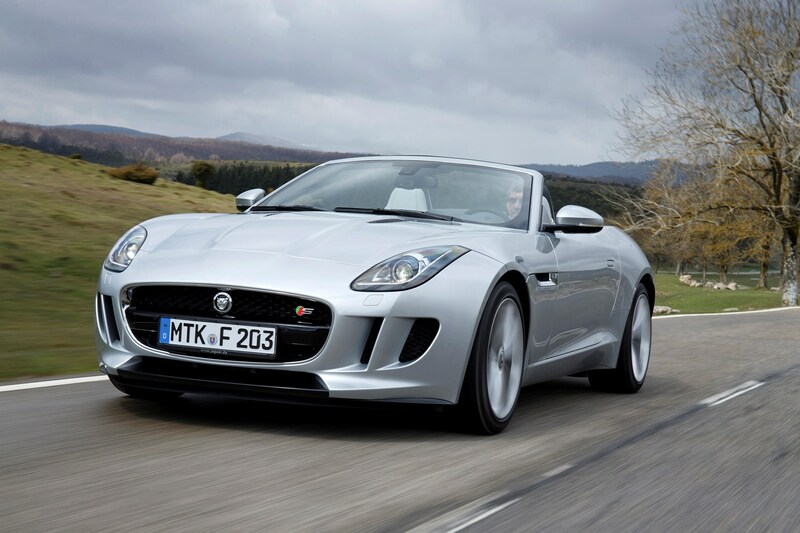 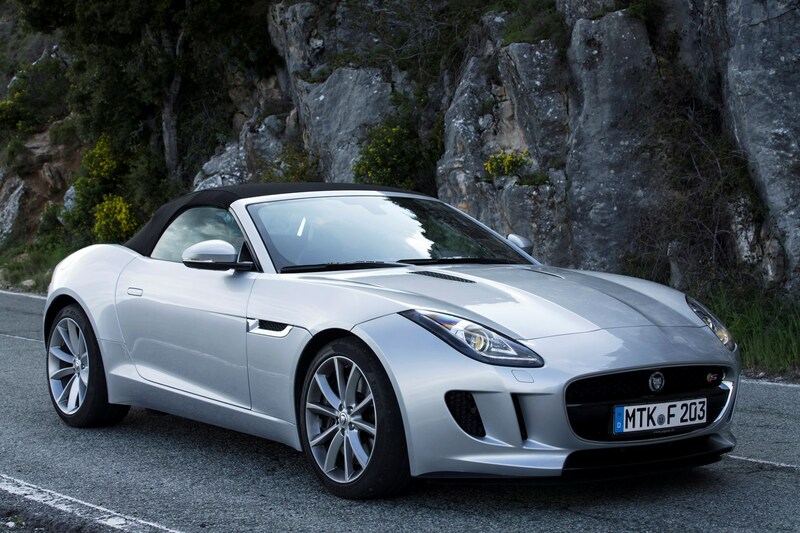 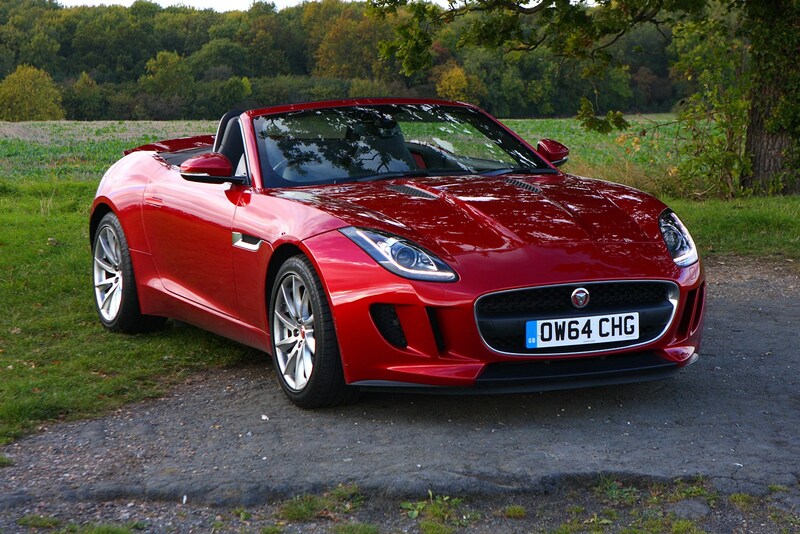 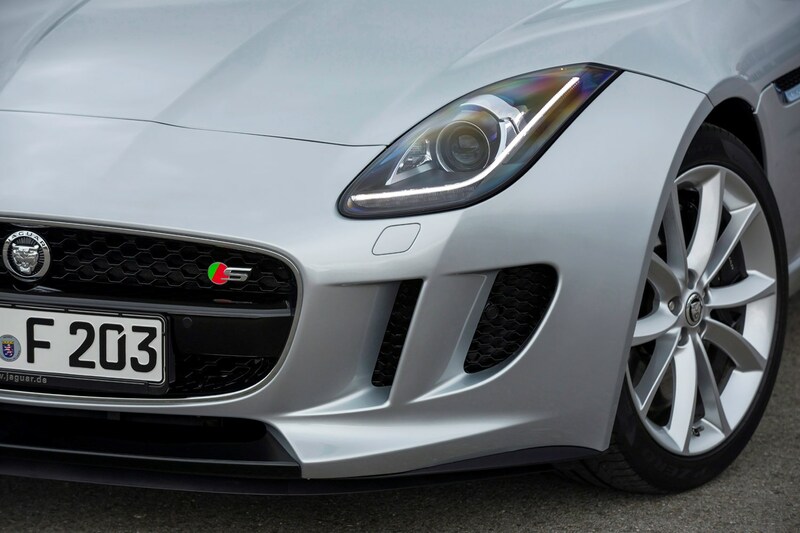 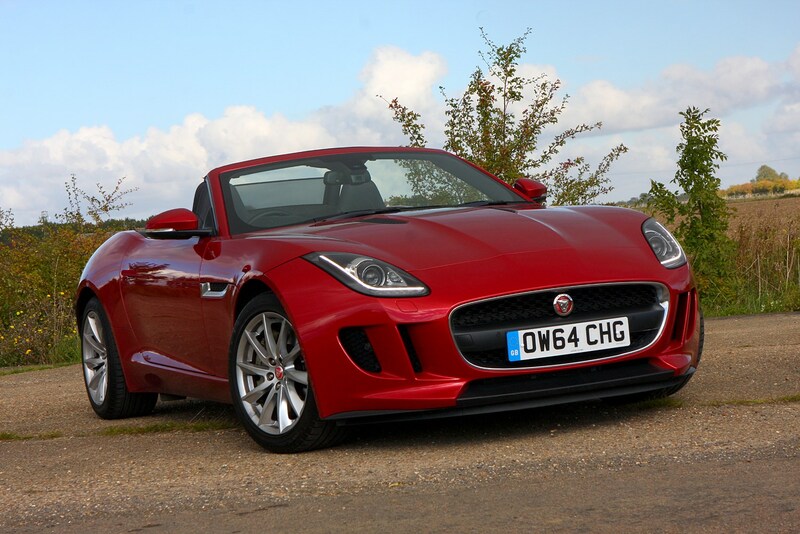 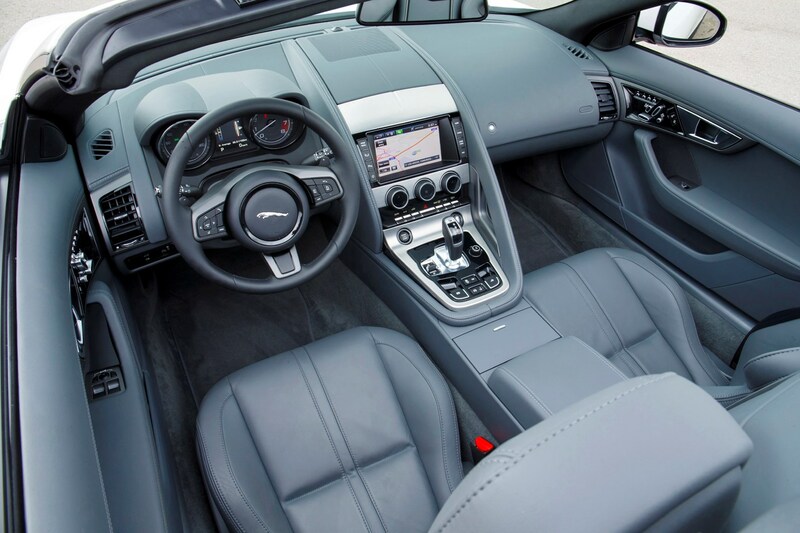 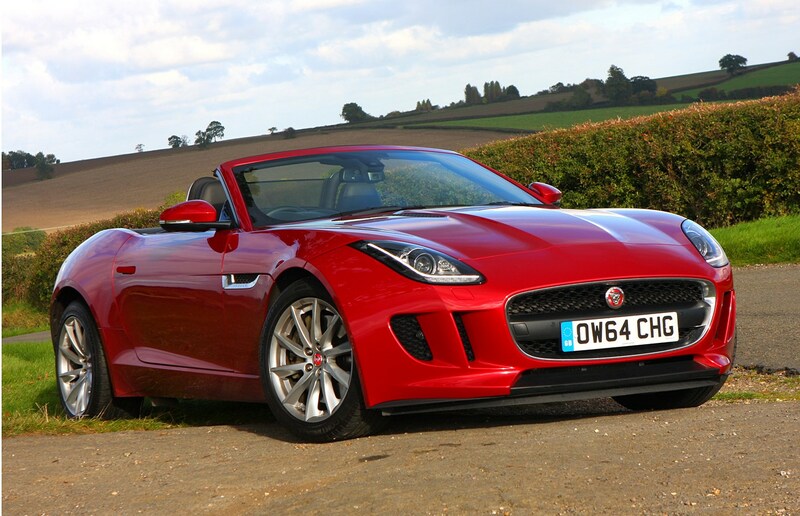 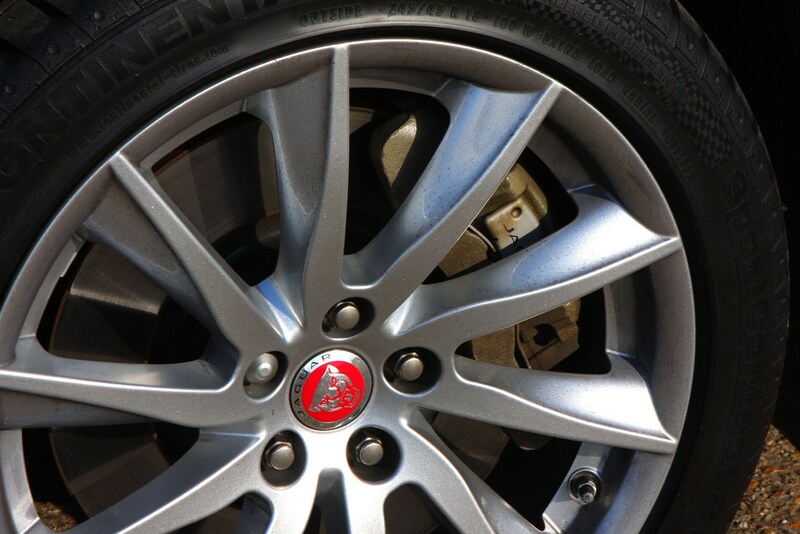 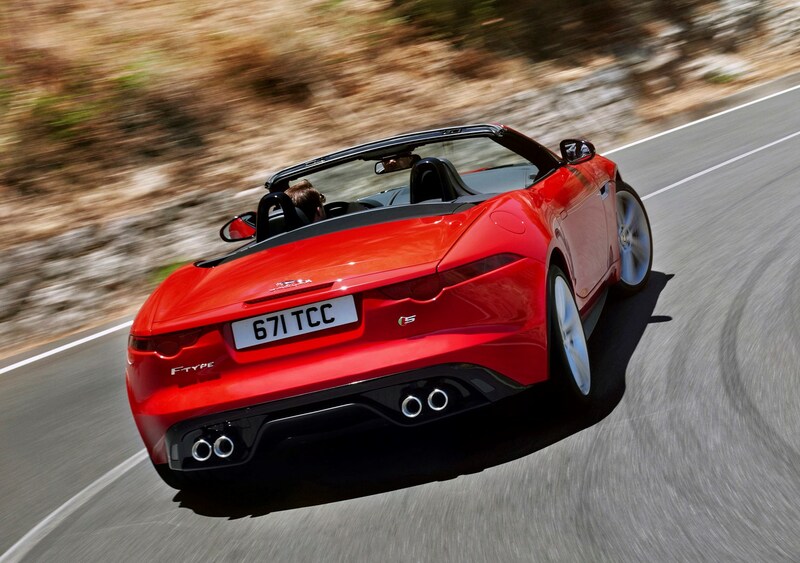 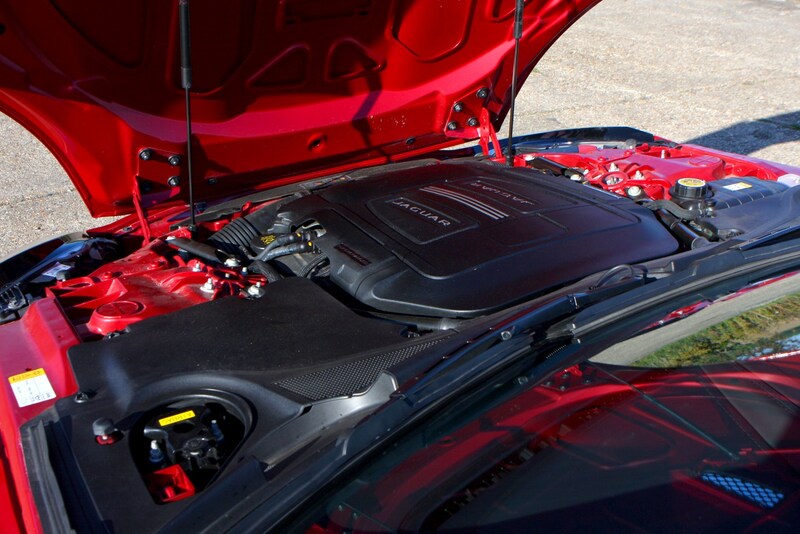 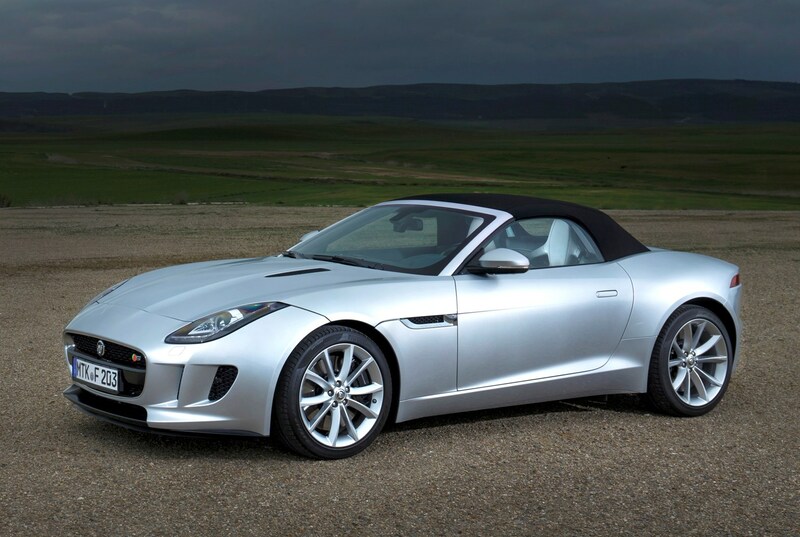 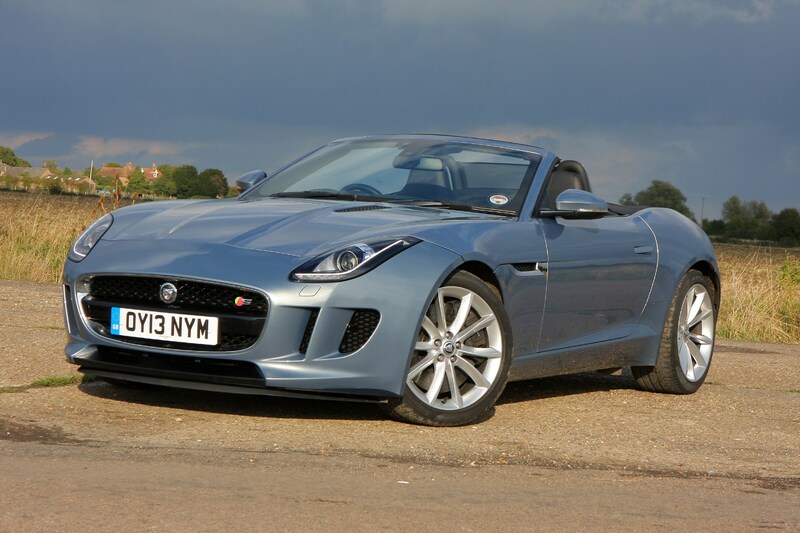 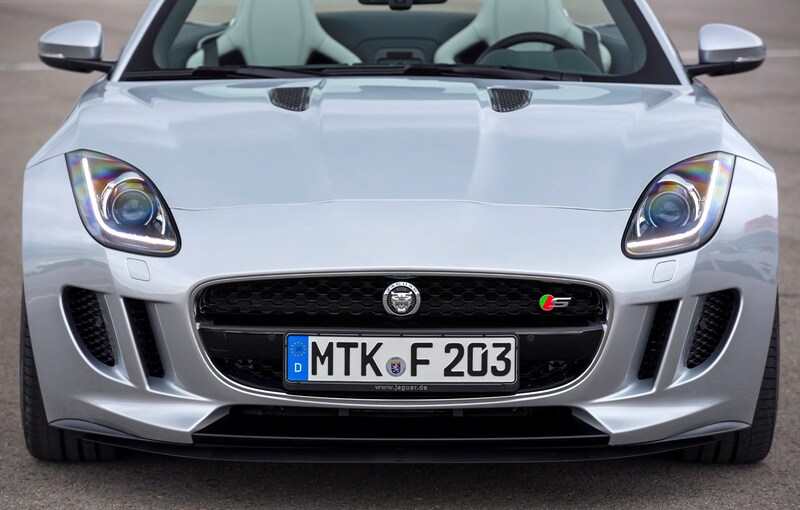 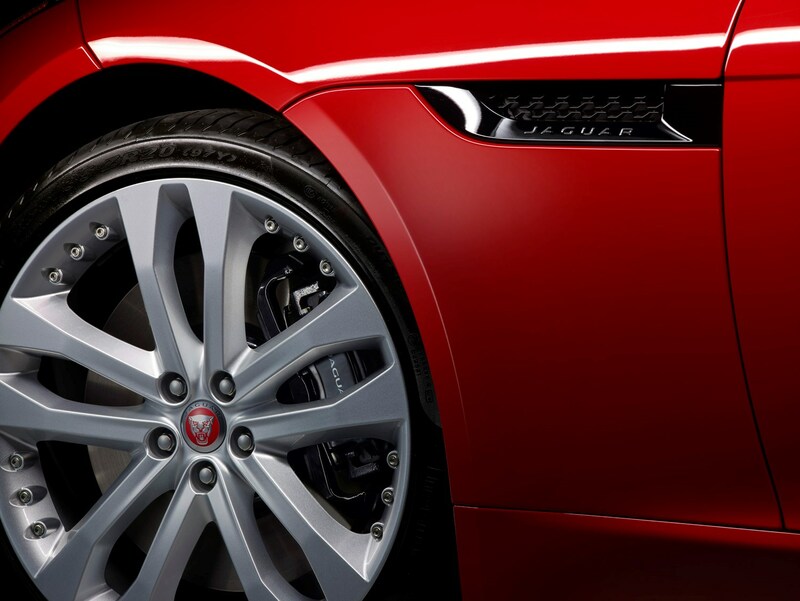 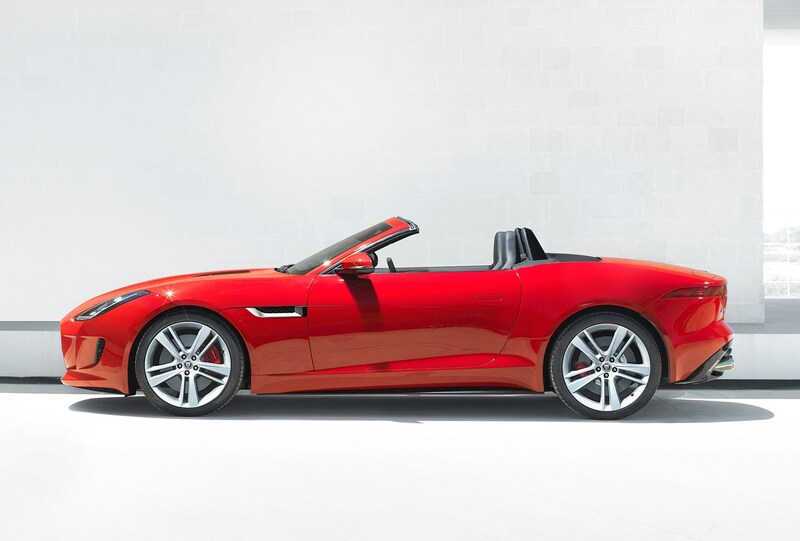 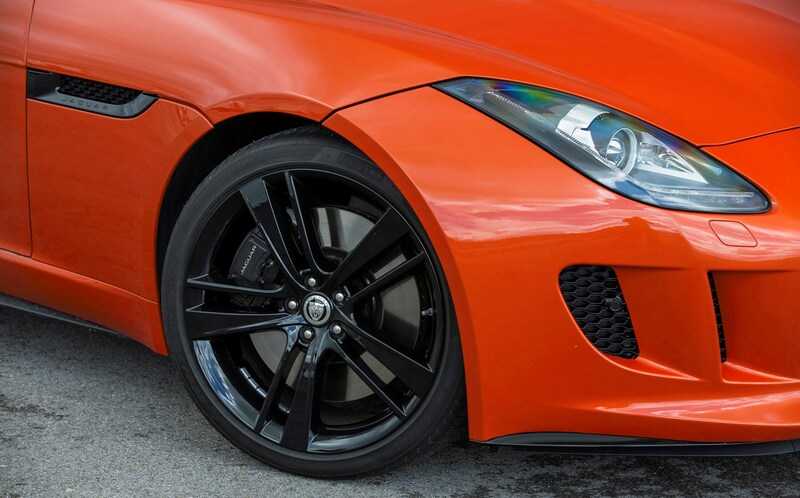 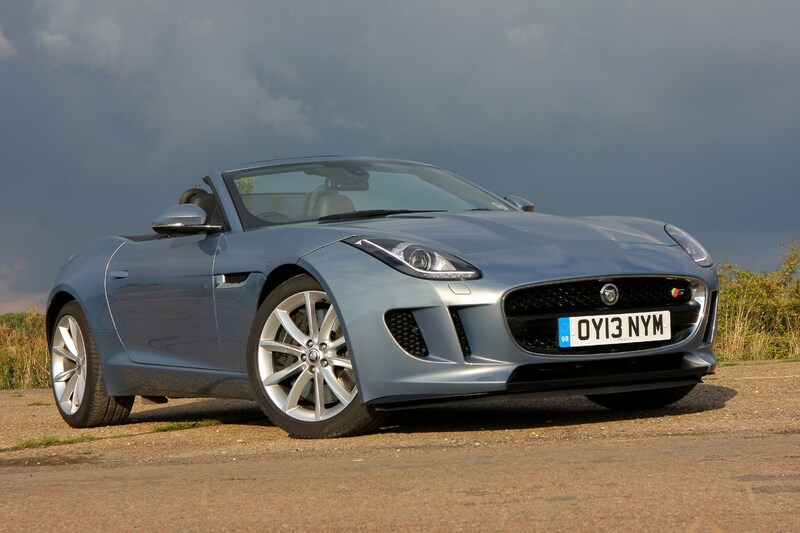 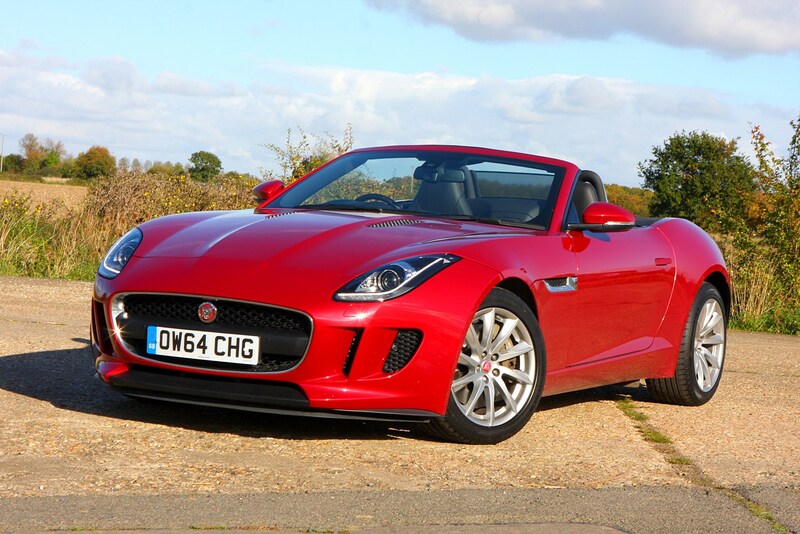 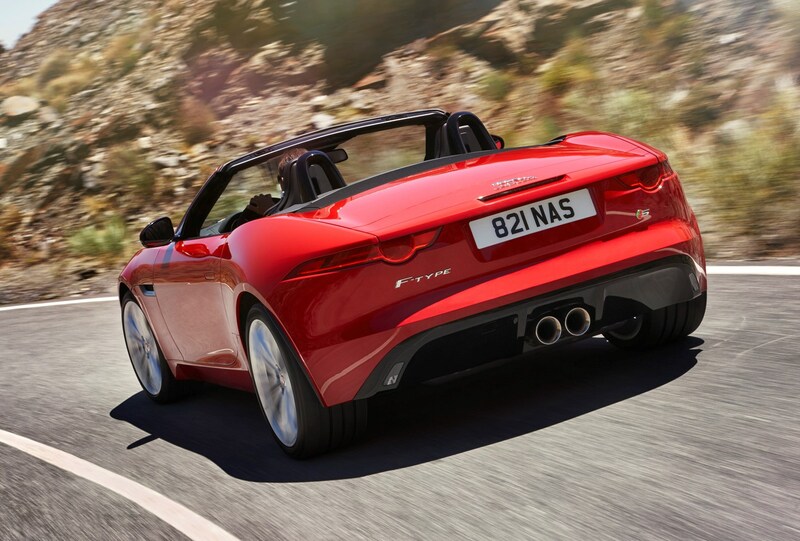 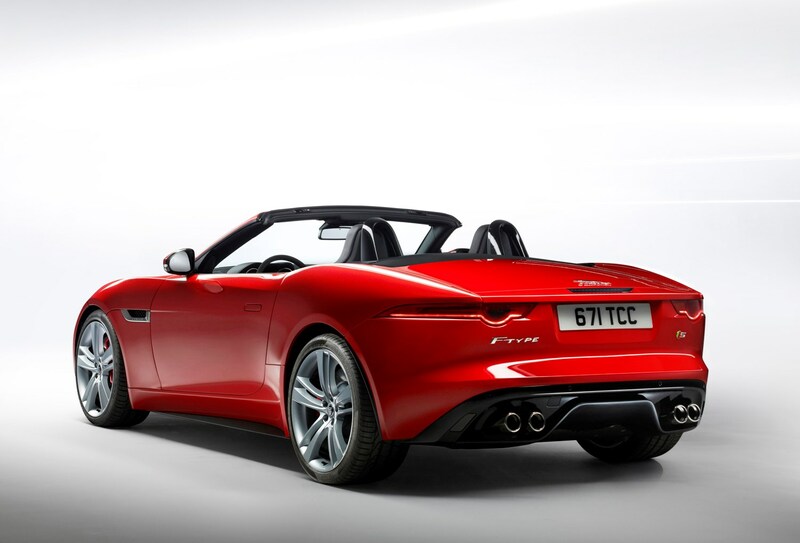 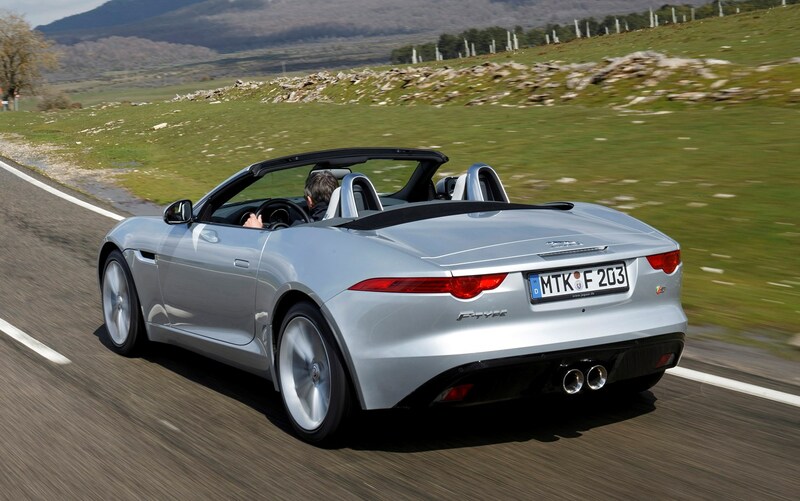 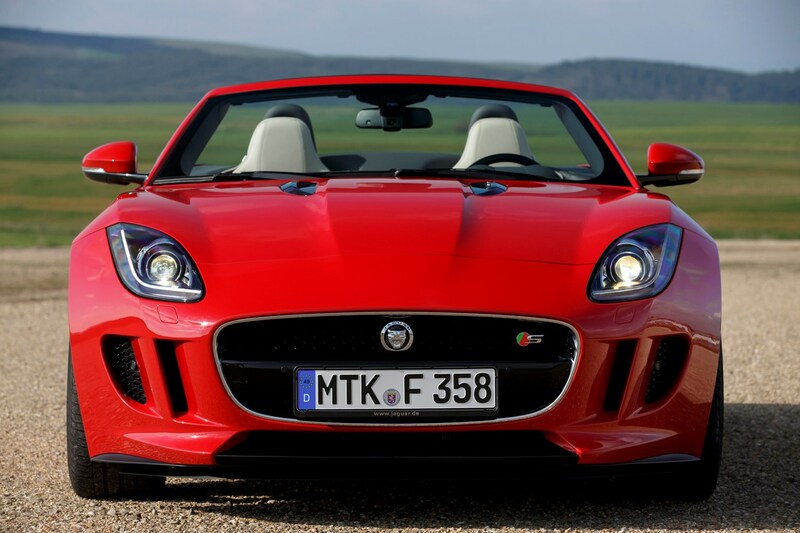 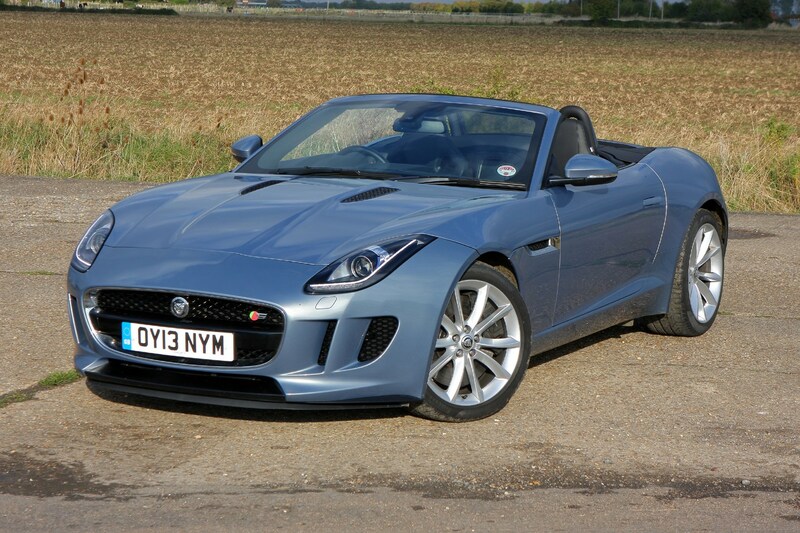 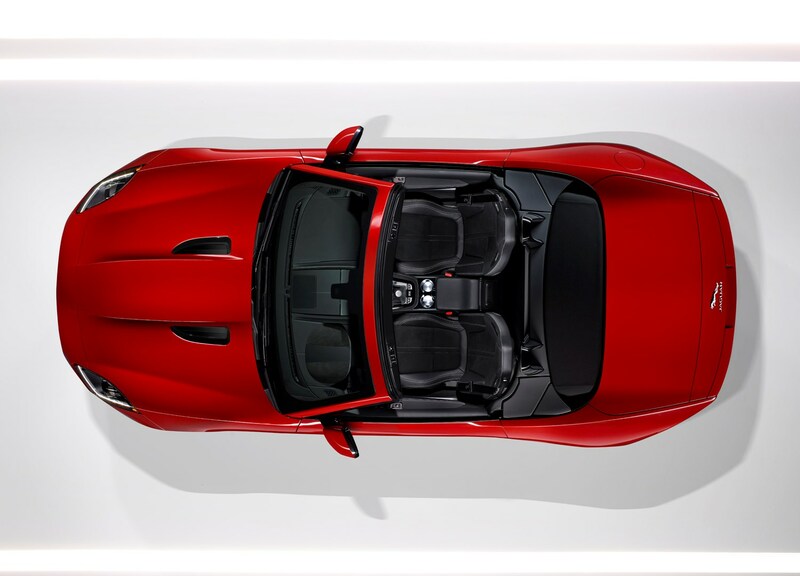 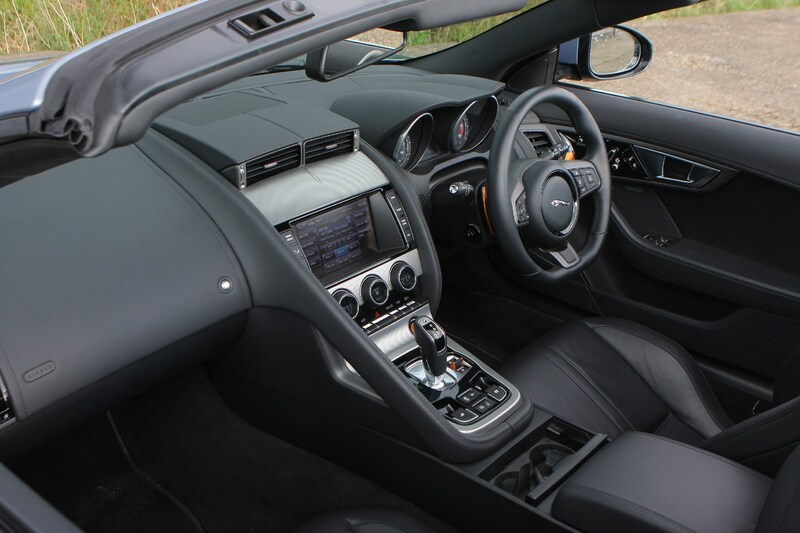 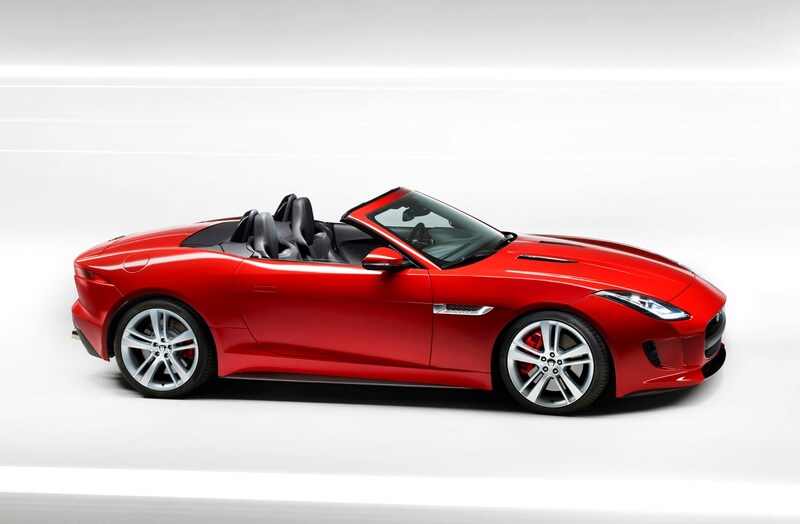 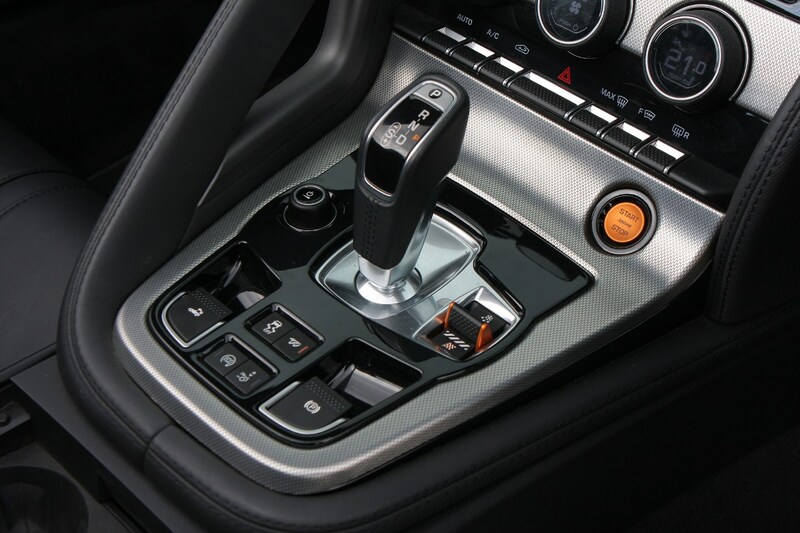 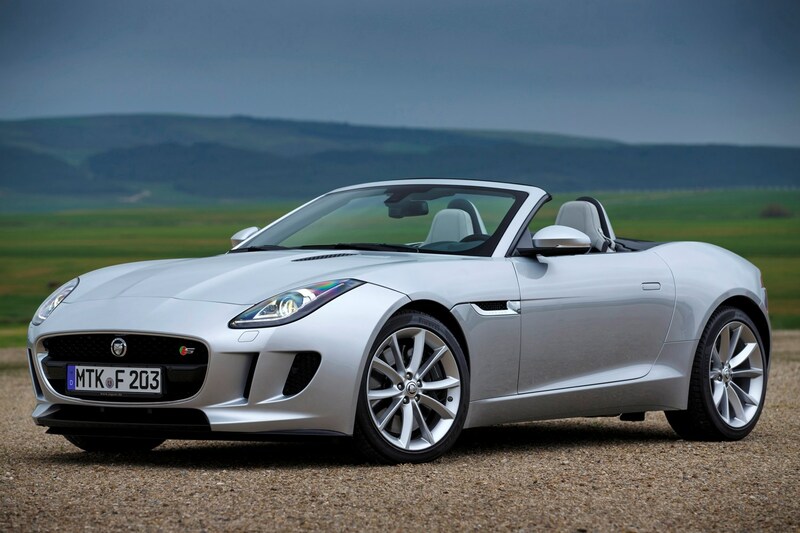 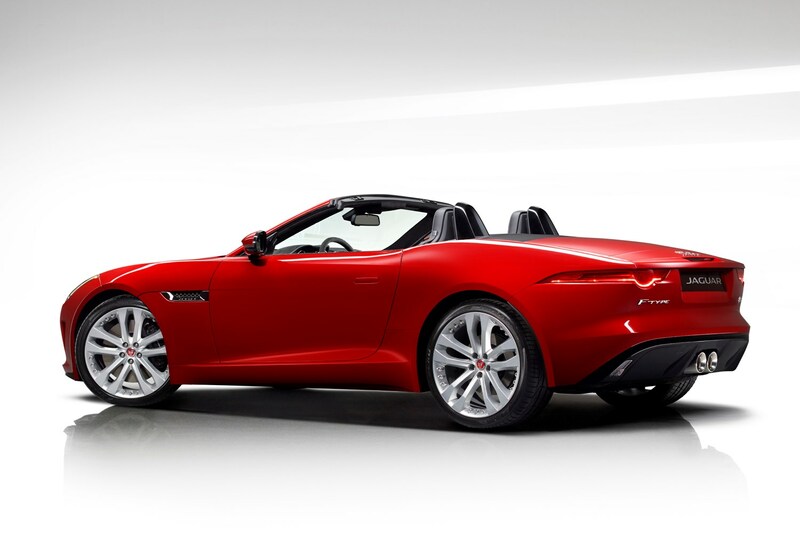 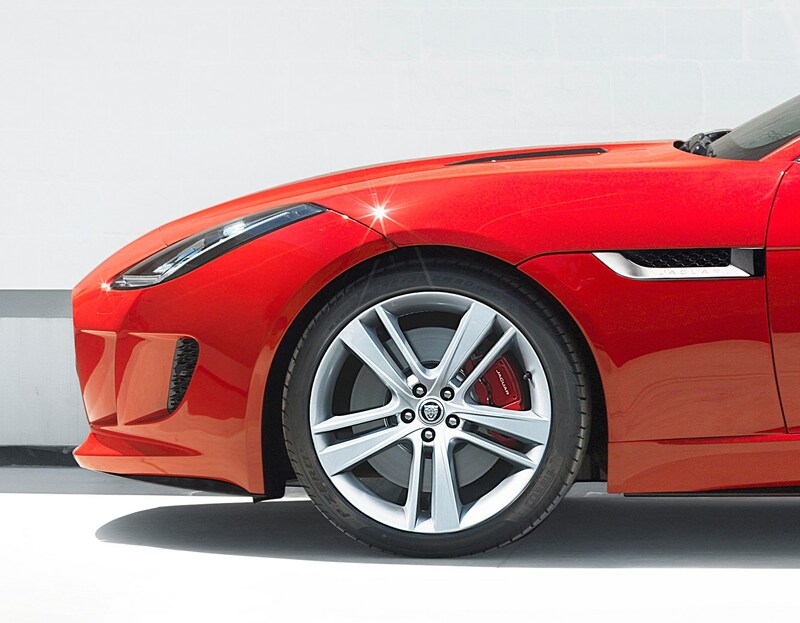 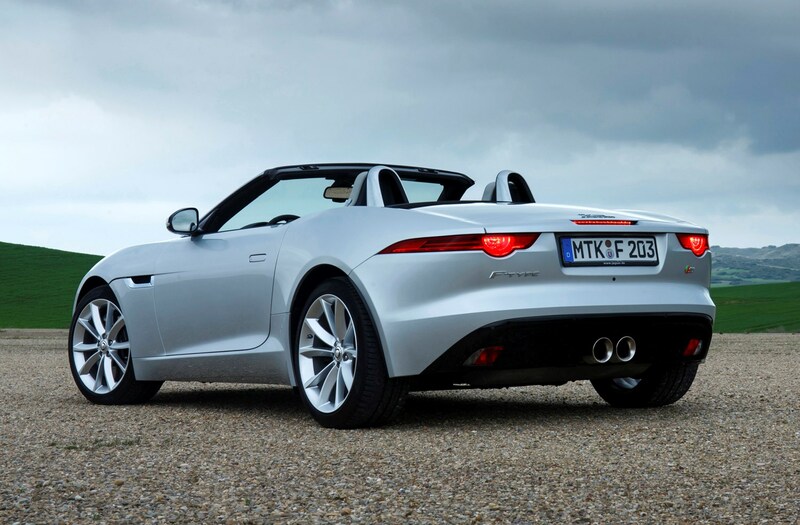 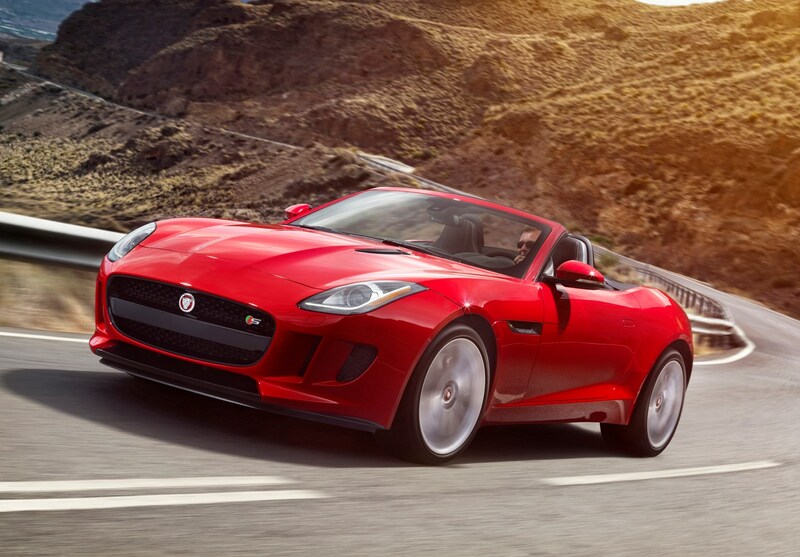 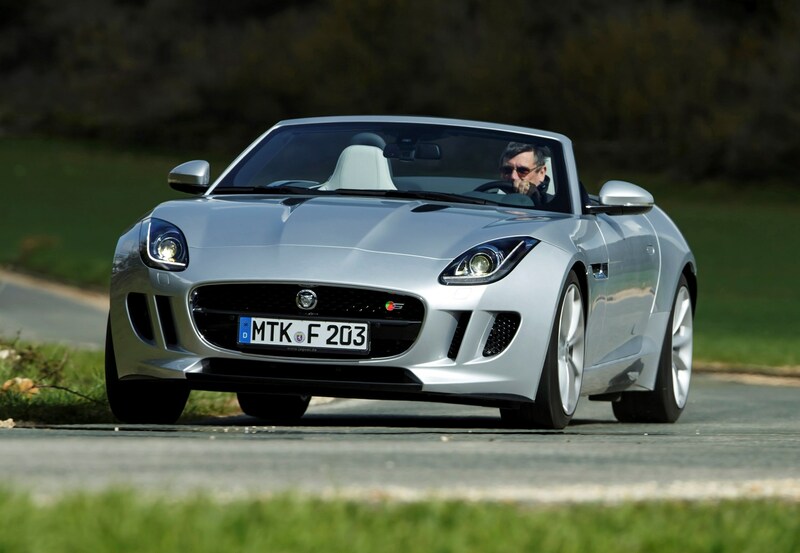 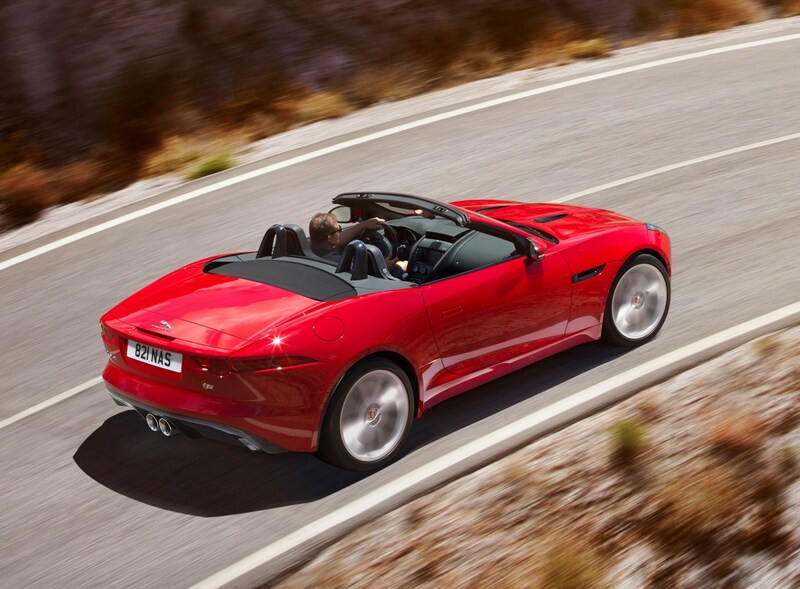 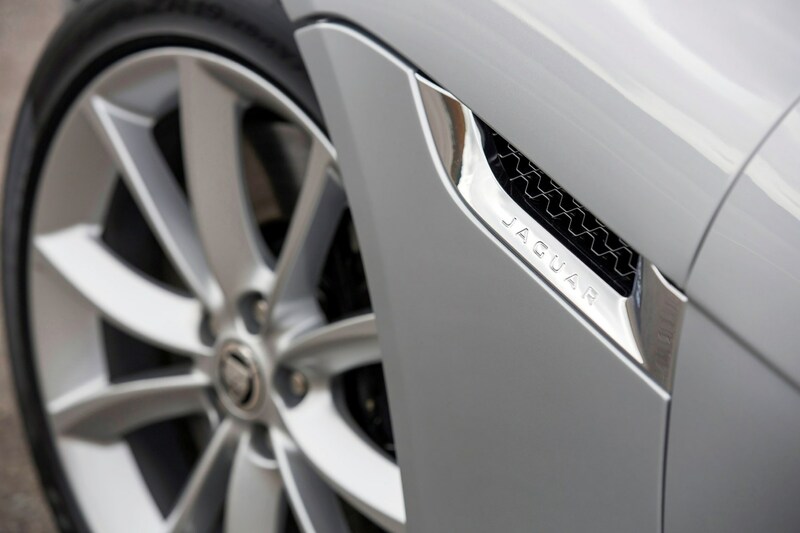 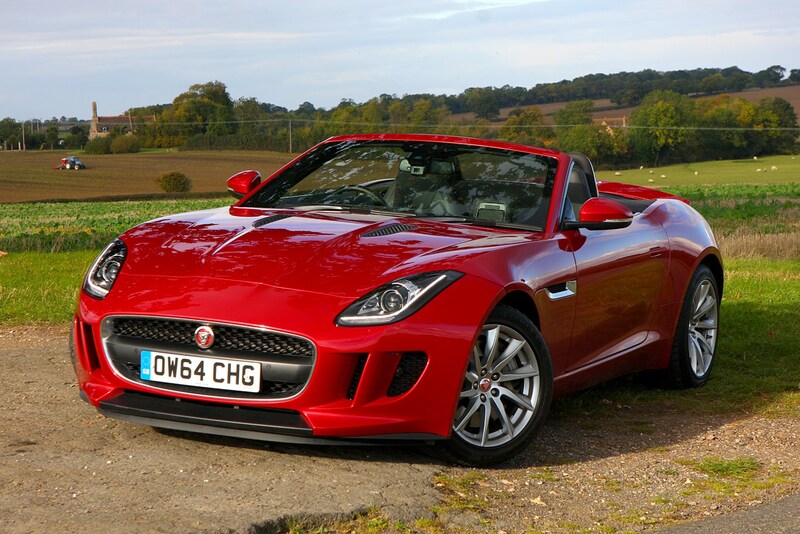 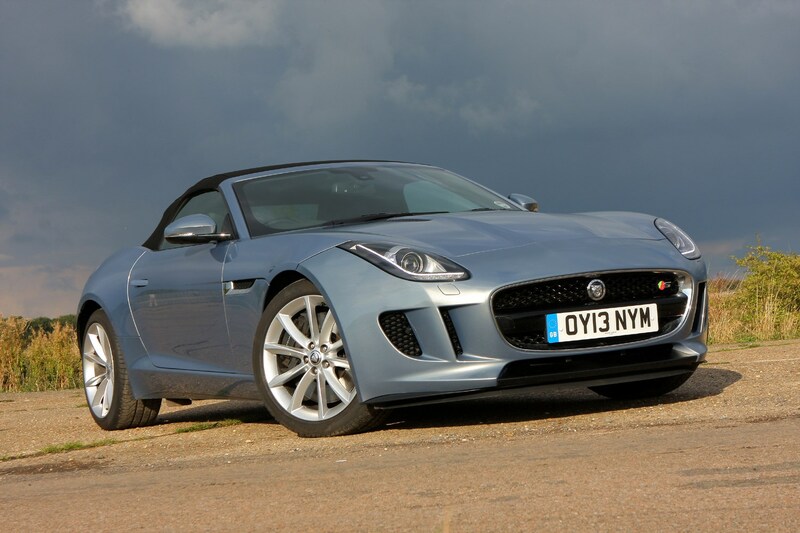 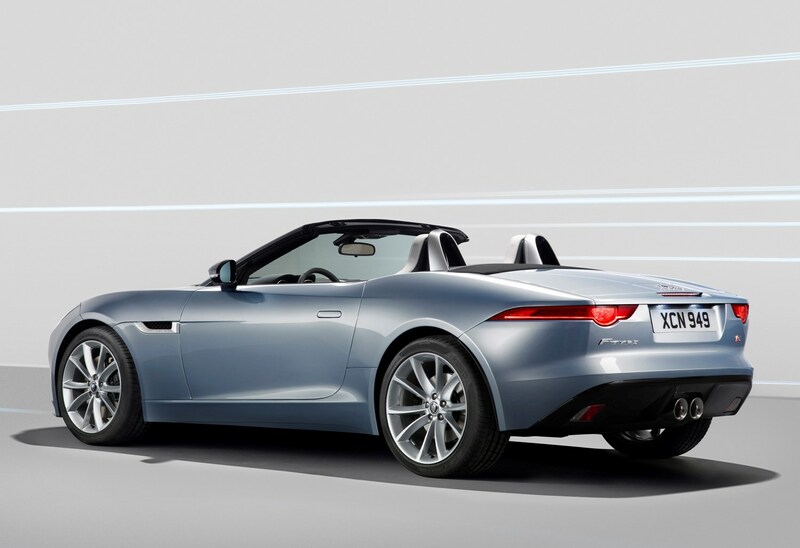 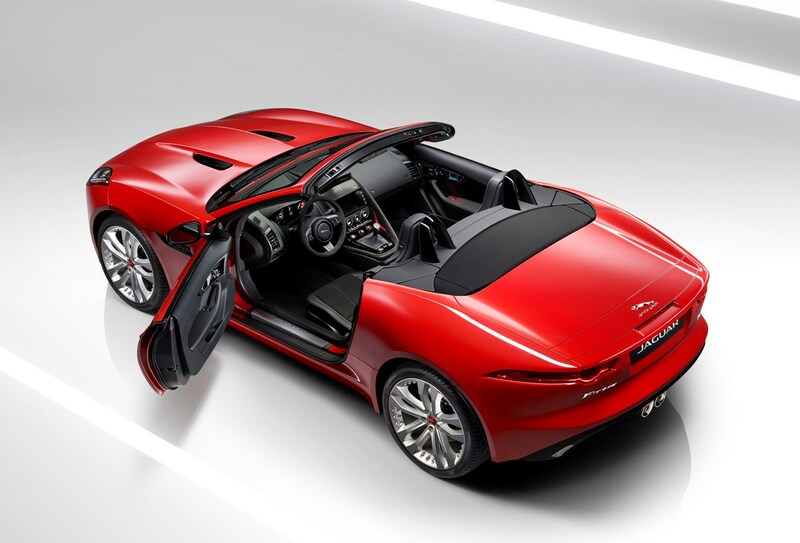 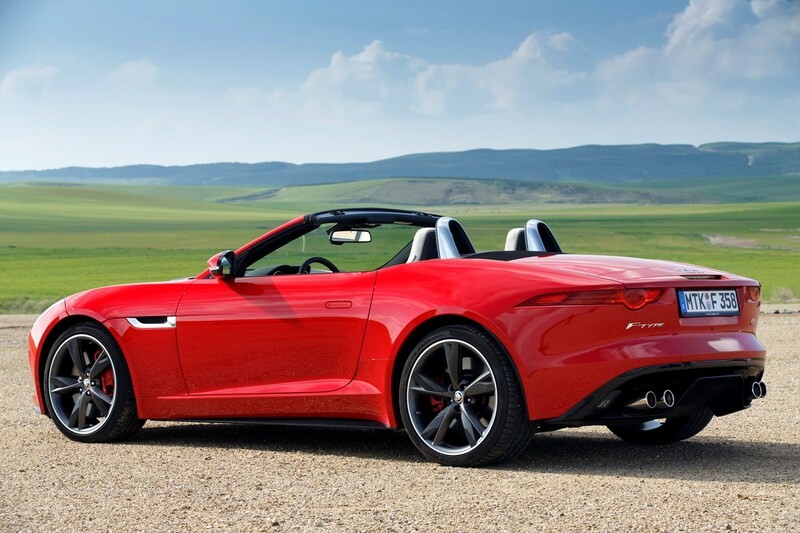 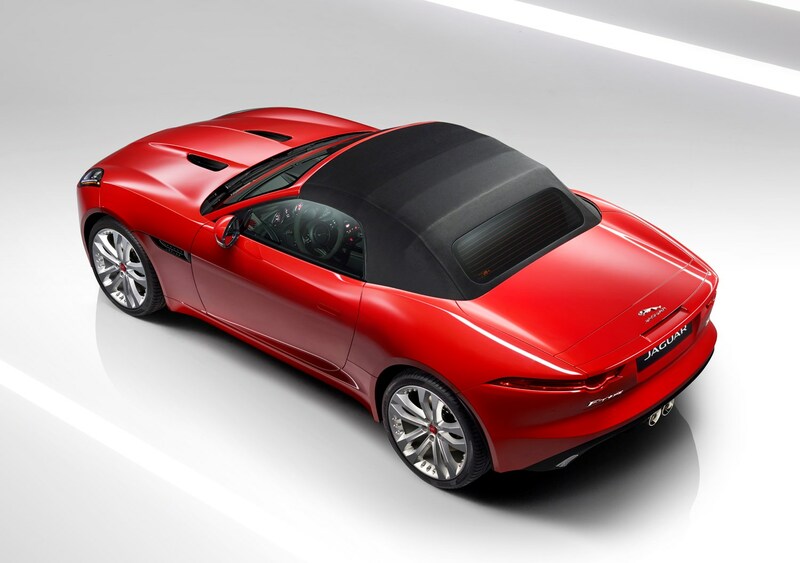 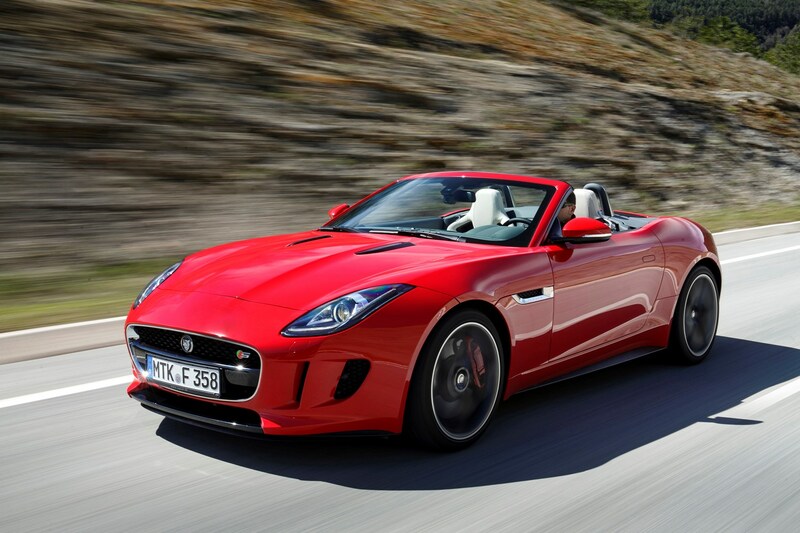 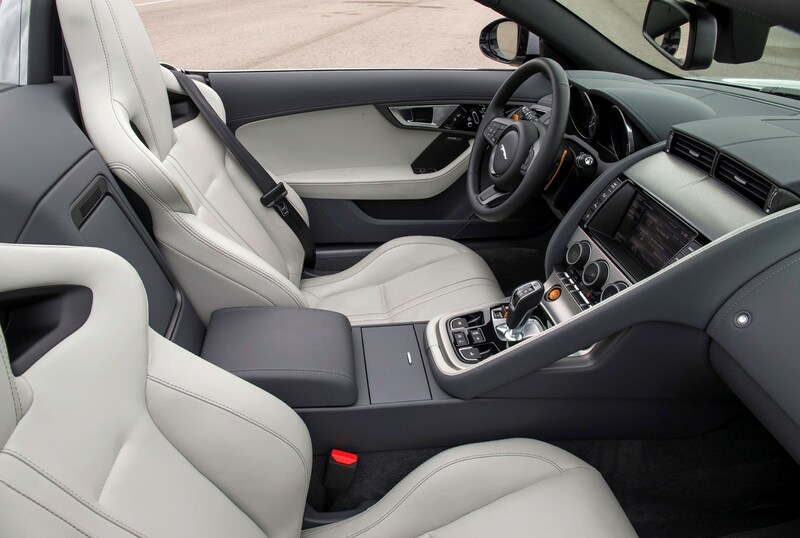 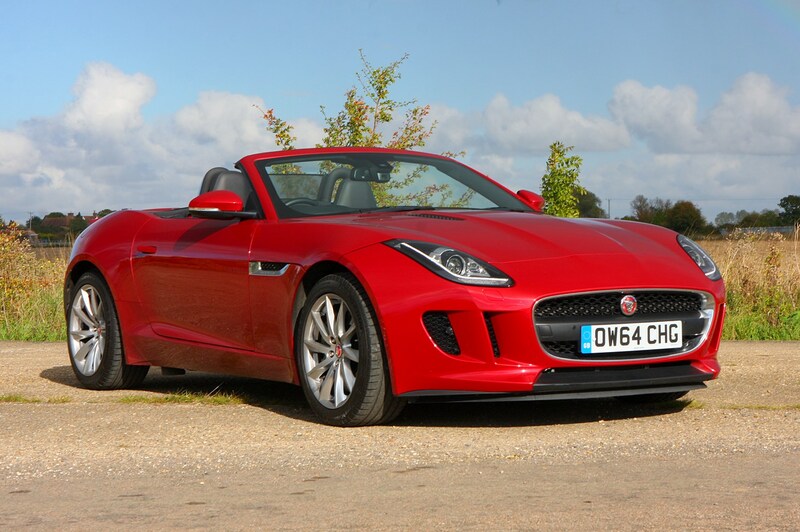 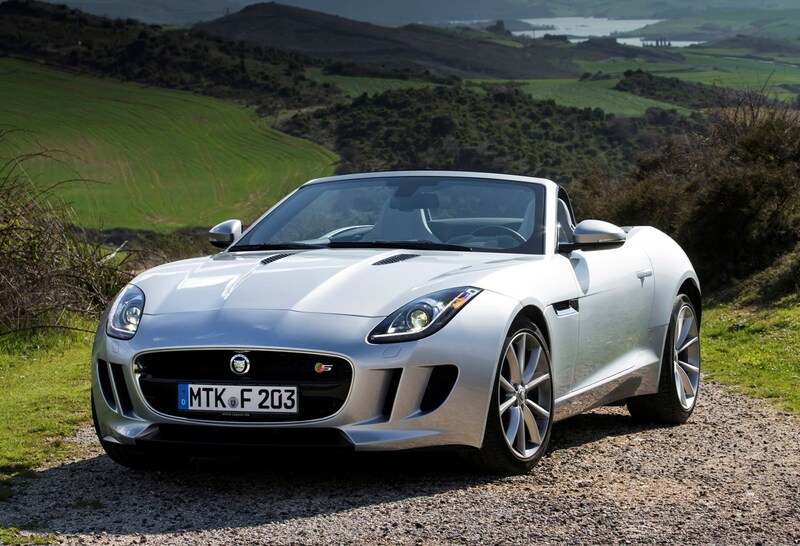 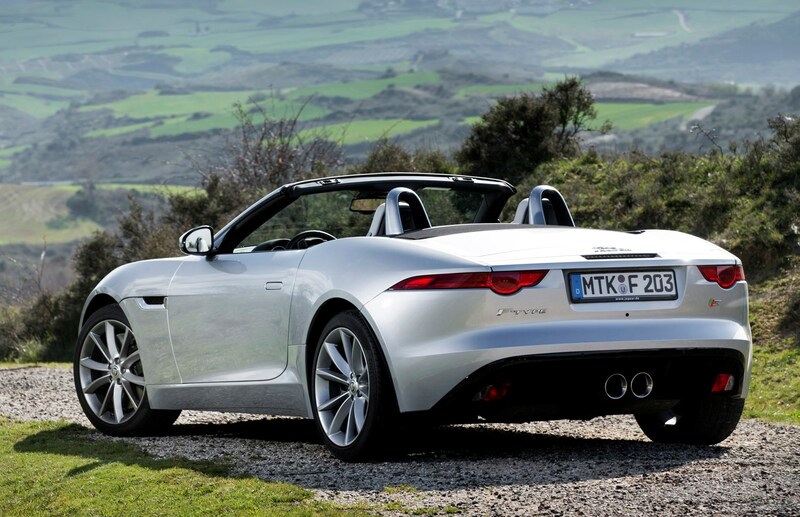 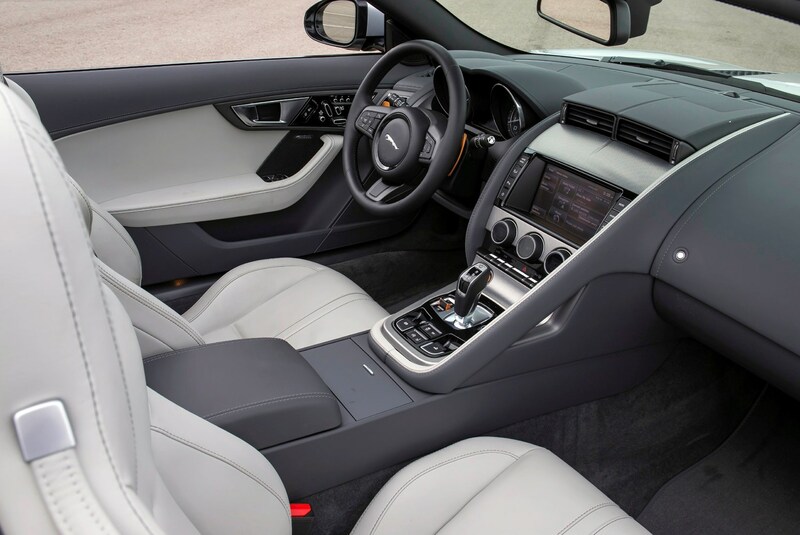 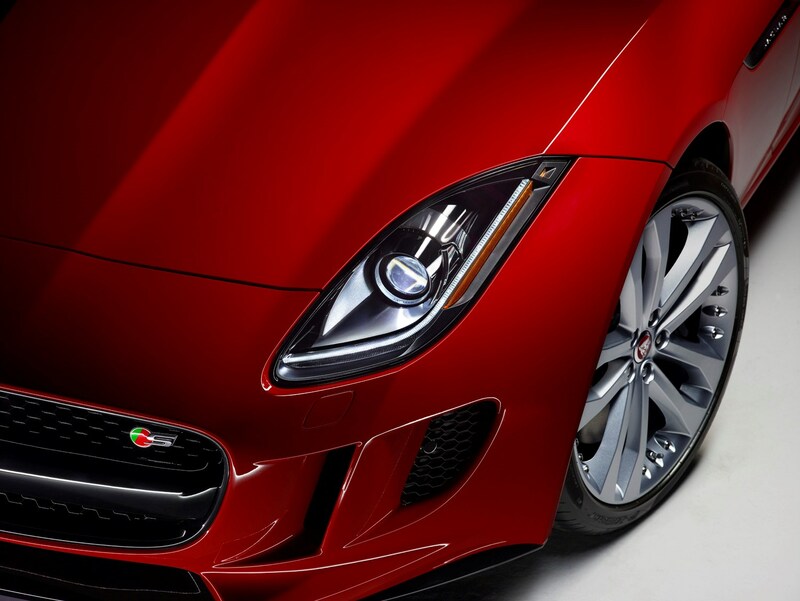 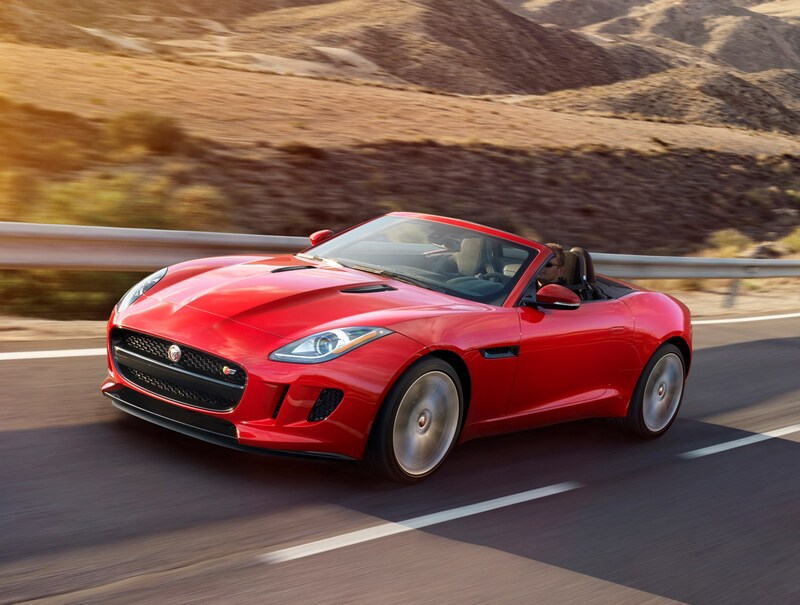 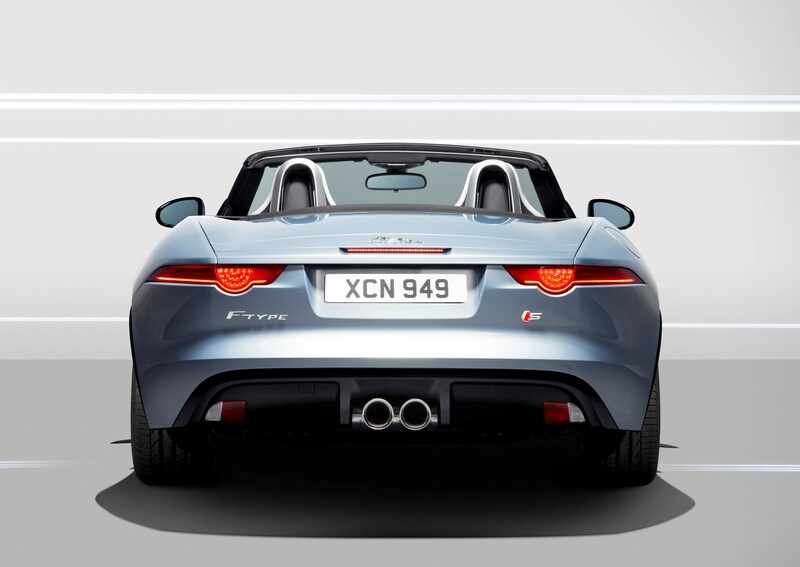 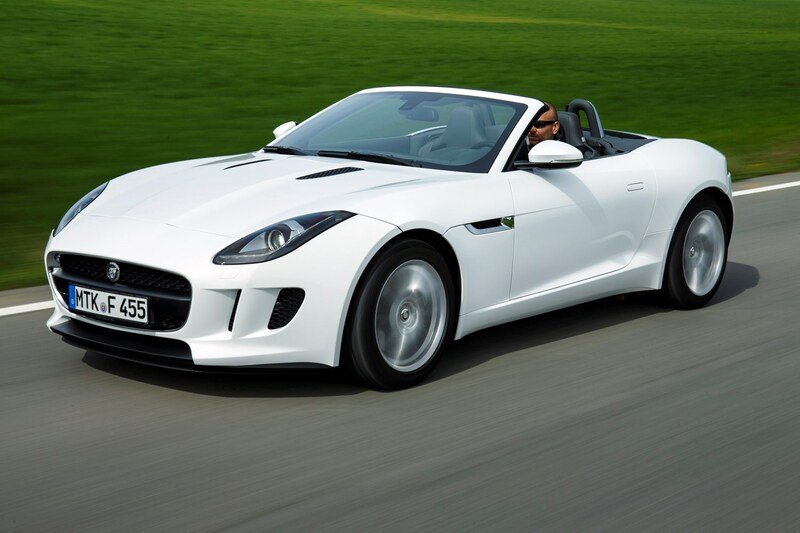 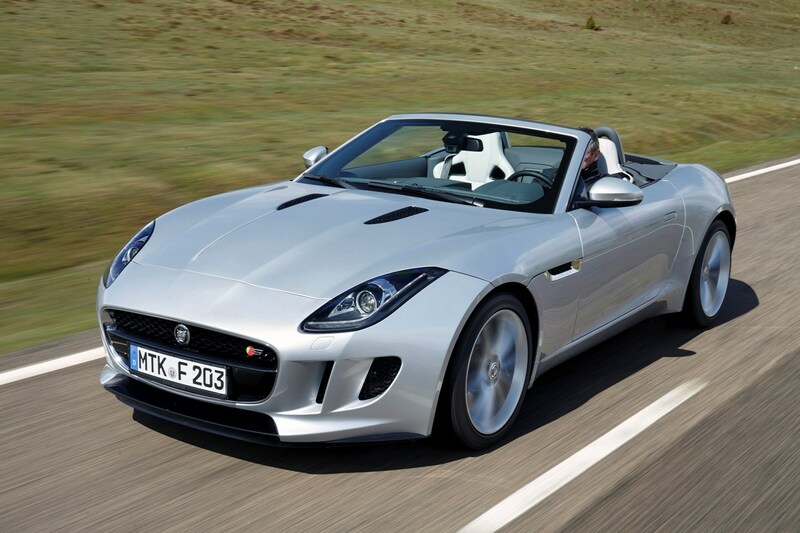 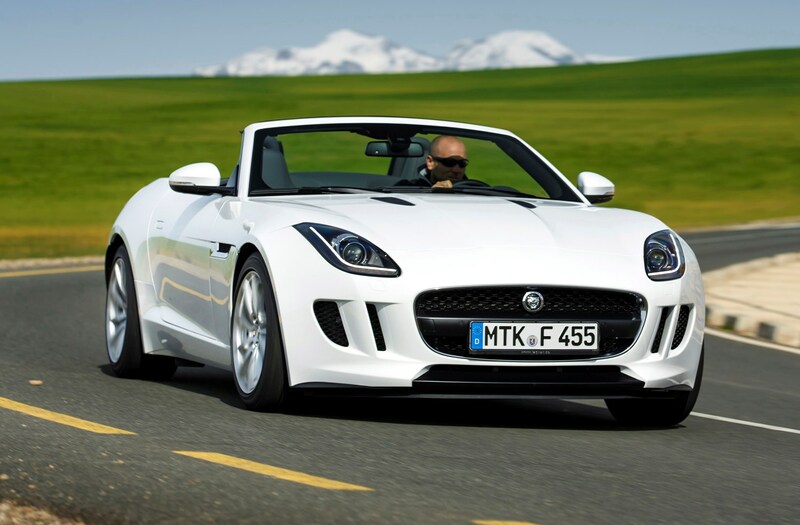 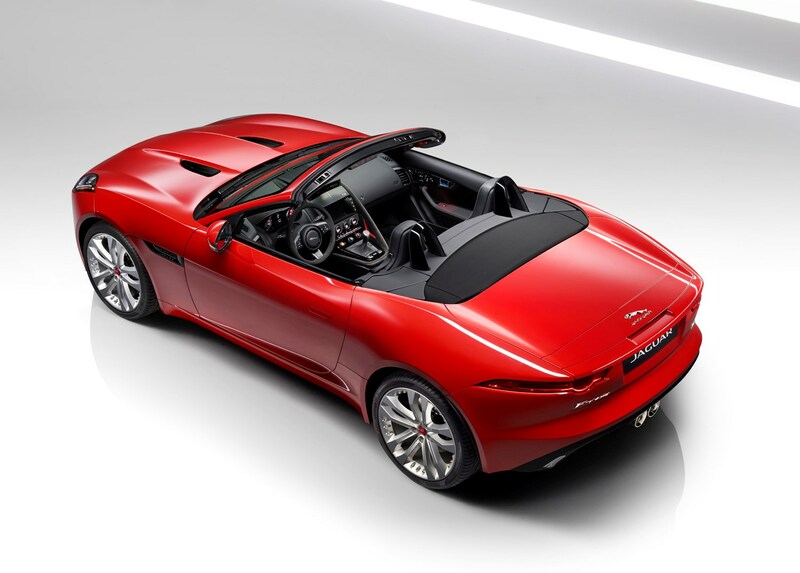 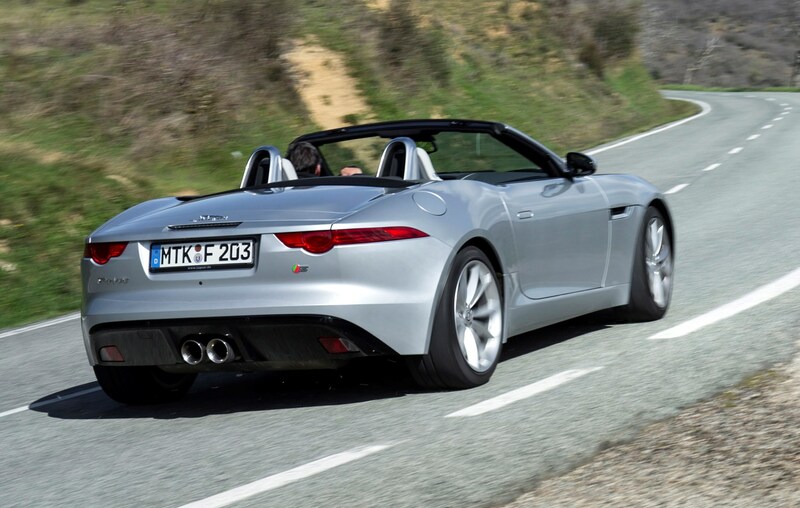 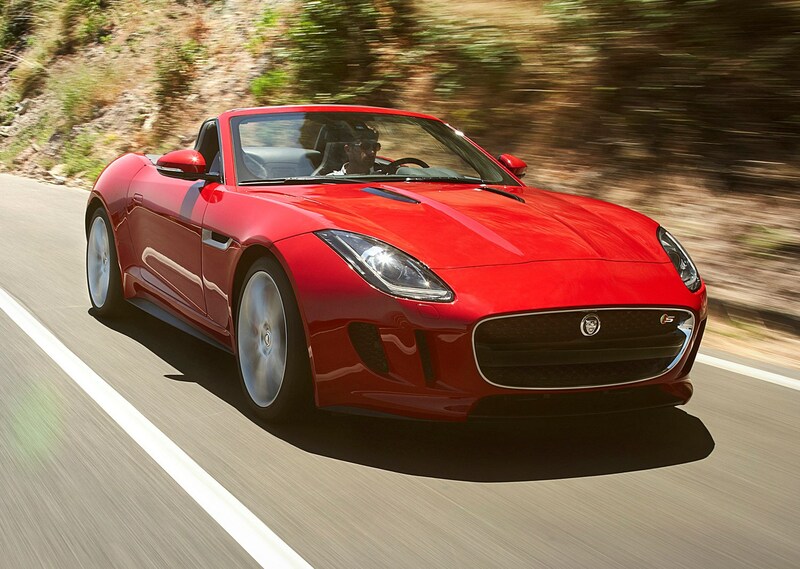 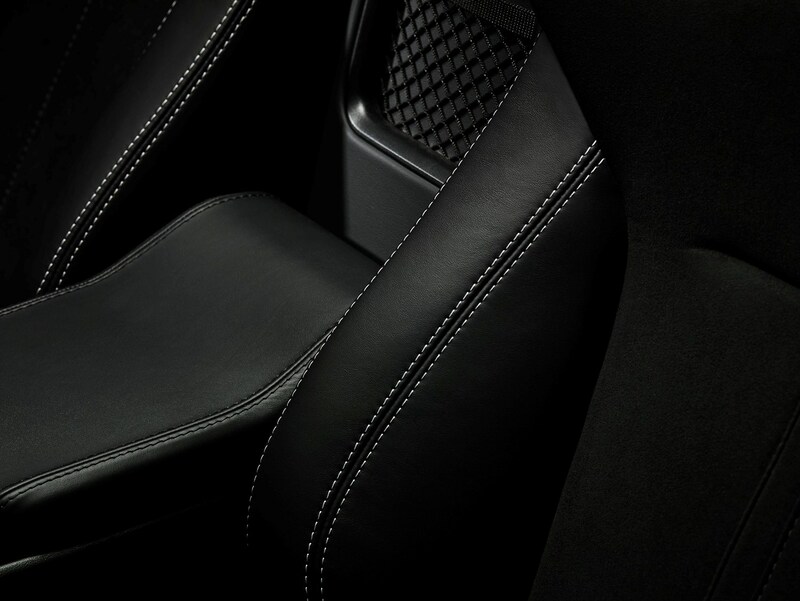 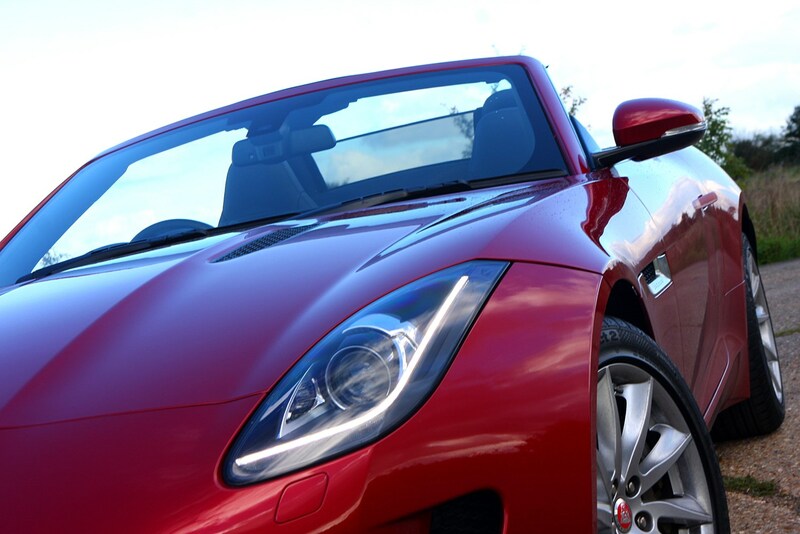 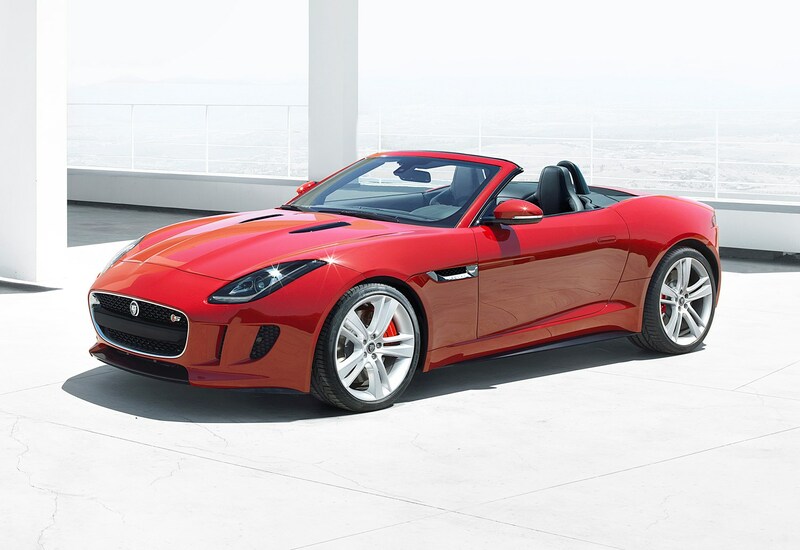 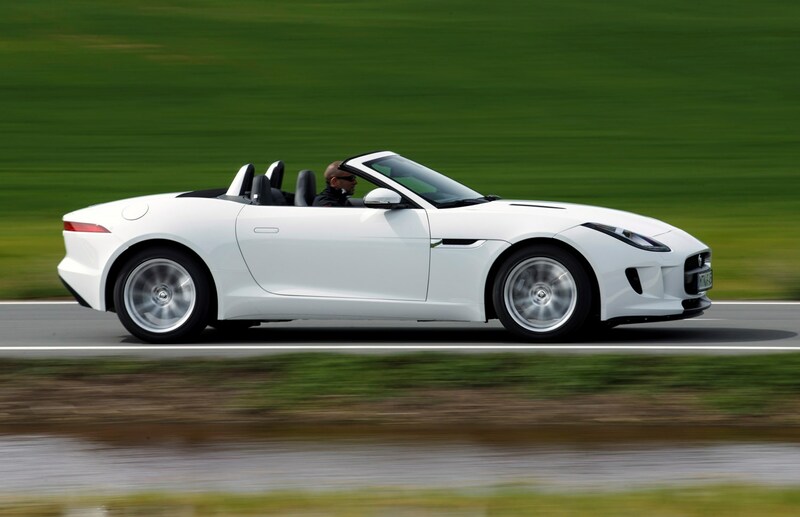 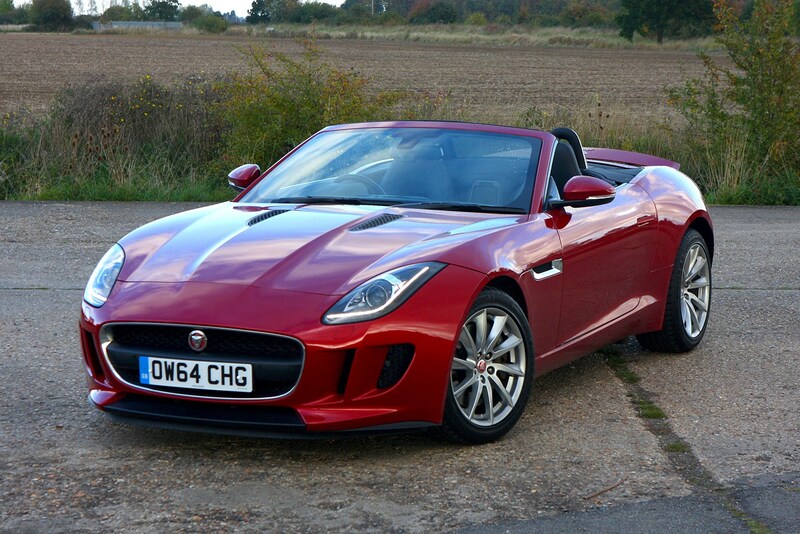 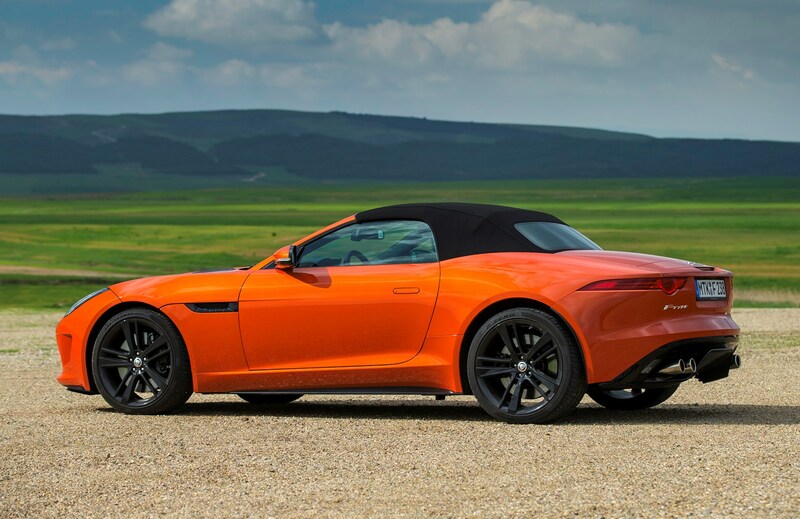 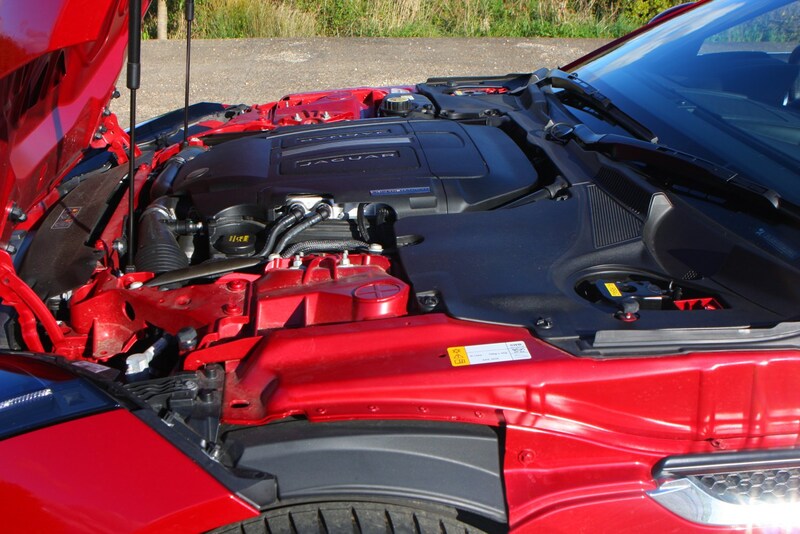 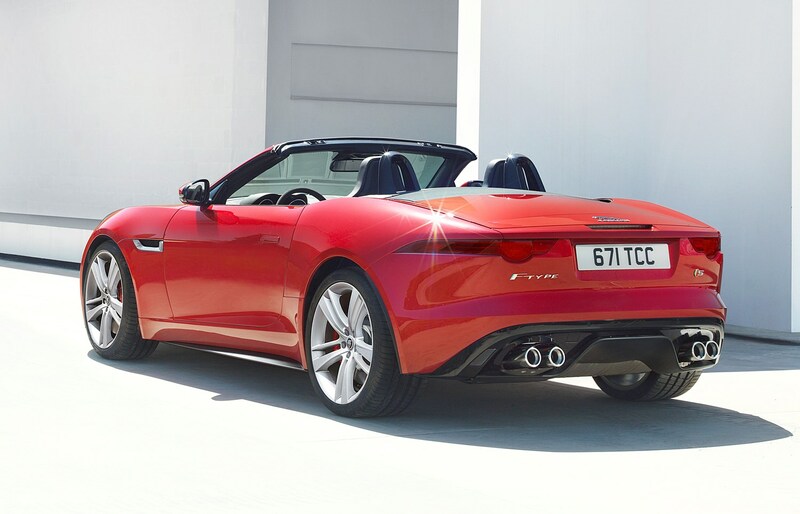 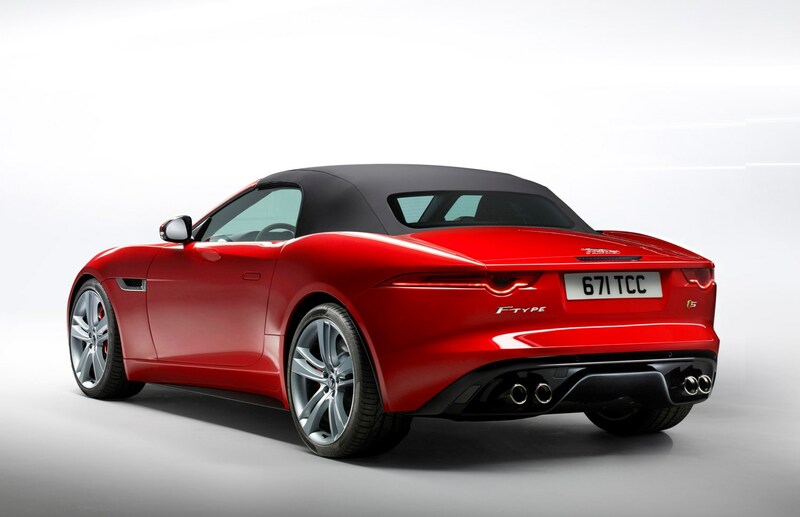 All versions of the F-Type are fitted with an eight-speed automatic with quick shifts. 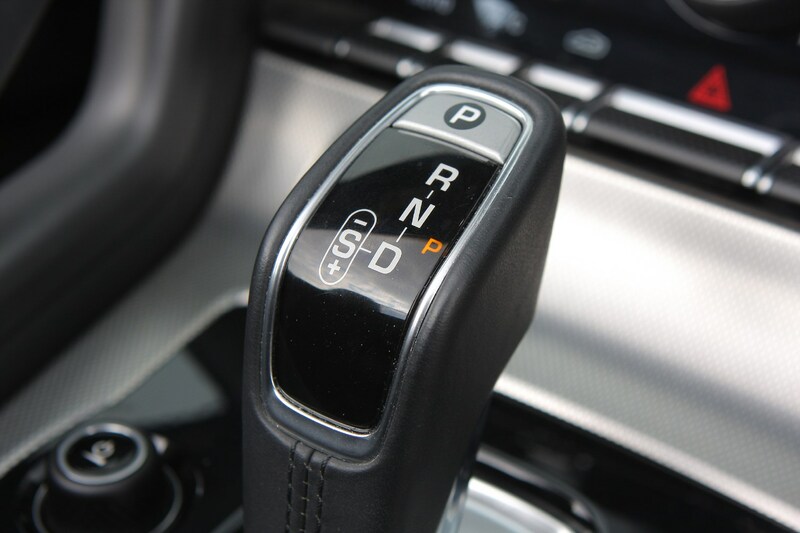 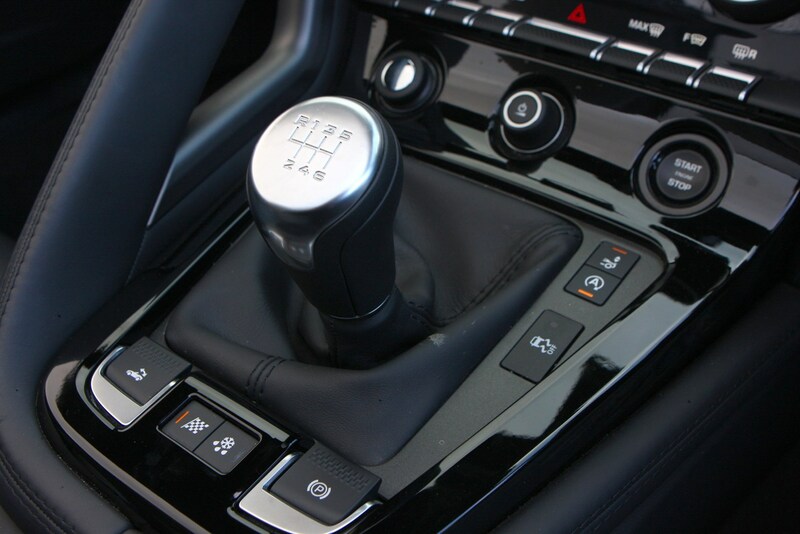 Three modes - automatic, sport and manual - are available and even in the former the gearbox responds really quickly. 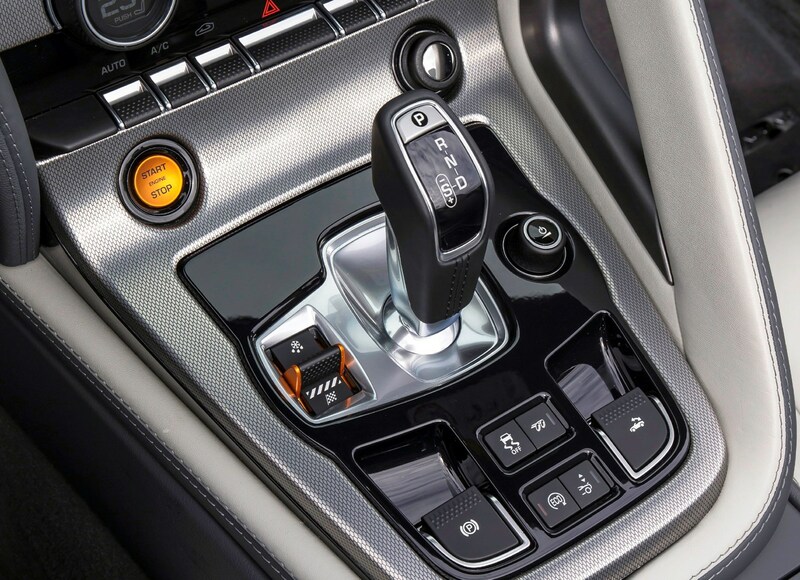 In Sport mode the shifts are quicker, while manual mode allows you to use the lever or steering-wheel mounted paddles to control the ratios. 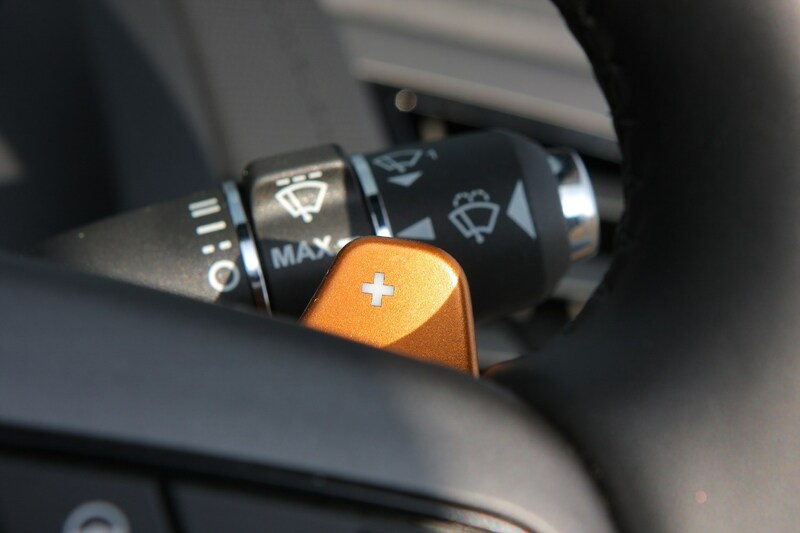 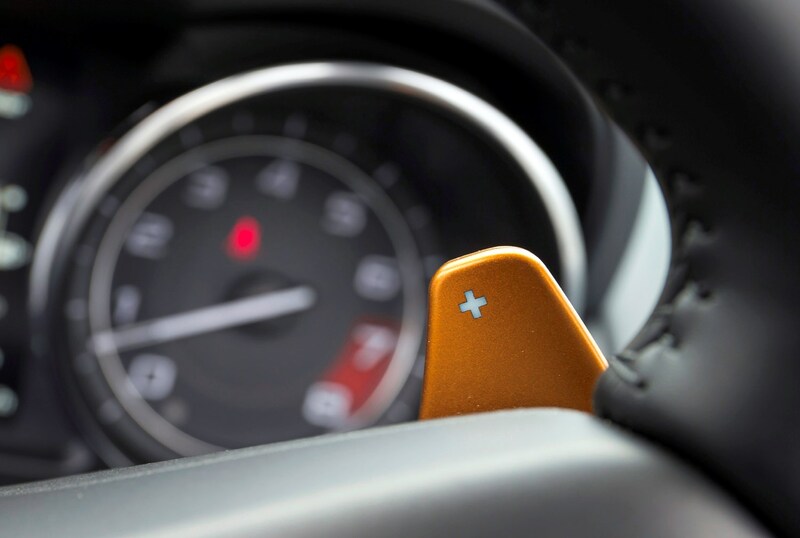 Switching to Sport by moving the lever over and engaging dynamic mode will see the box hold on to the gears for longer before shifting up, and throttle response is sharpened even further. 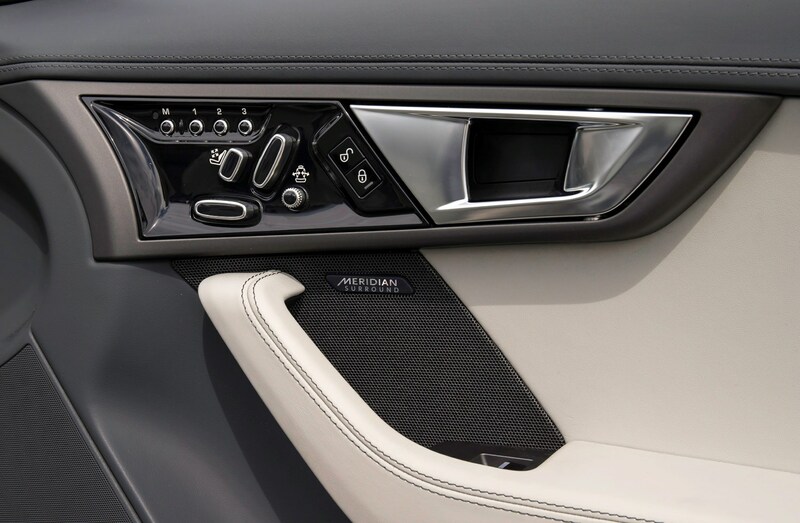 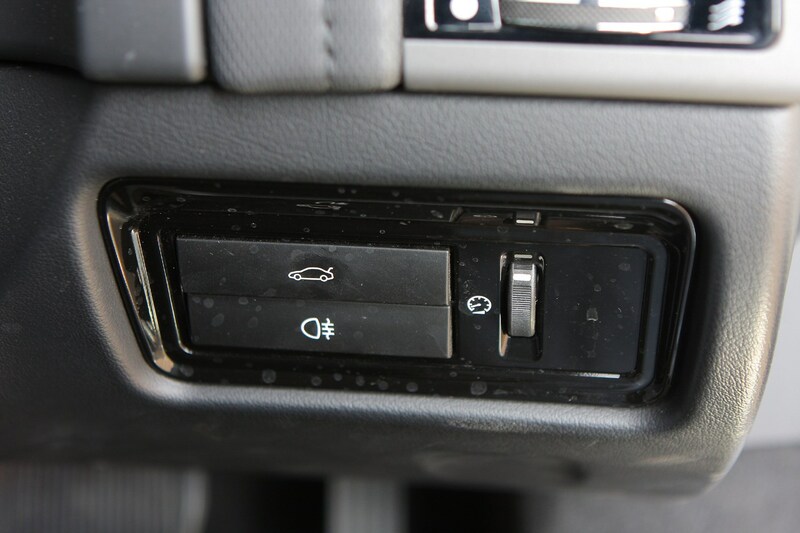 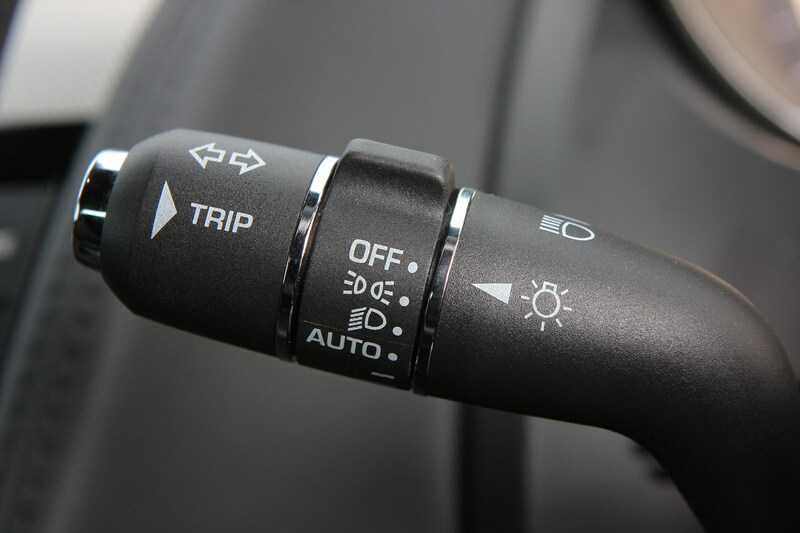 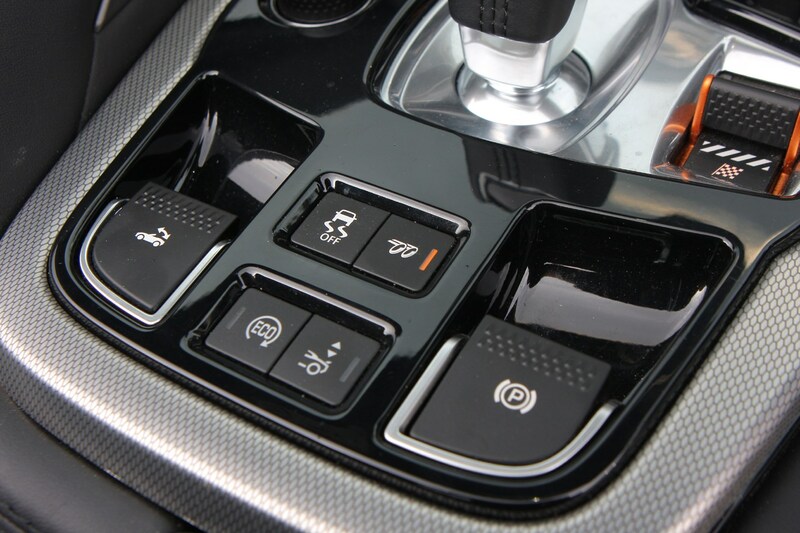 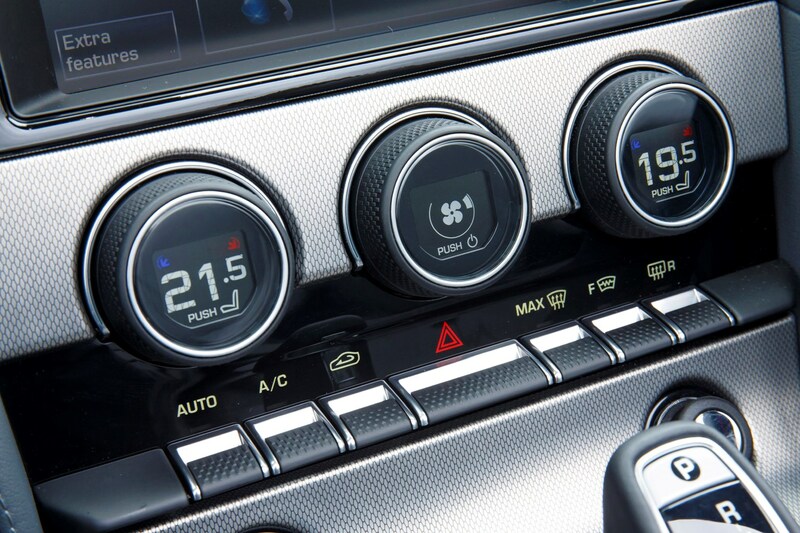 There is also a Dynamic Control switch mounted on the central console by the gear lever, enabling the driver to select how quickly they want the steering, gear changes and throttle to respond to their inputs. 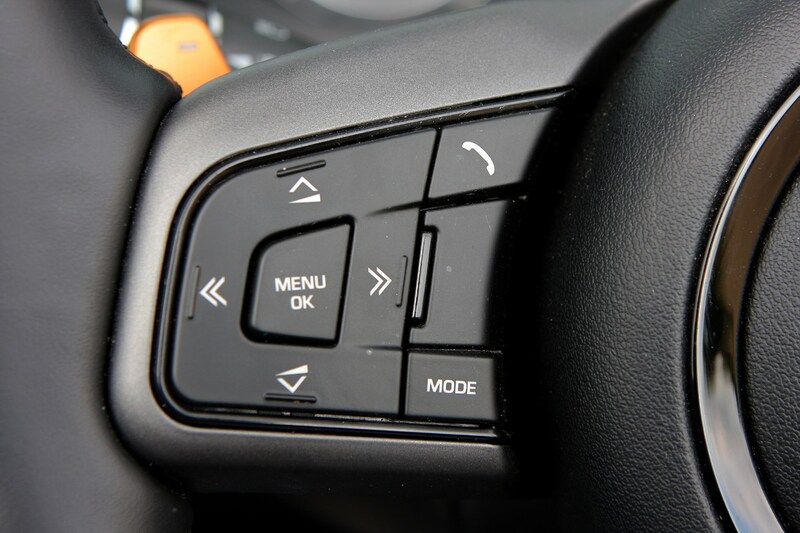 The option for drivers to configure bespoke settings is present too. 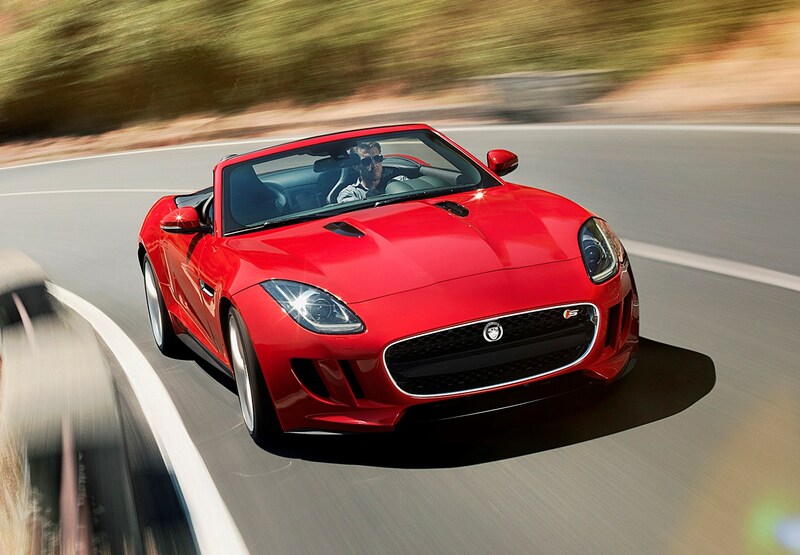 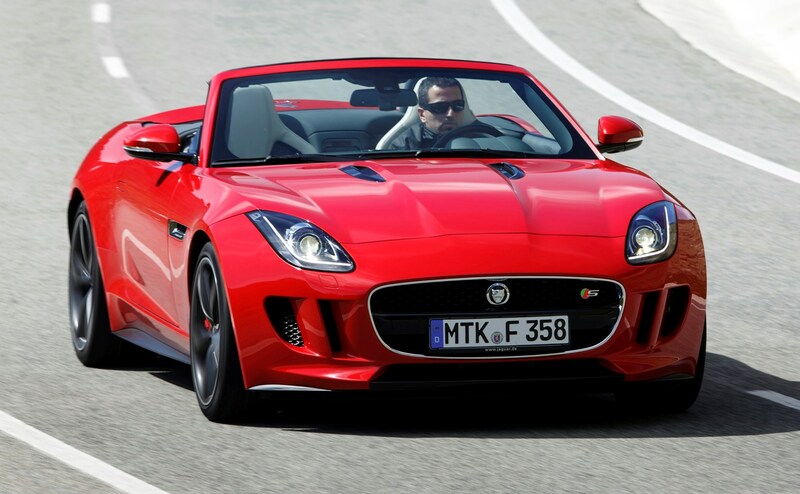 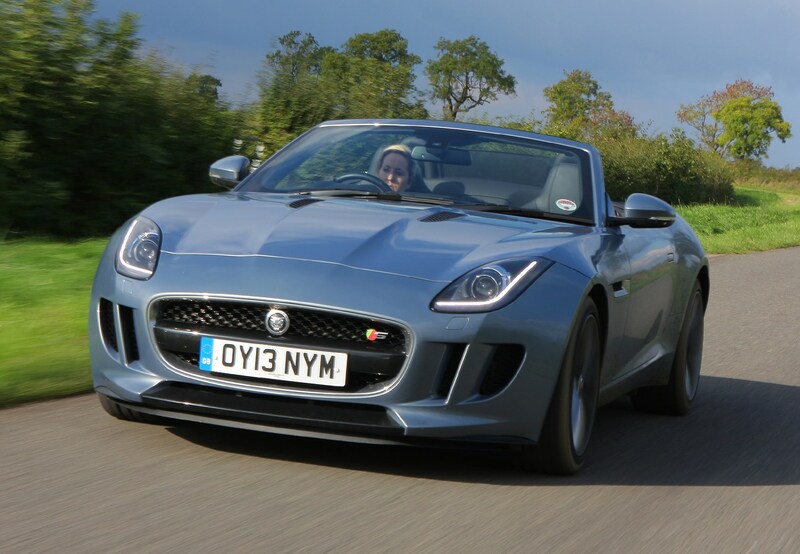 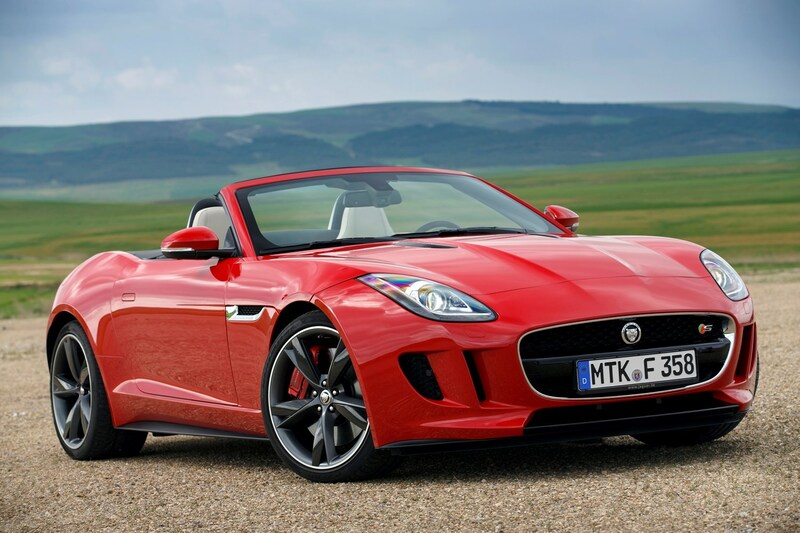 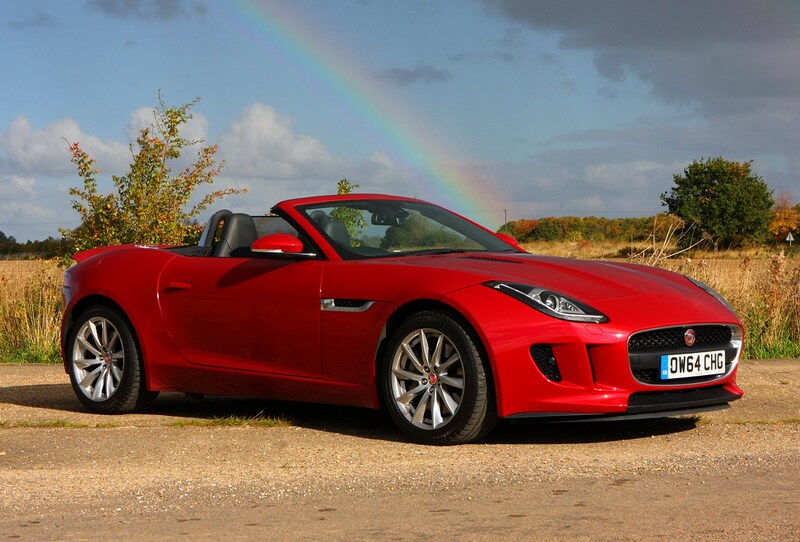 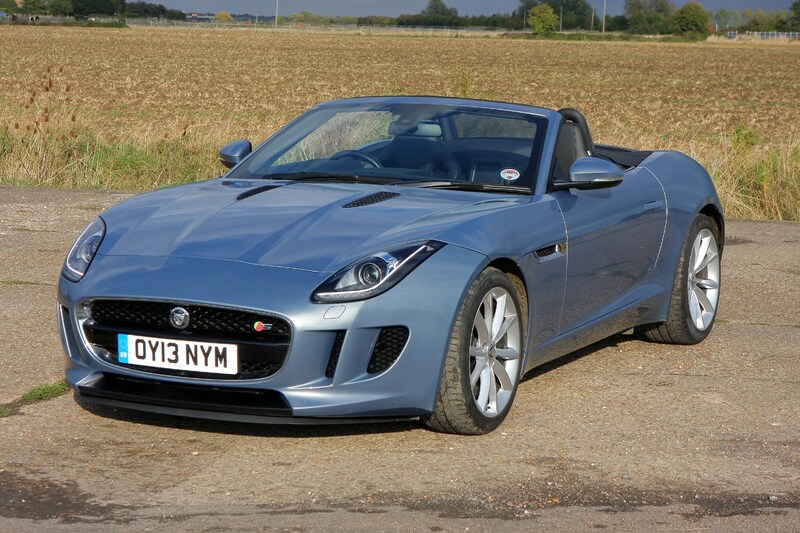 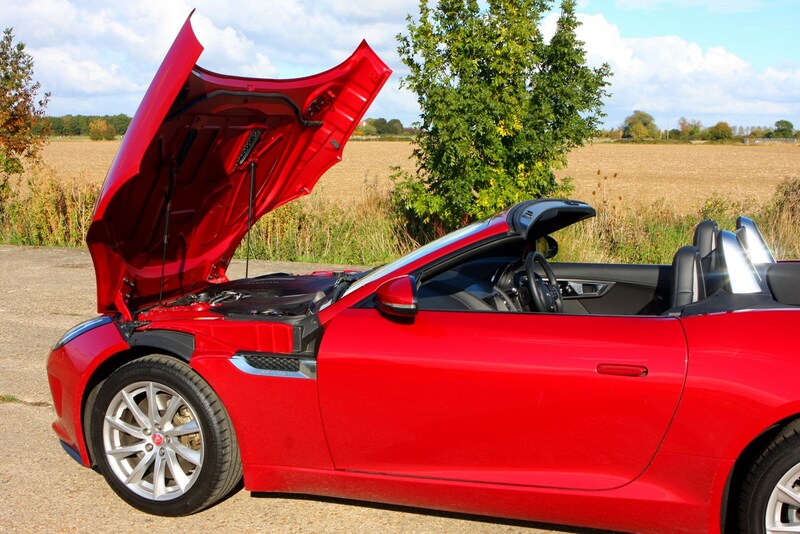 One of the outstanding points about the car is the Jaguar F-Type’s handling. 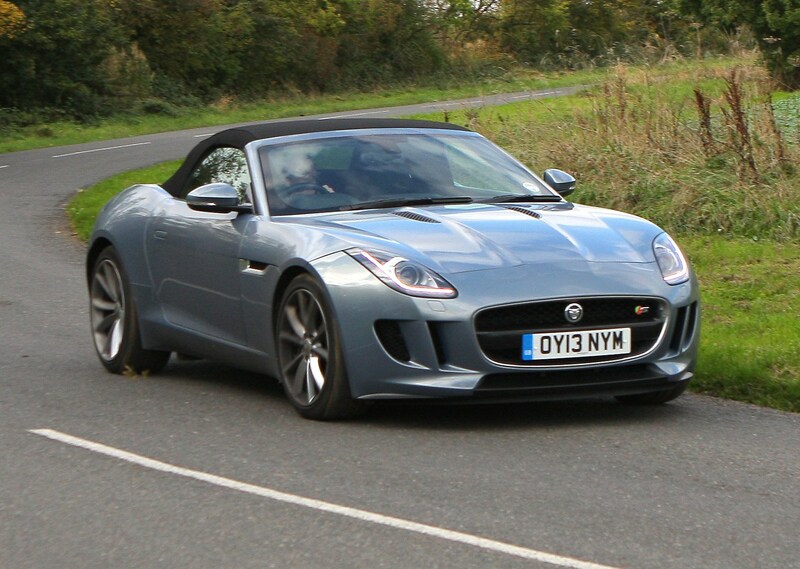 No matter what the road surface or how twisty the route, this is one car that relishes being thrown through a set of bends. 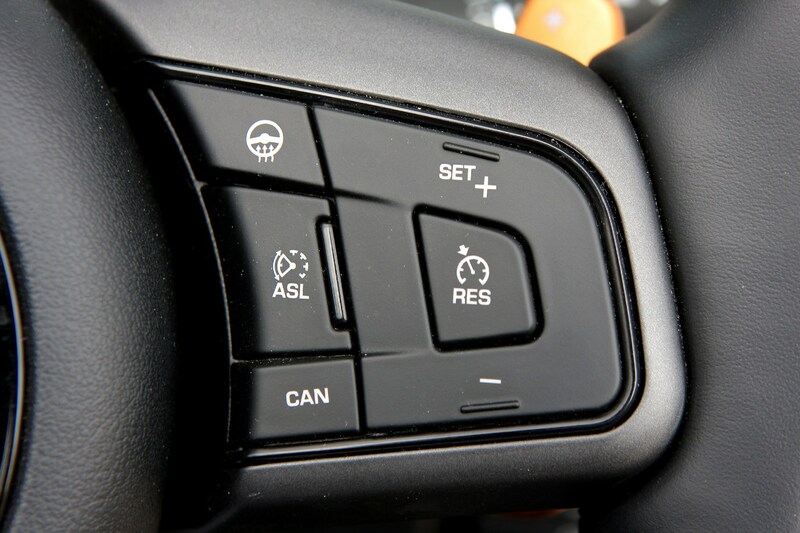 The steering wheel is quick to respond to any changes in direction and feels very precise when plotting a line through a corner. 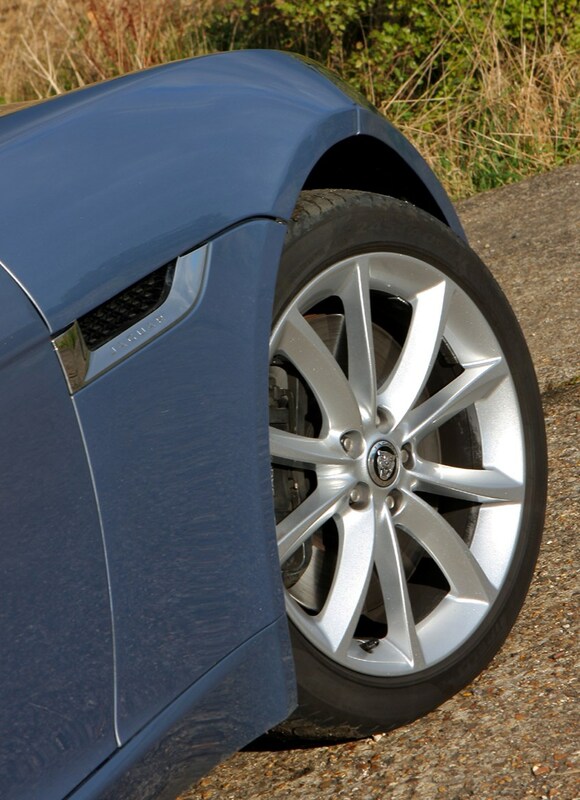 Even if you get it wrong and need to tighten that line, the adjustment is only a millimetre flick of the wrist away. 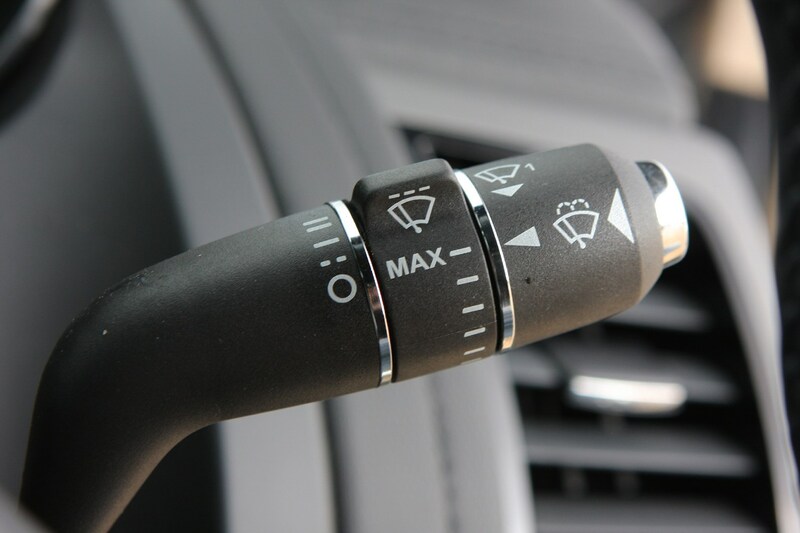 The only negative mark is down to feedback through the helm. 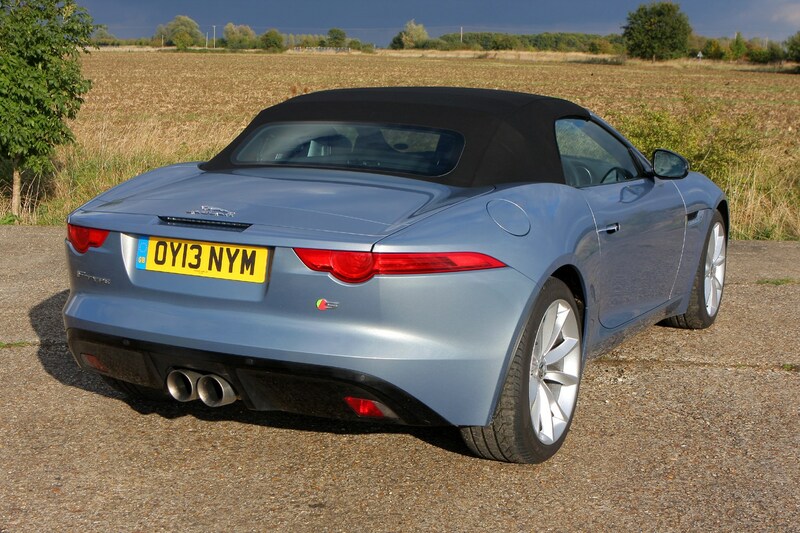 It's just not as sharp as say a Porsche Boxster for example. 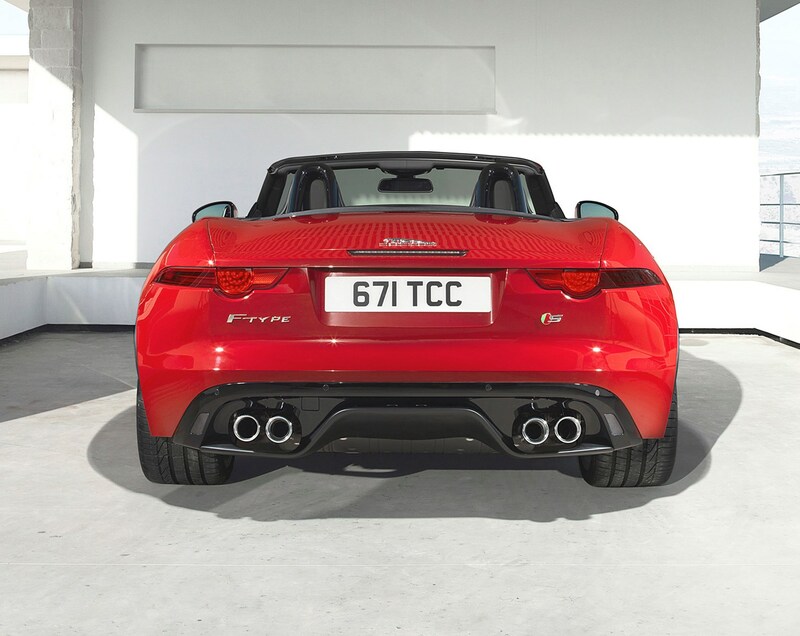 There's plenty of grip, but it's hard to feel exactly what the front tyres are gripping - though the feedback through the rest of the chassis is spot-on. 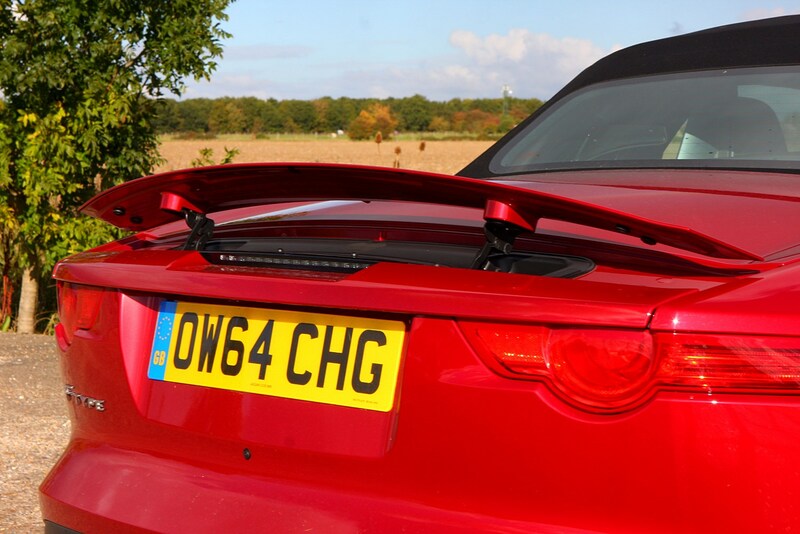 The V8 S version requires a little more planning with corners, its extra weight meaning it's not quite as agile as the lighter V6 version - but it makes up for this with sheer grunt. 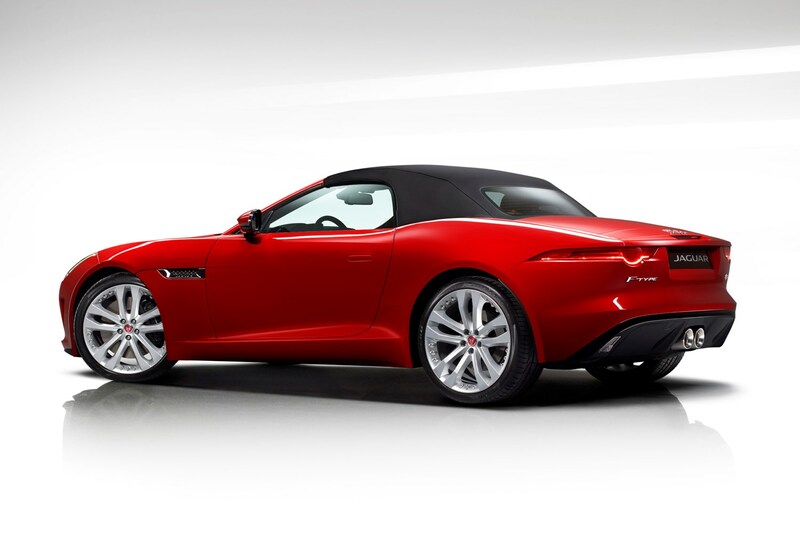 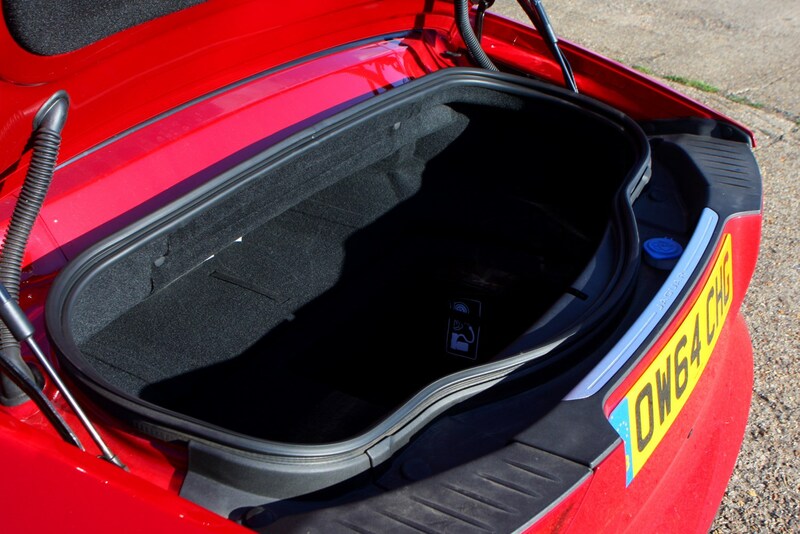 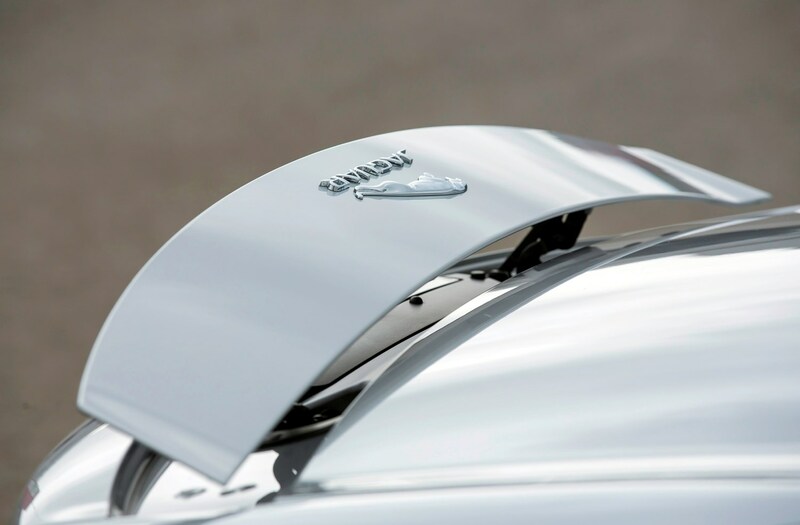 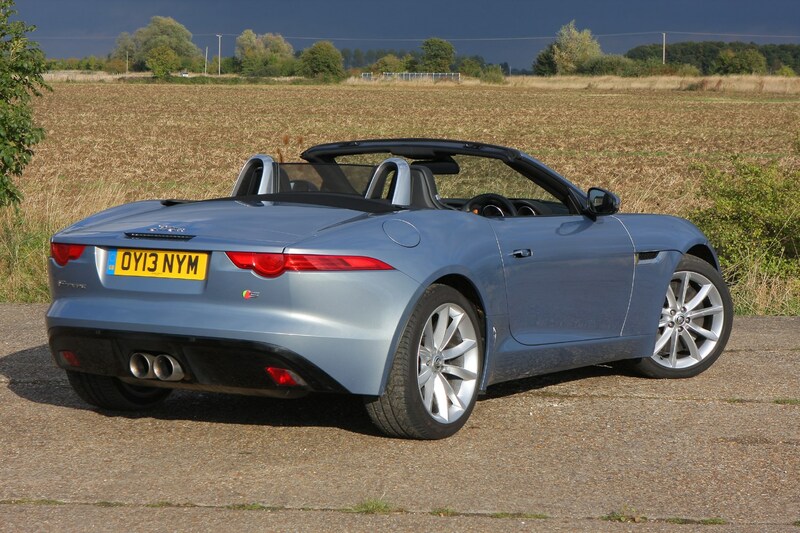 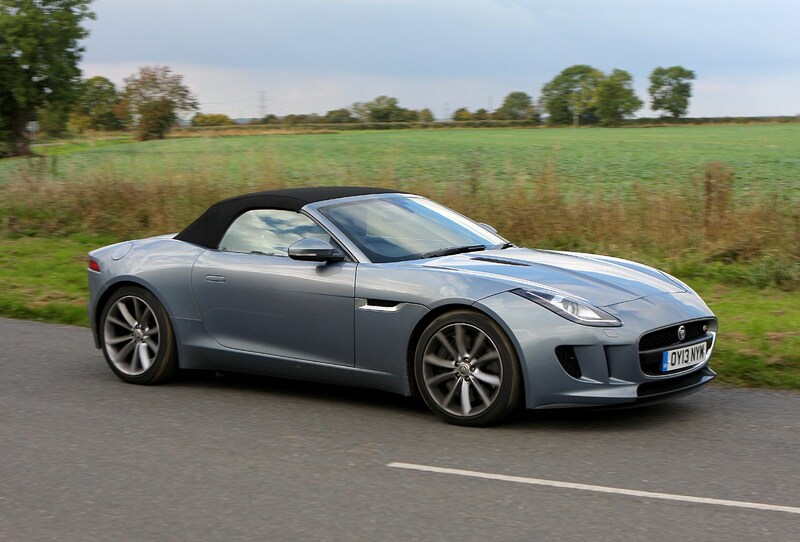 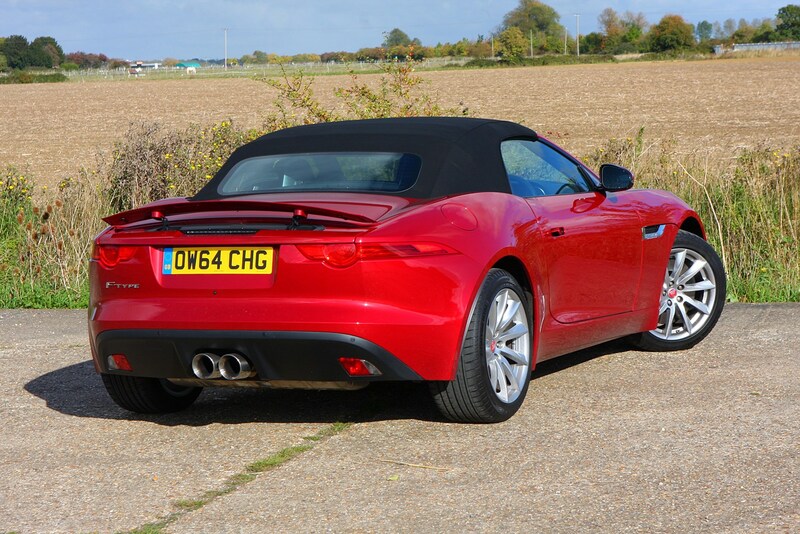 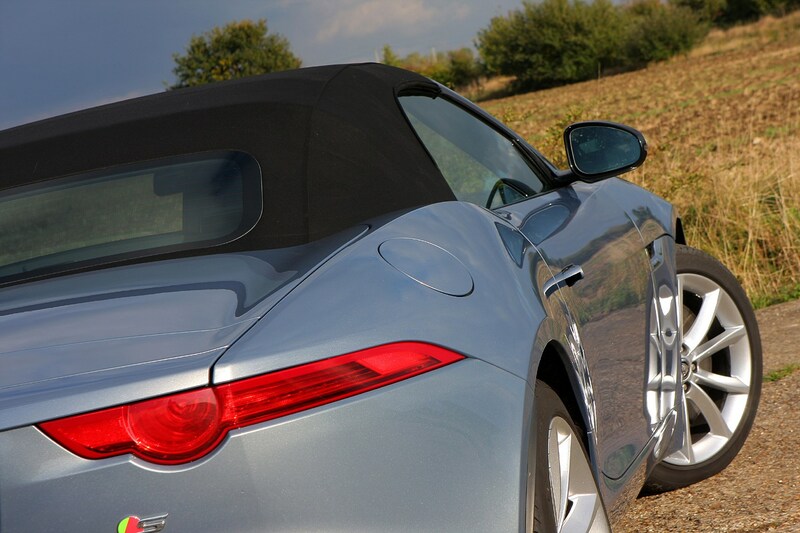 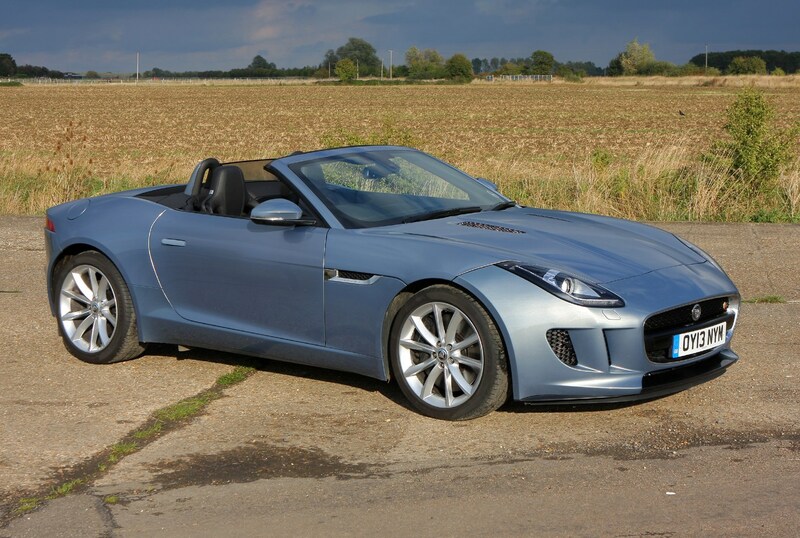 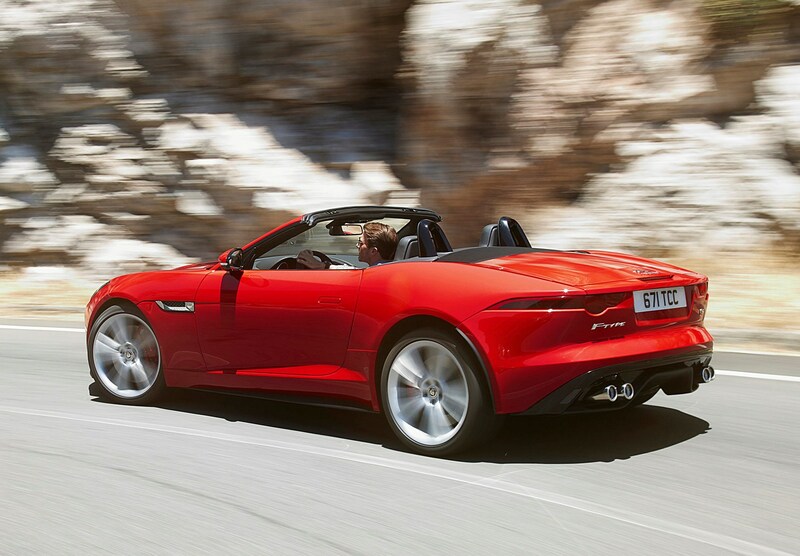 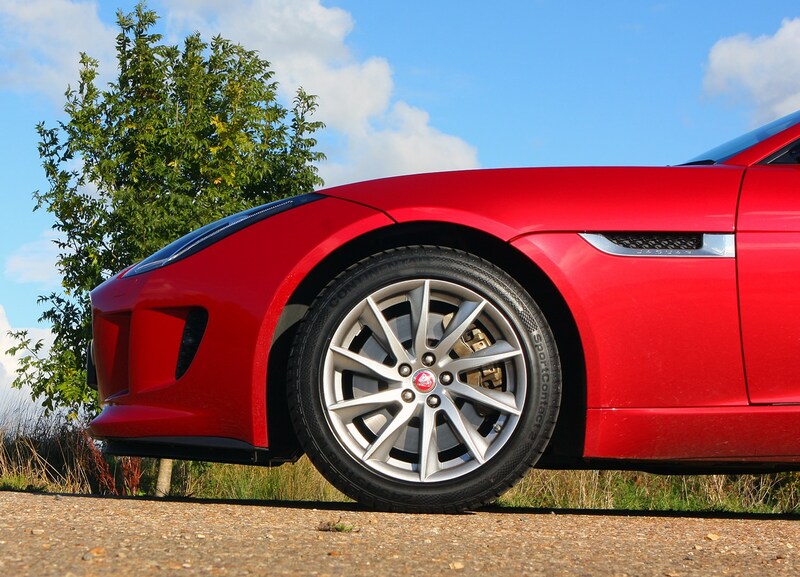 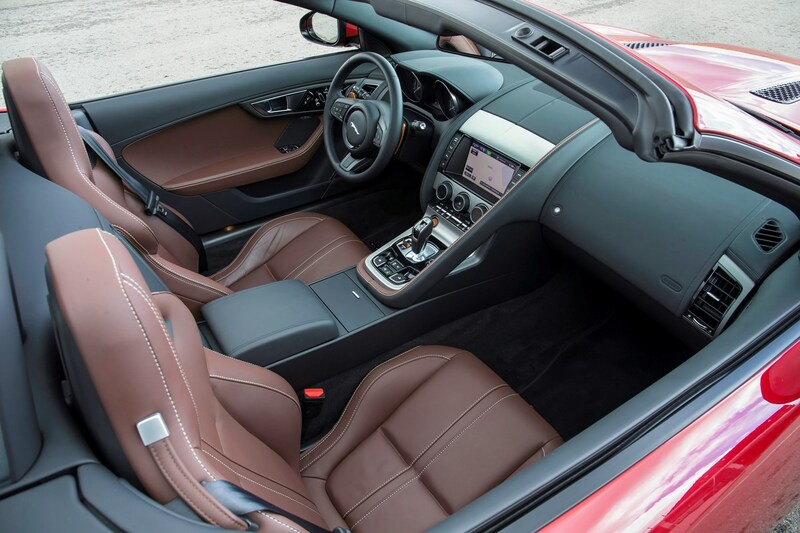 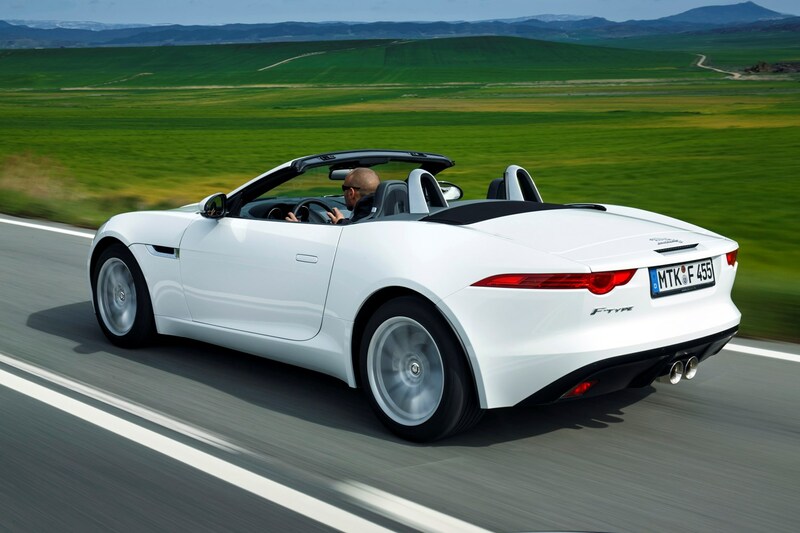 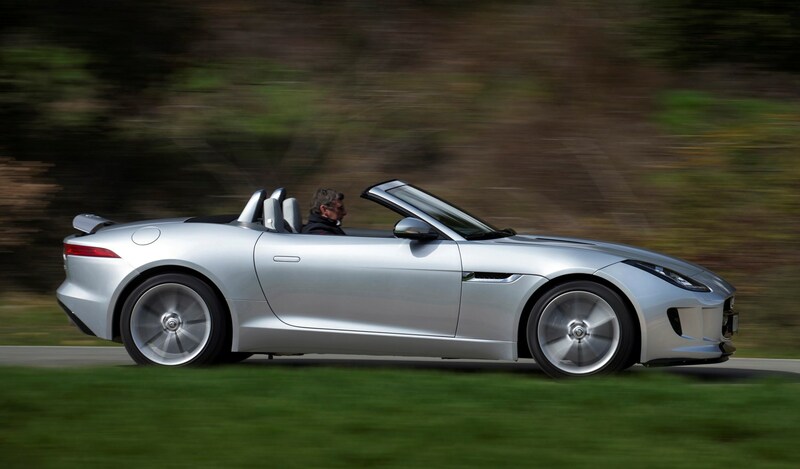 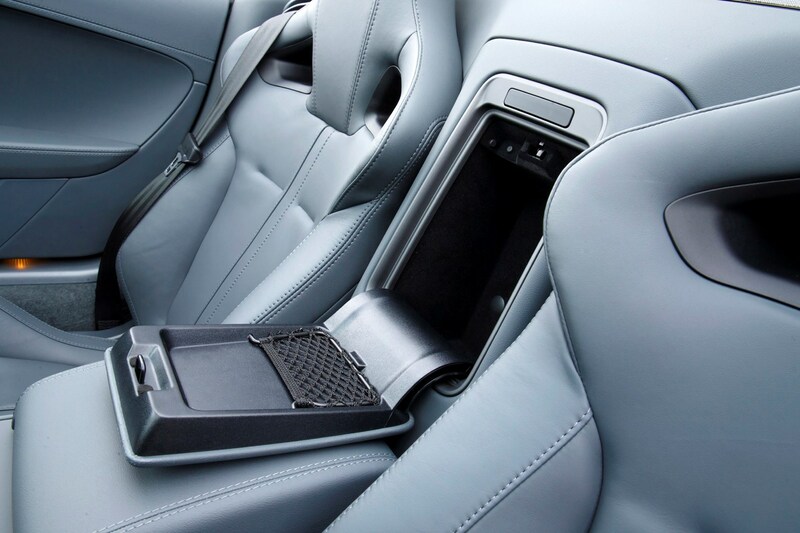 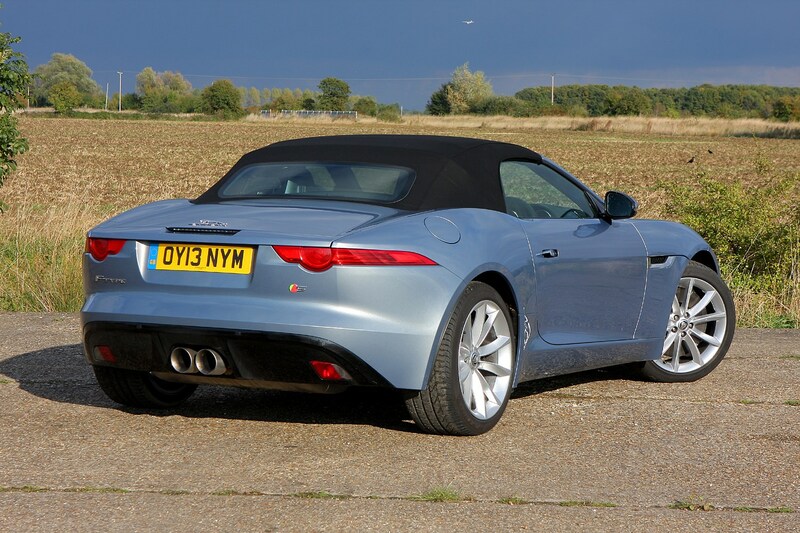 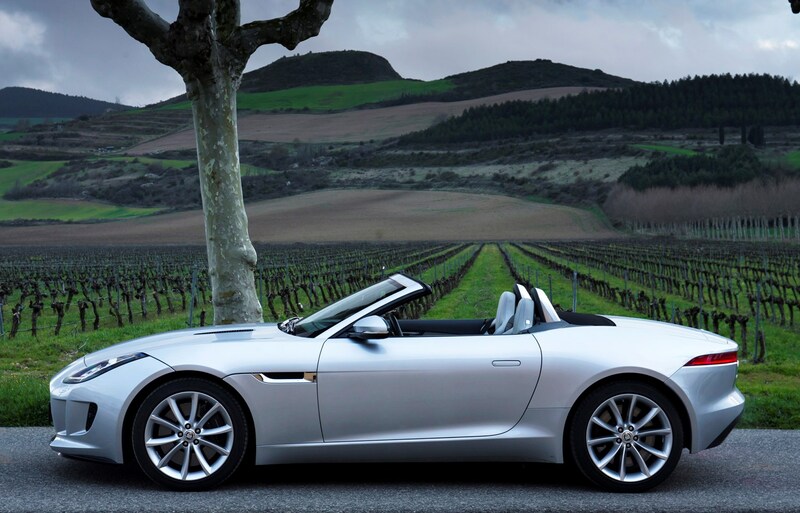 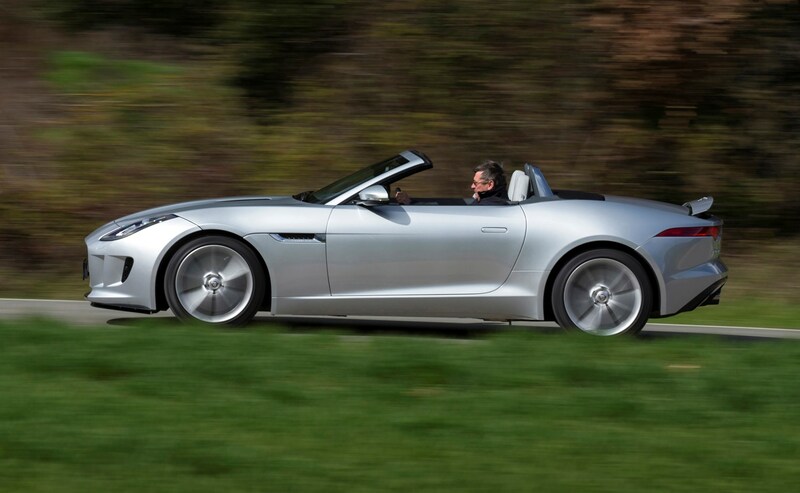 On all F-Types the ride is extremely compliant and the car maintains its composure no matter the road surface. 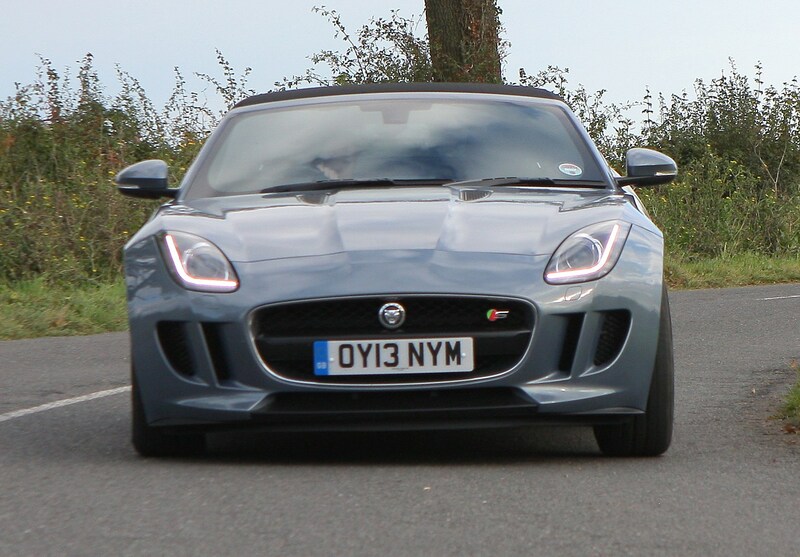 All of which allows the driver to focus on zipping from one corner to the next without worry, a wide grin stretching accross their face. 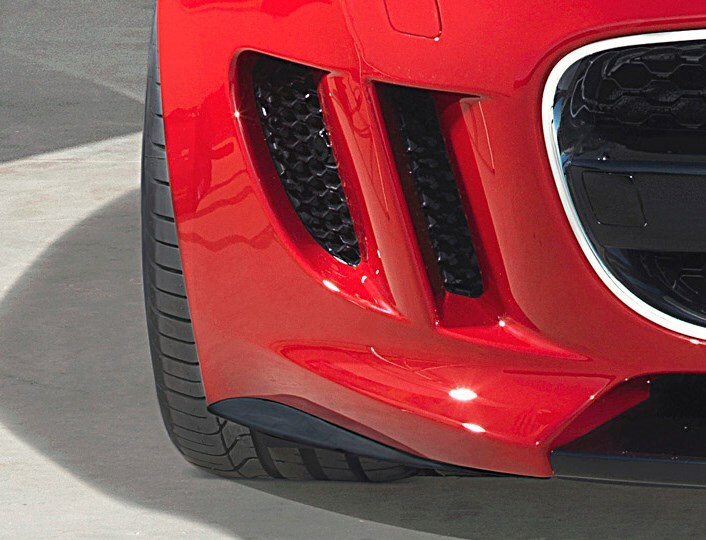 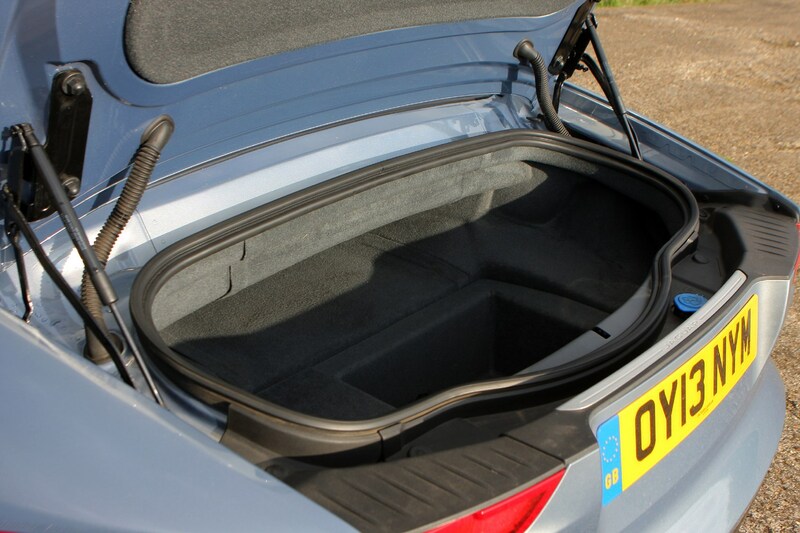 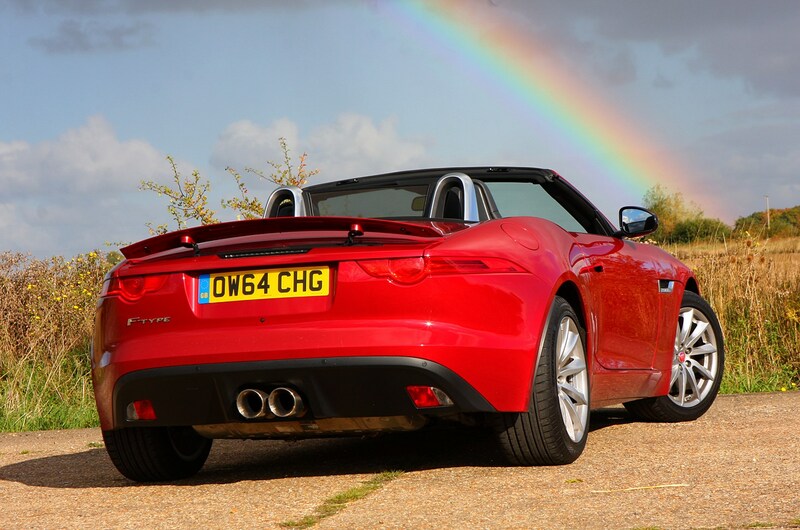 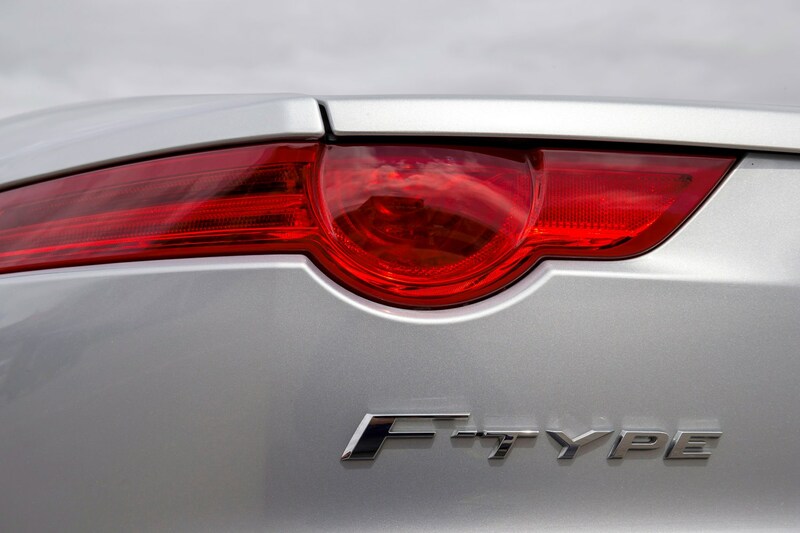 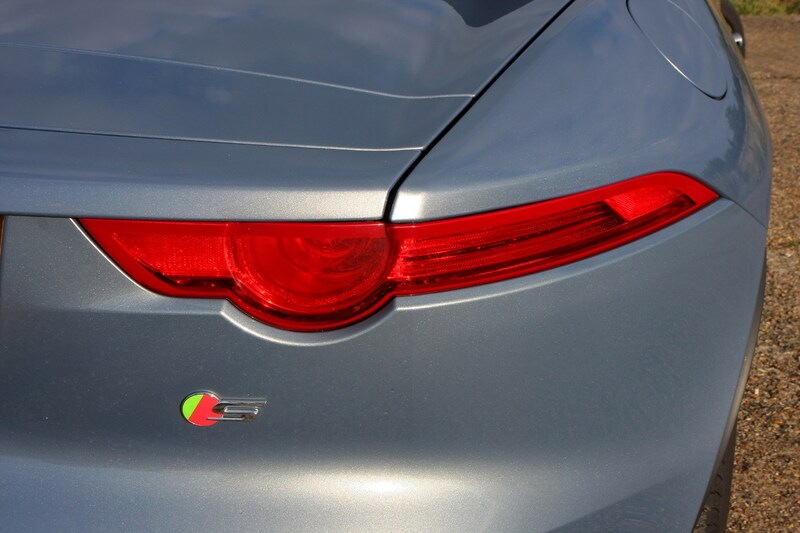 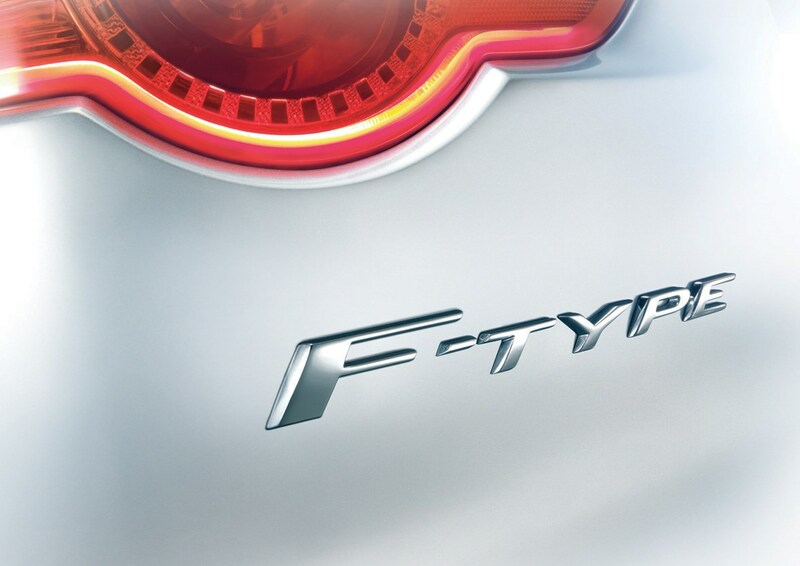 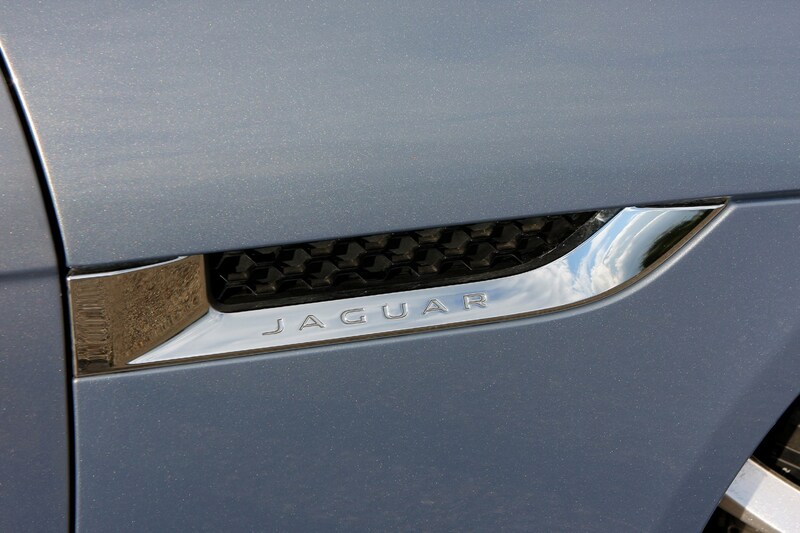 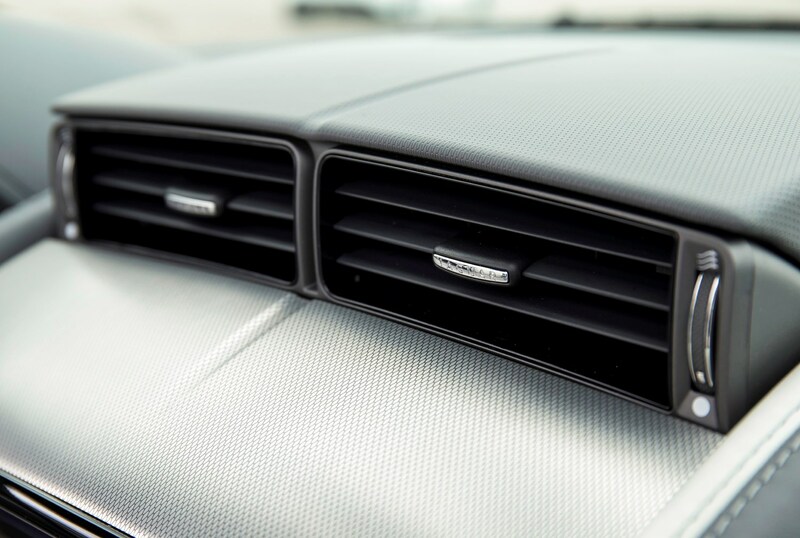 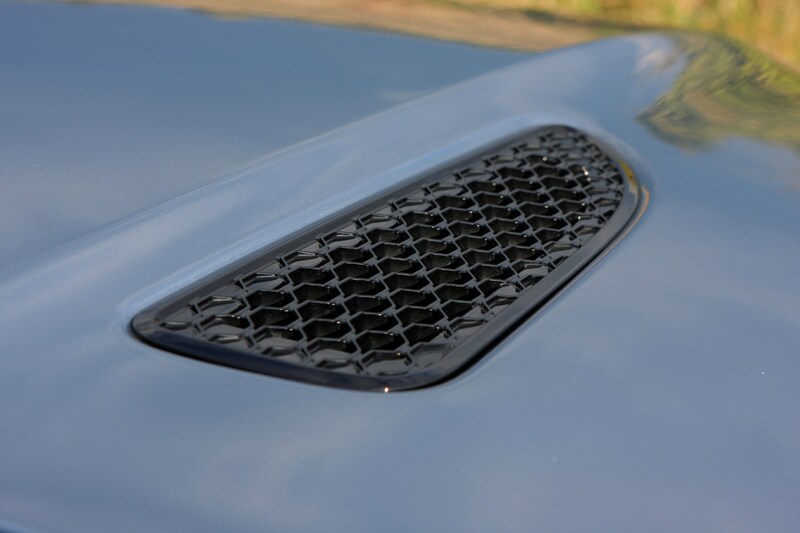 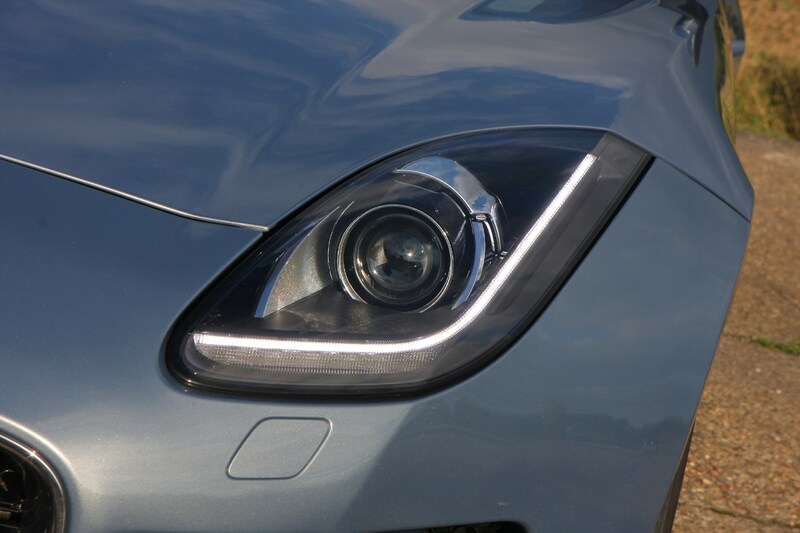 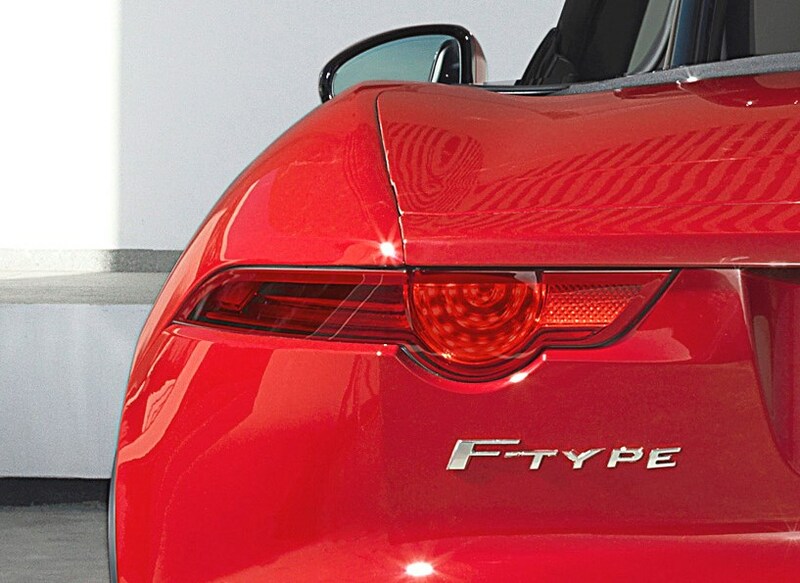 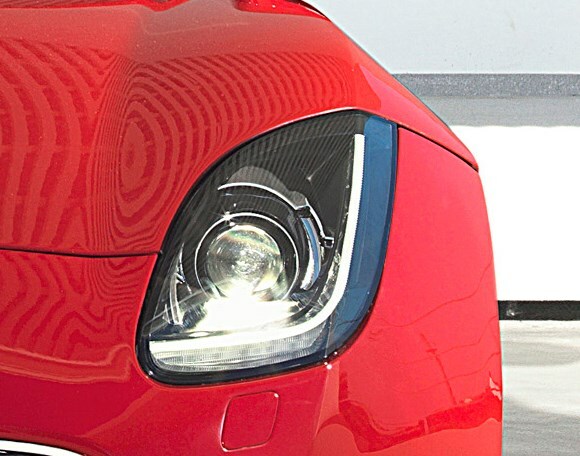 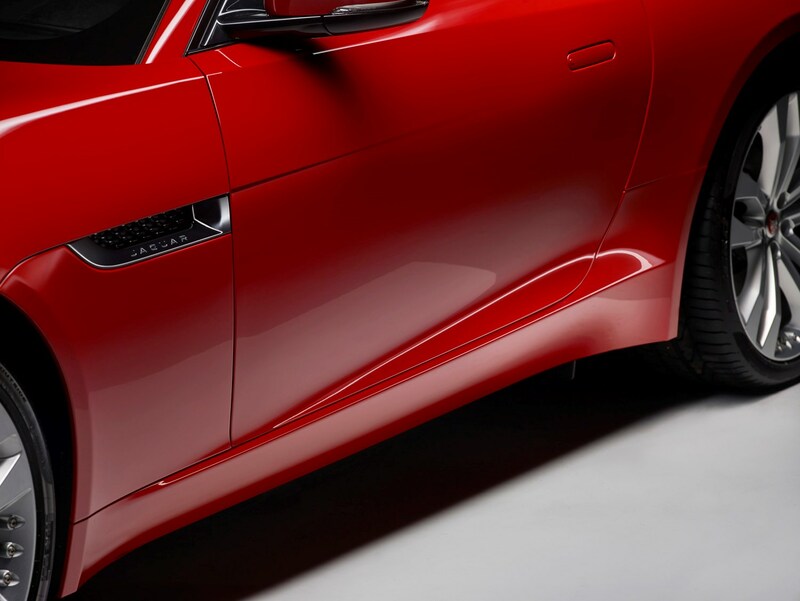 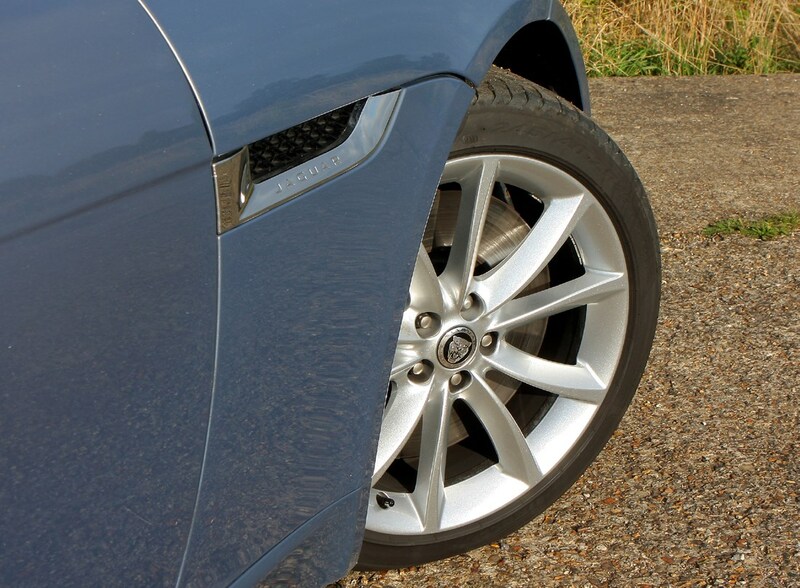 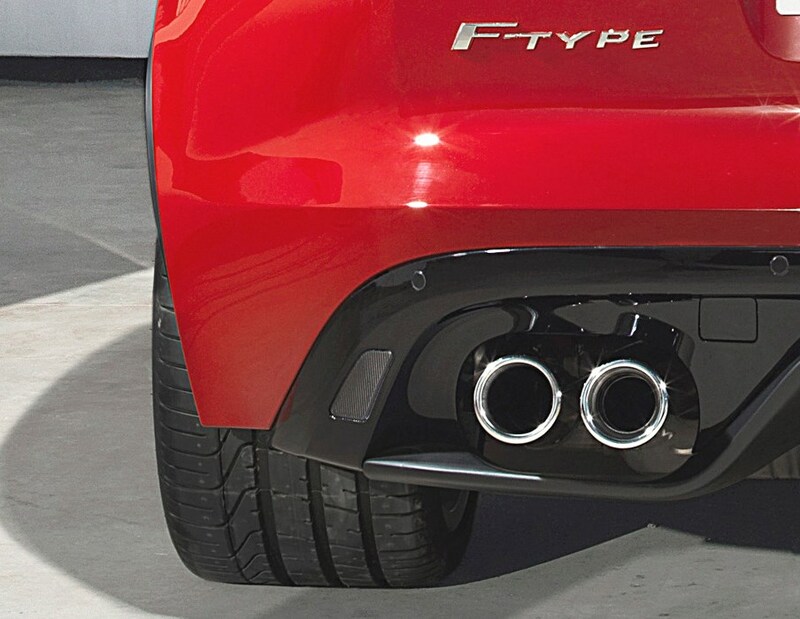 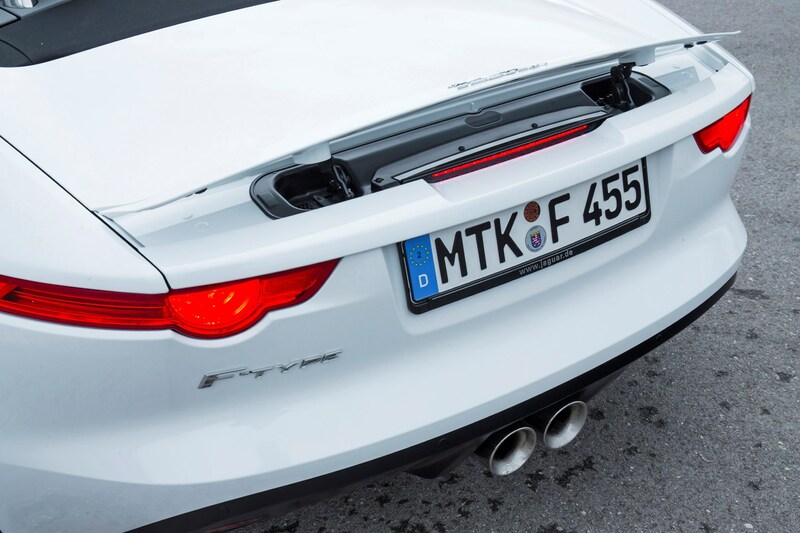 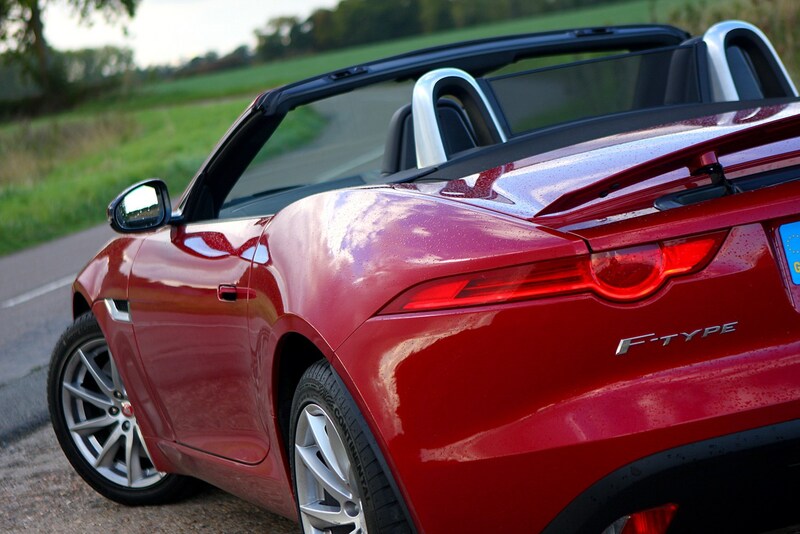 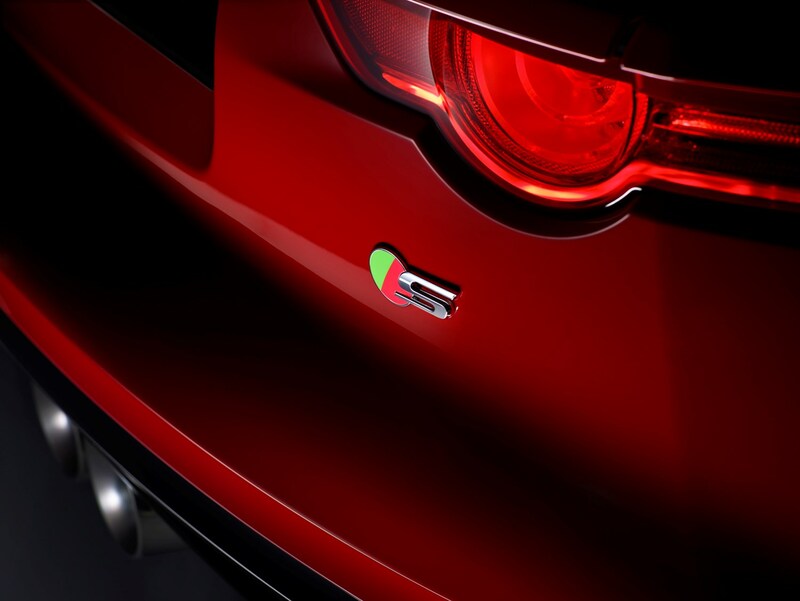 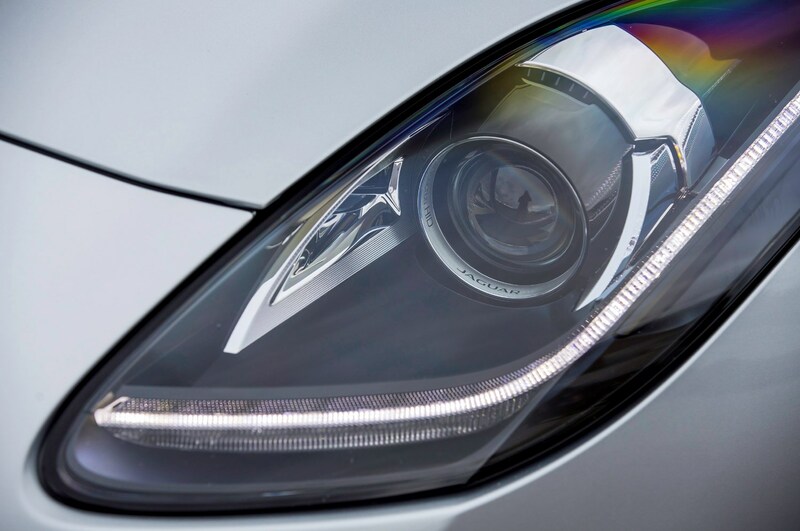 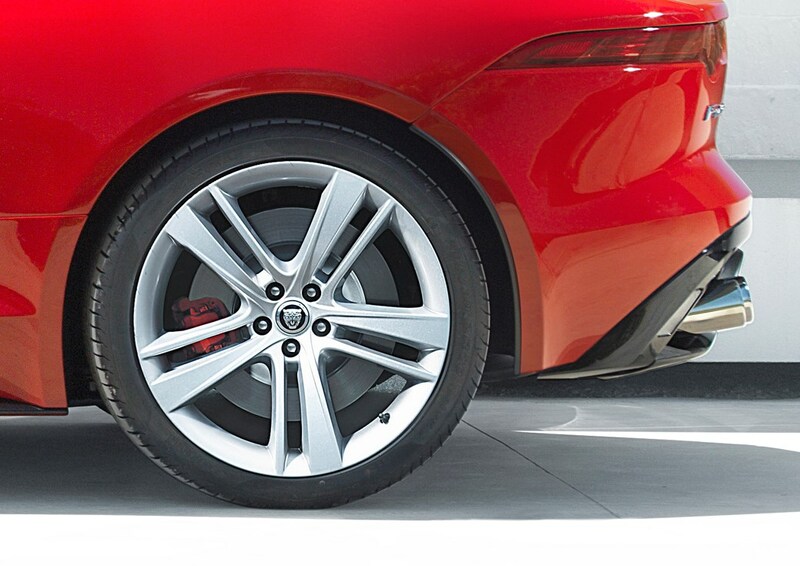 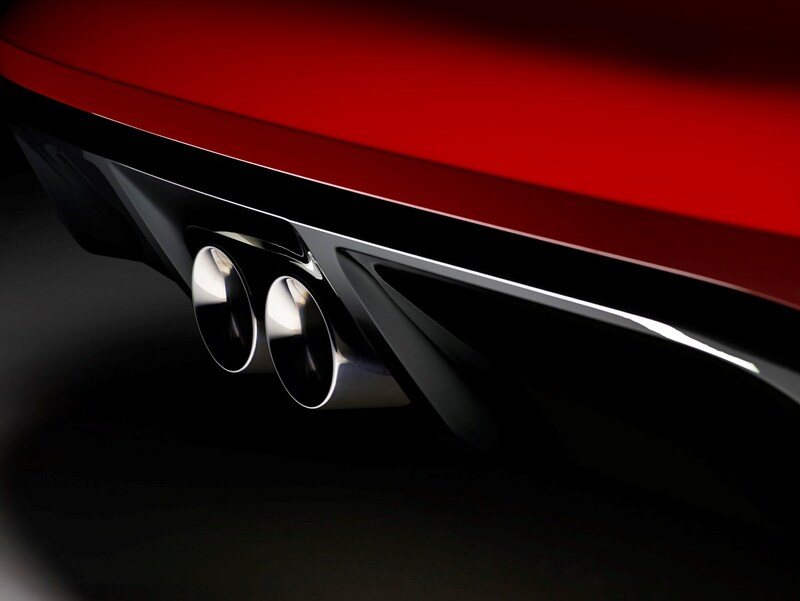 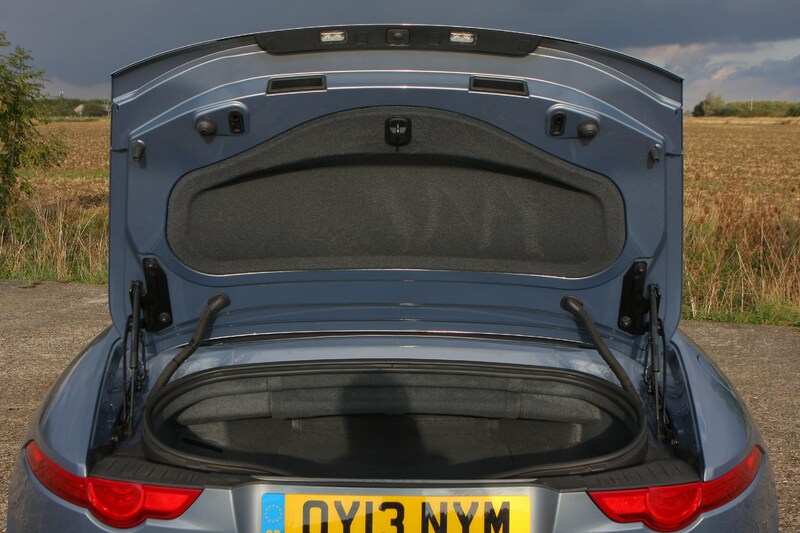 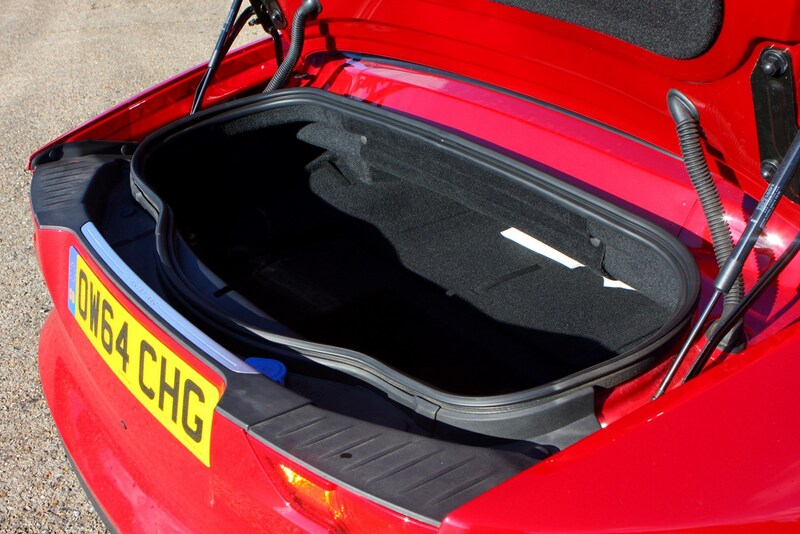 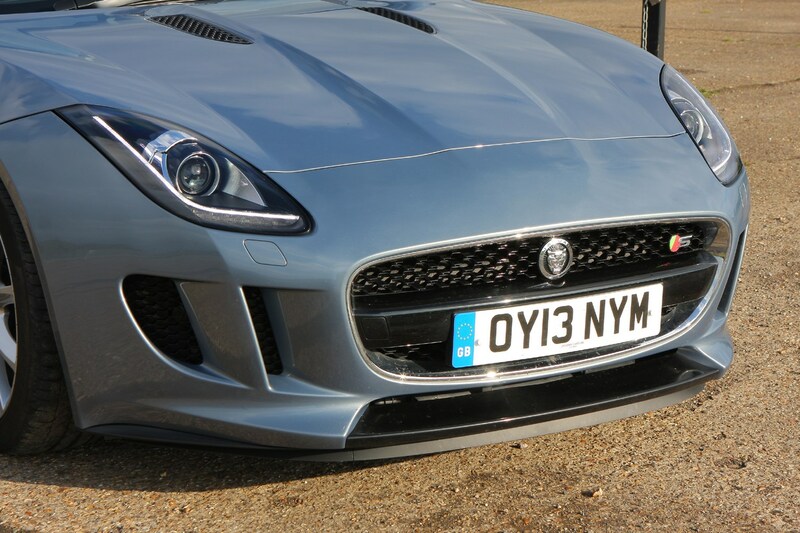 It's a real stand out point about the F-Type. 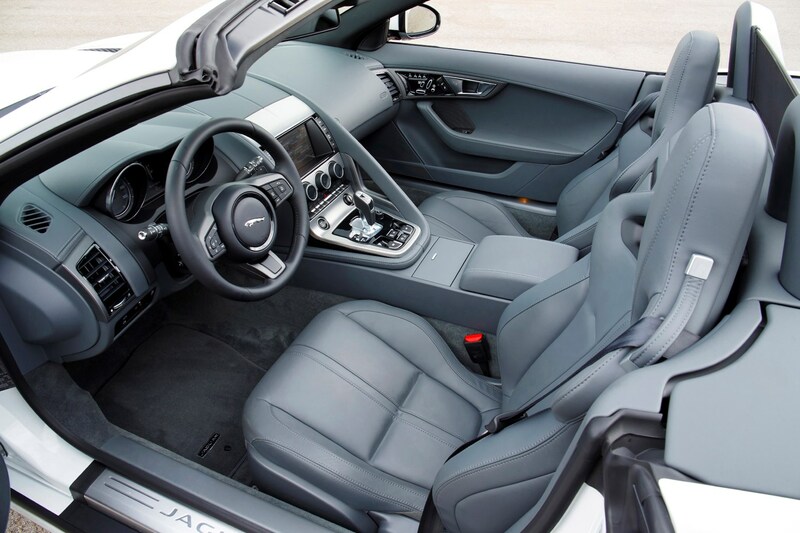 The place you want to be. 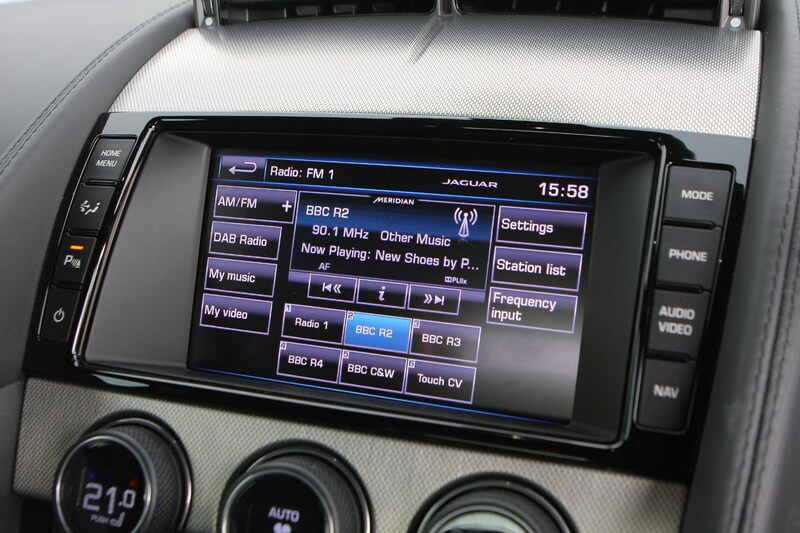 Everything is focused on the driver from the main instruments to the touchscreen in the centre dash. 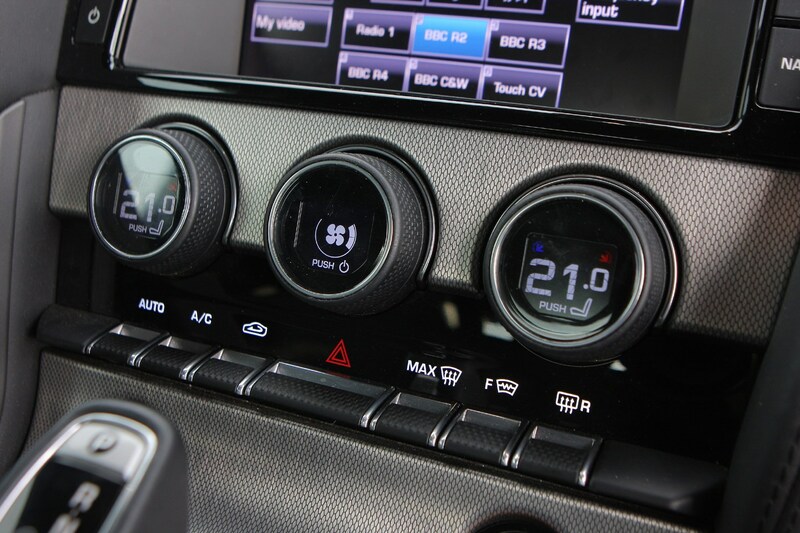 The rubber coated toggle switches are tactile and a pleasure to operate, and the same applies to the rotary air con controls. 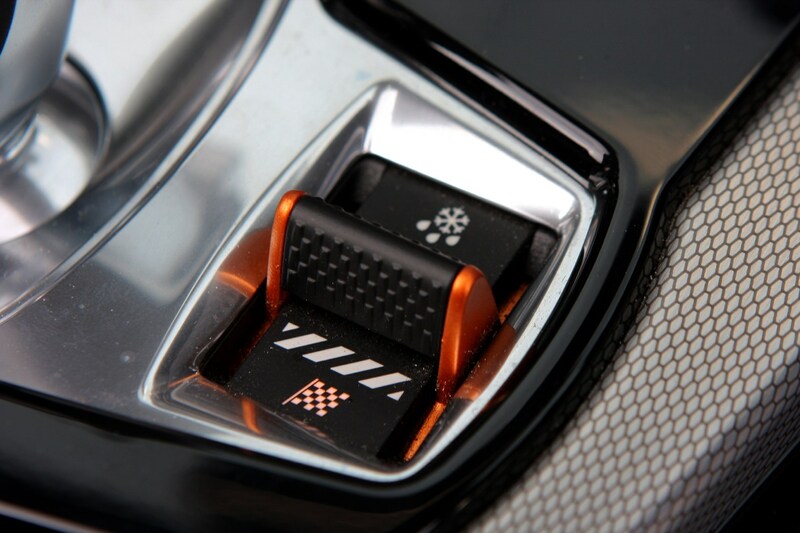 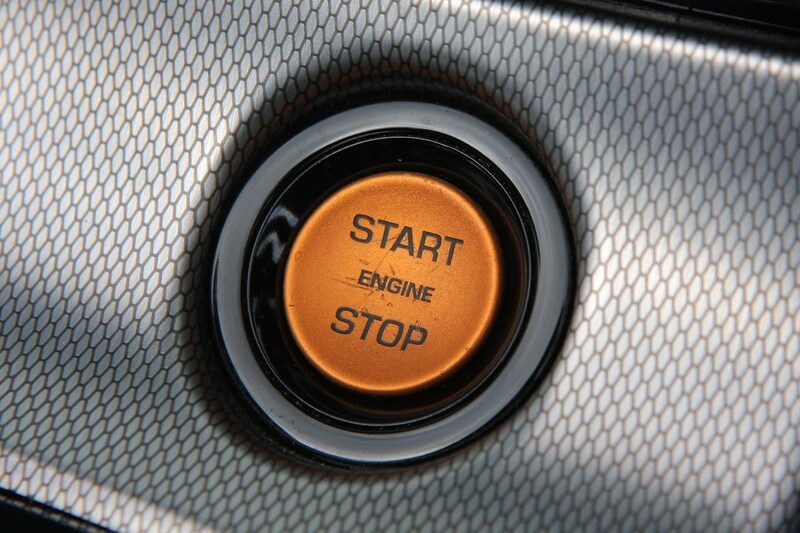 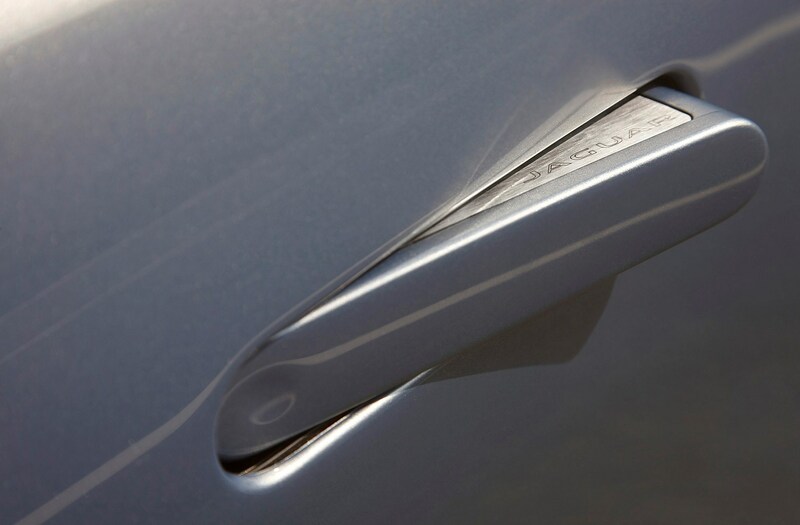 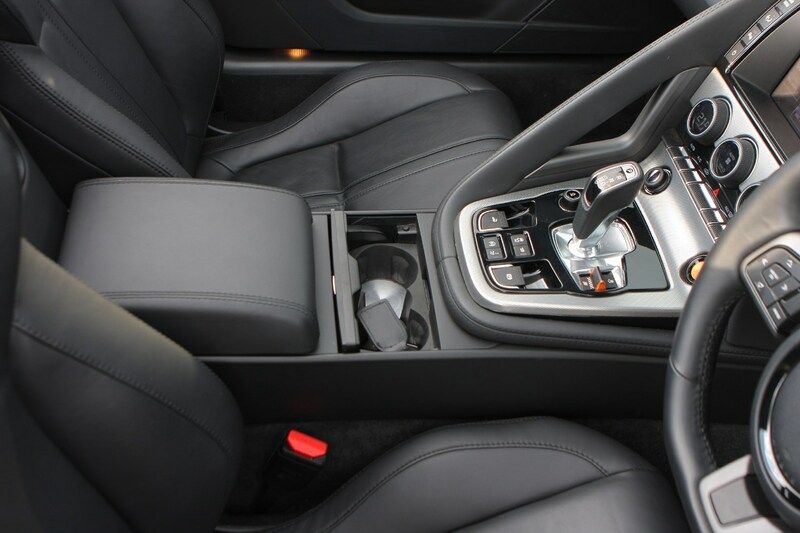 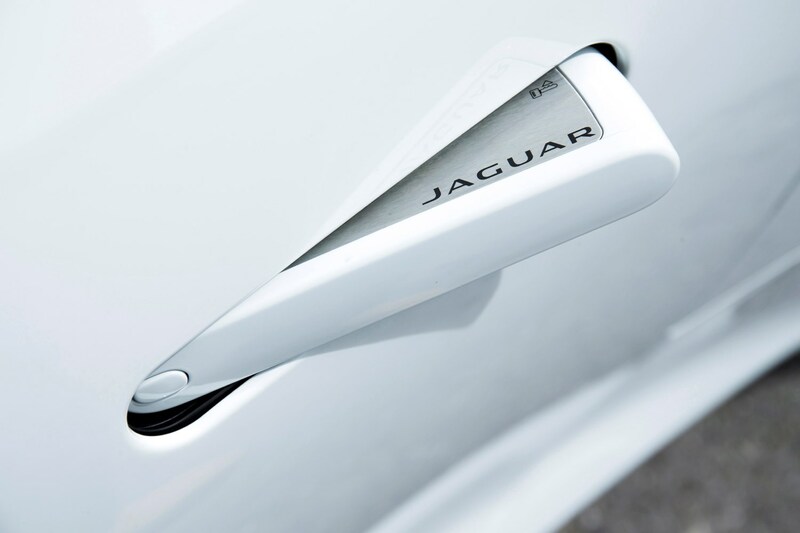 All F-Types come with keyless start so there is a stop/start button positioned just forwarded of the gear lever, plus the electrical seat adjustment is mounted by the door handle. 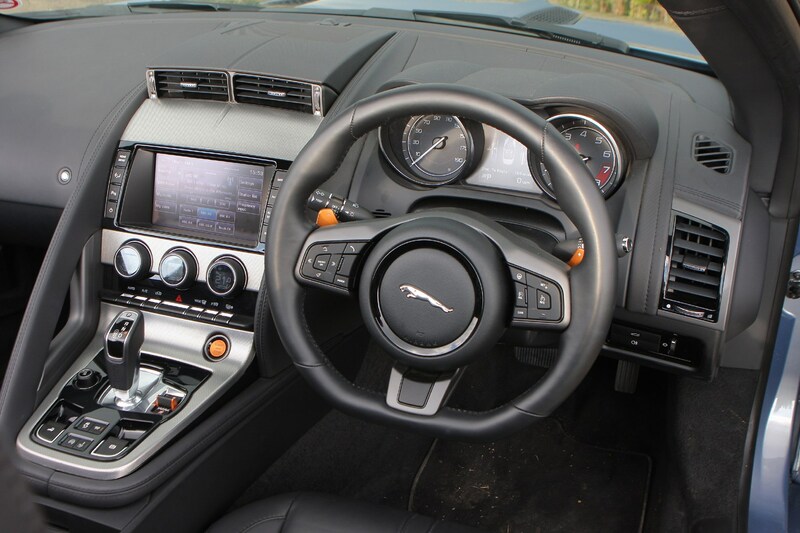 It all adds up to a very hands-on experience that thoroughly engages the driver. 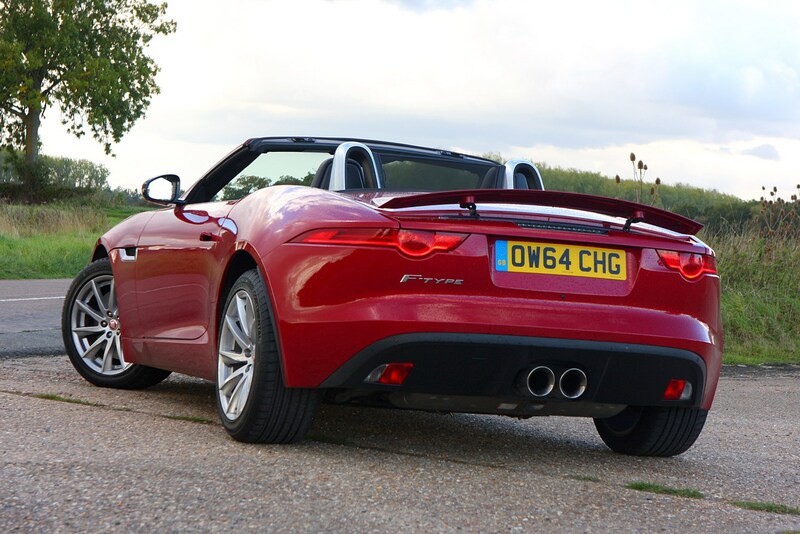 This may be a two-seater sports car but Jaguar F-Type comfort levels are very good. 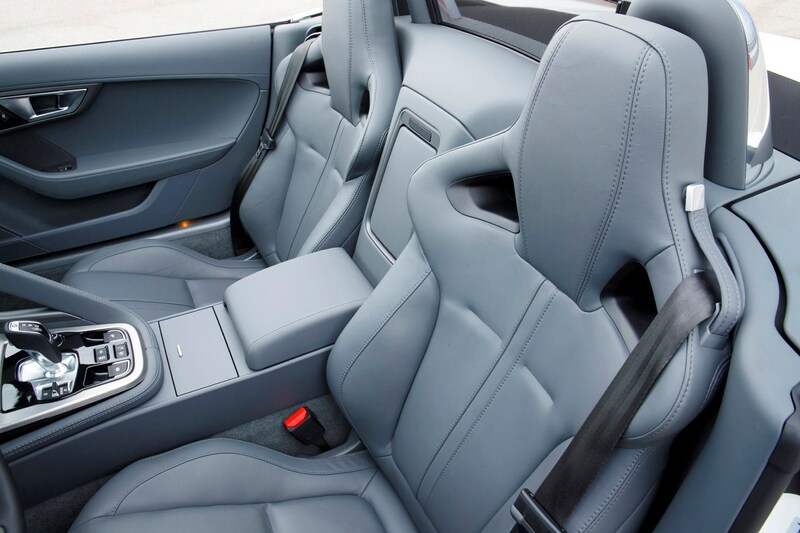 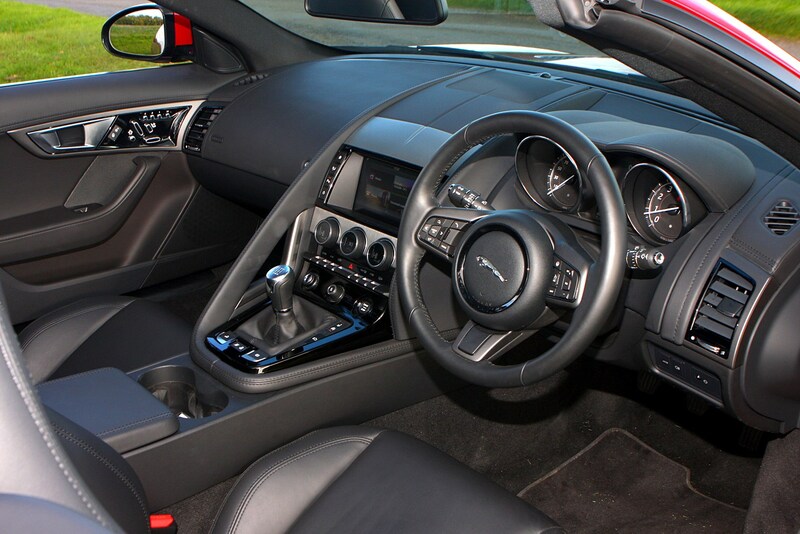 The interior has a real feel of luxury and there is no doubt this is a premium car. 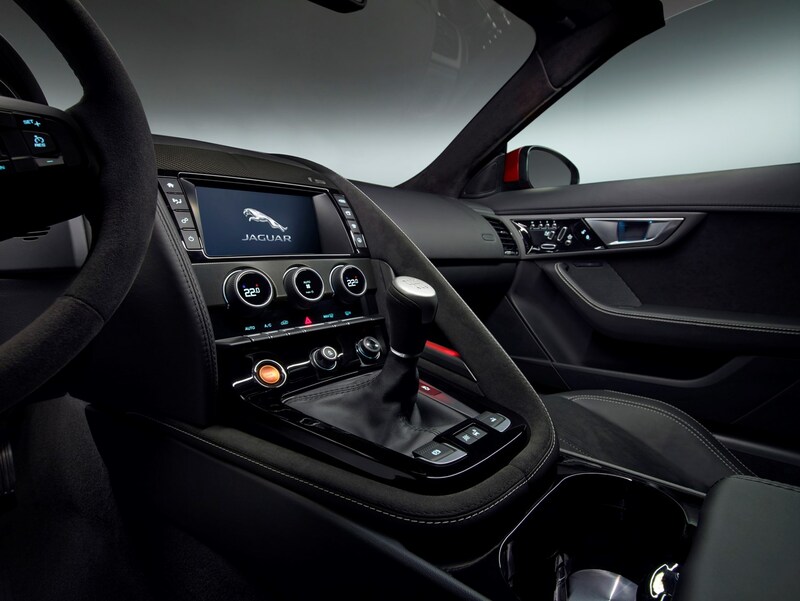 Because Jaguar has designed the interior to be incredibly driver focused it's very easy to spot all the controls you need quickly. 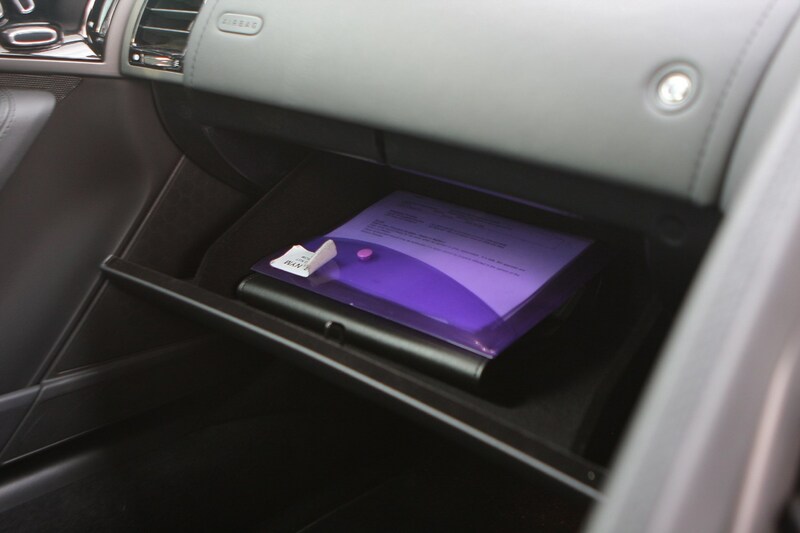 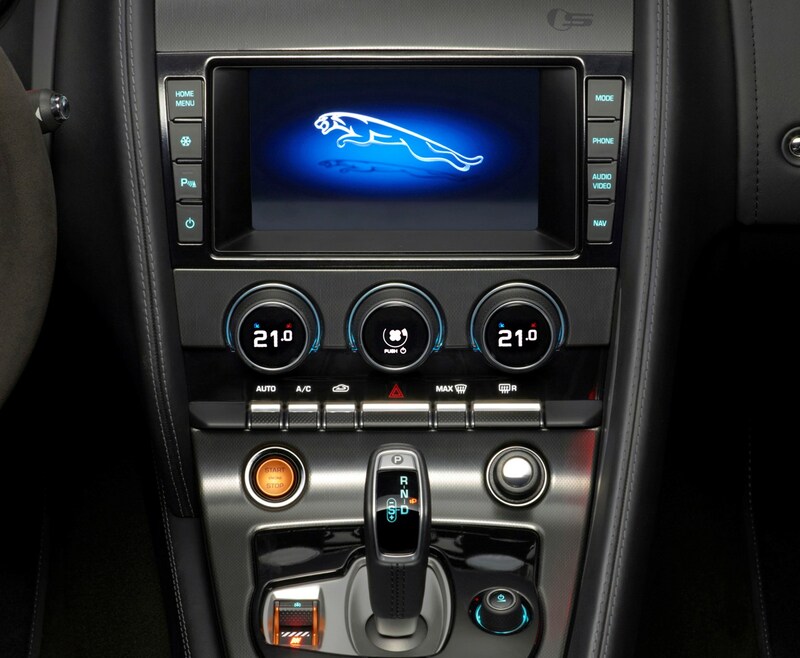 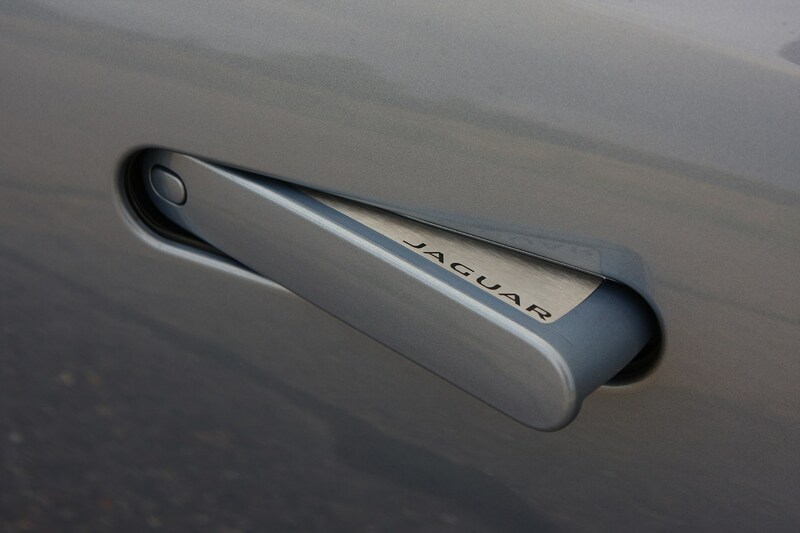 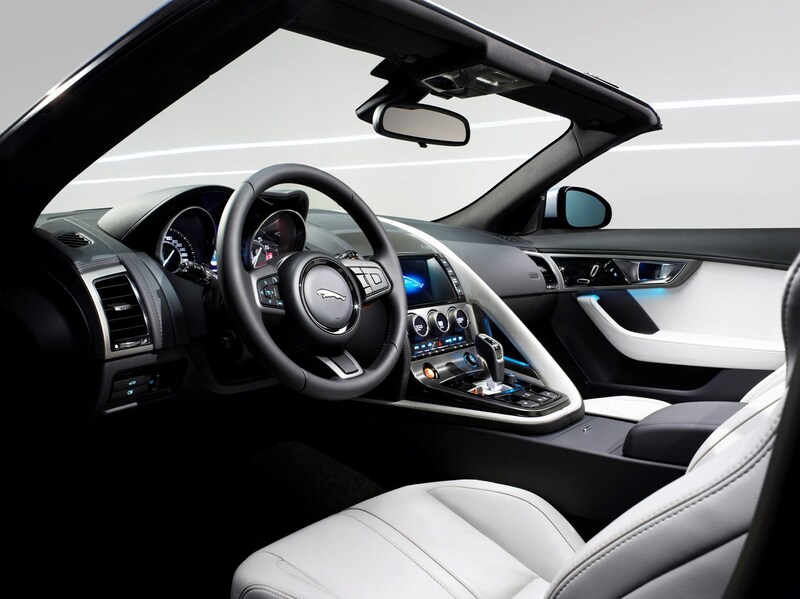 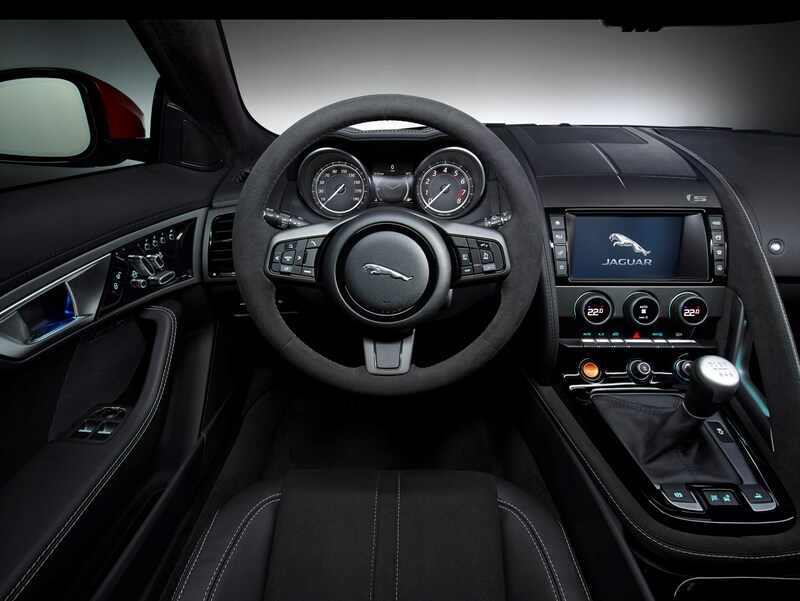 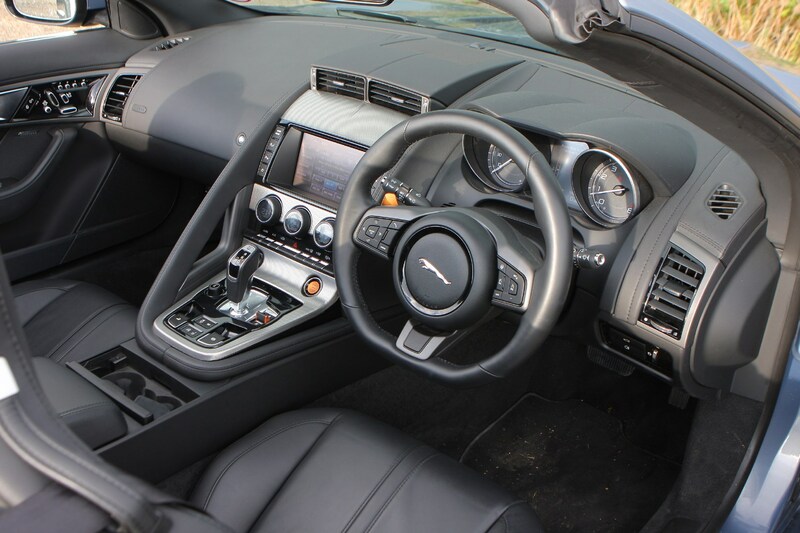 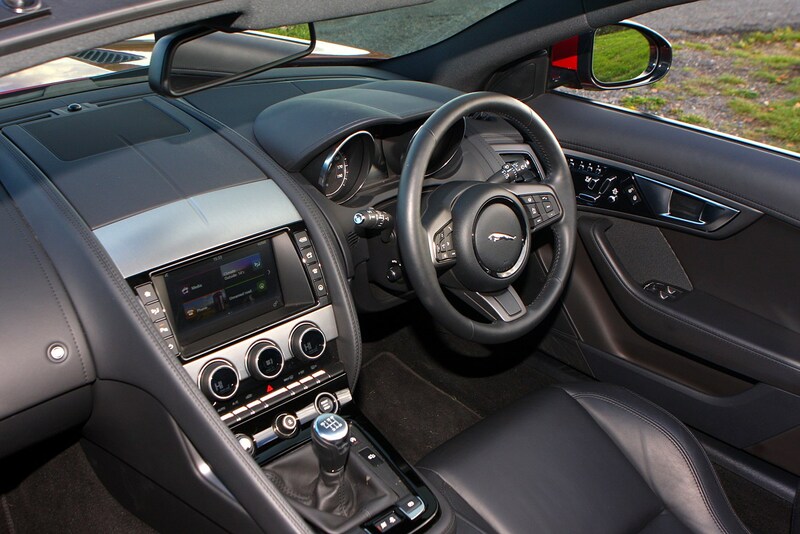 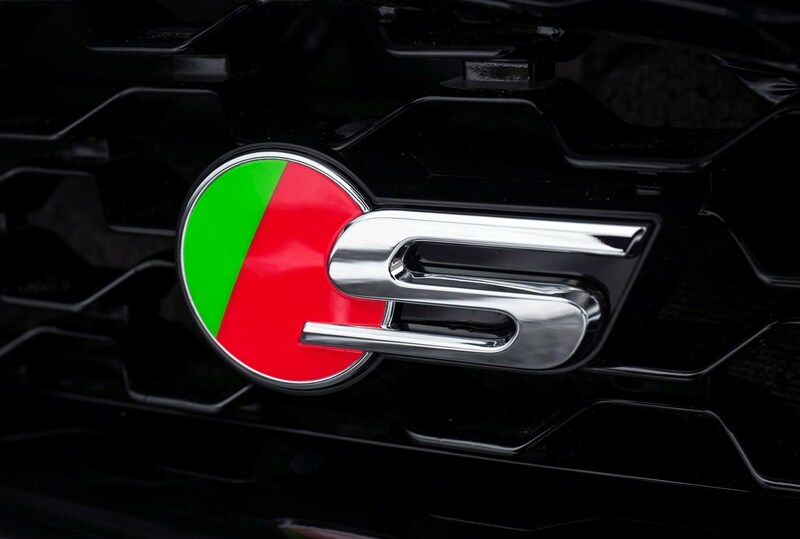 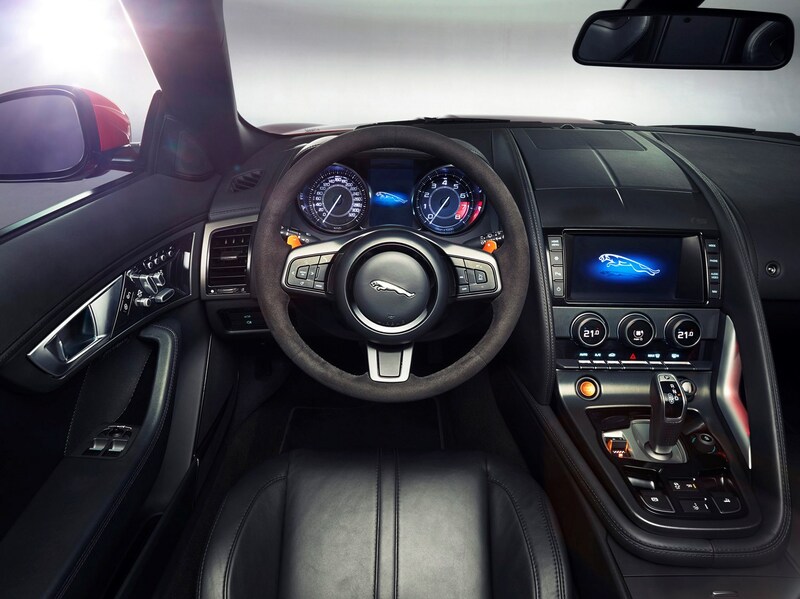 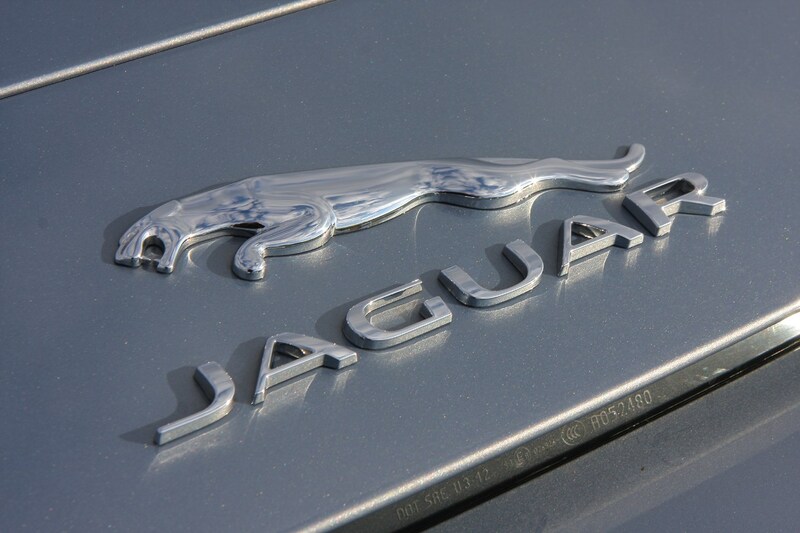 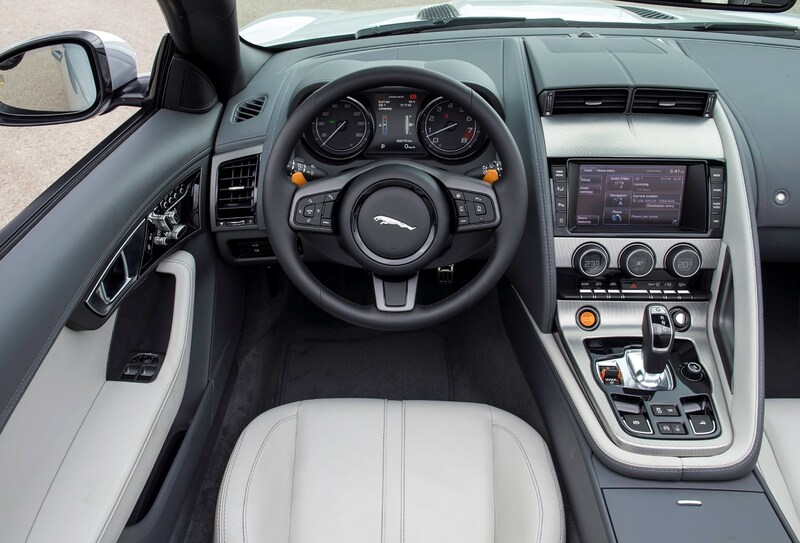 The touch screen is typical Jaguar fare that is easy to understand, though the sat nav can sometimes be slow to update your progress on the map. 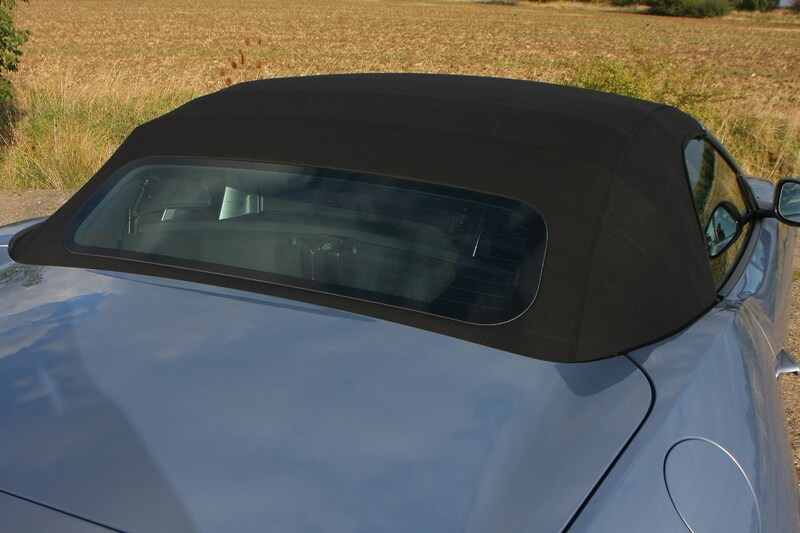 If there's one downside worth noting, it's the amount of buffeting present with the roof lowered. 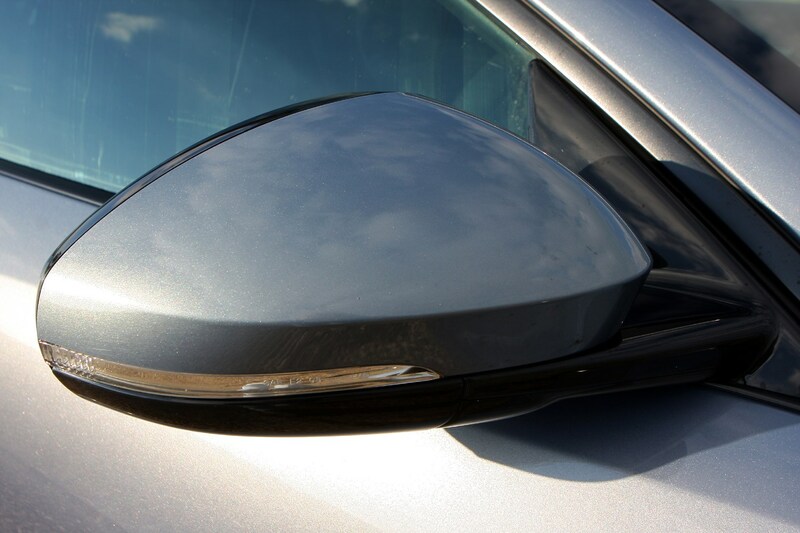 Even average height adults will catch a bit of the wind’s blast, especially as speed edges over 50mph.